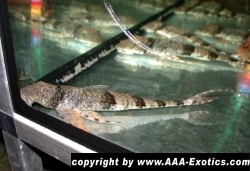 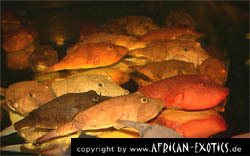 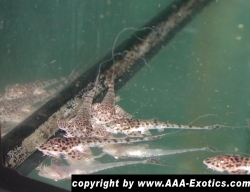 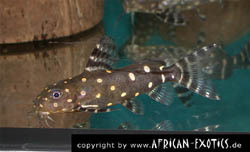 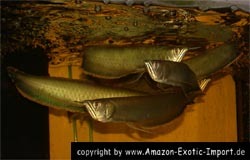 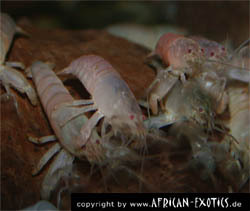 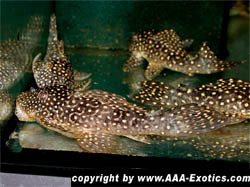 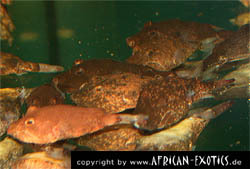 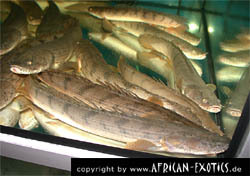 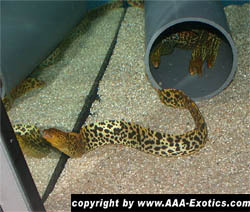 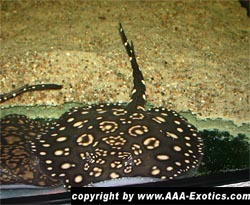 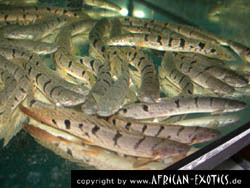 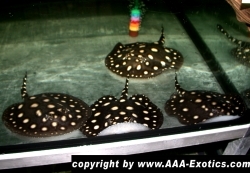 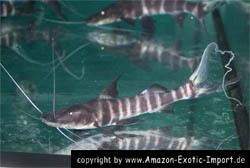 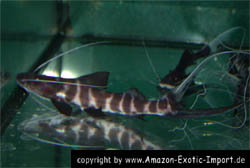 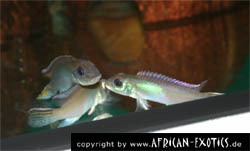 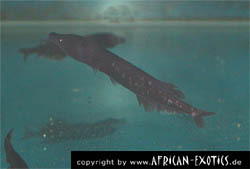 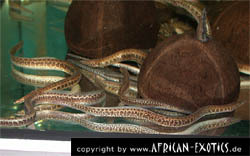 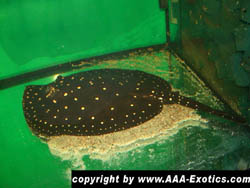 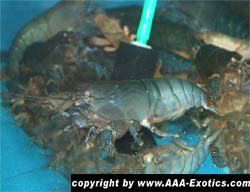 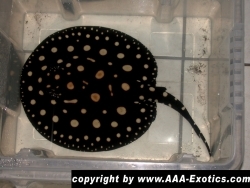 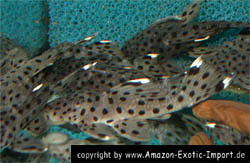 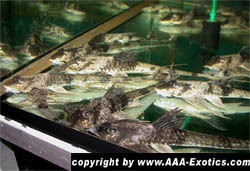 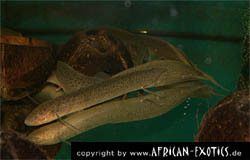 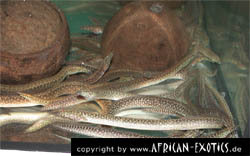 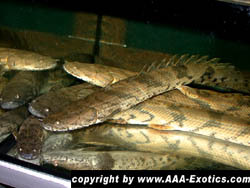 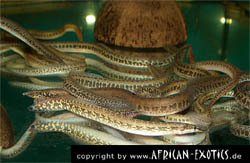 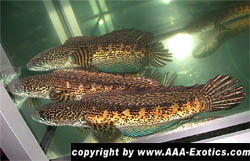 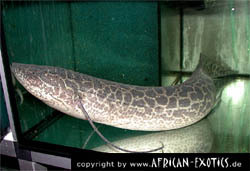 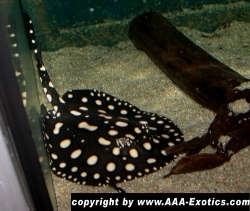 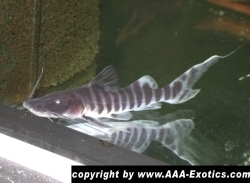 Here you can see an short overview about our new imports from america, africa and asia. 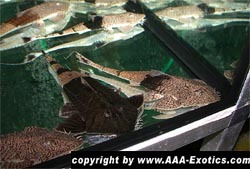 We import frequently from over 10 different countries worldwide. 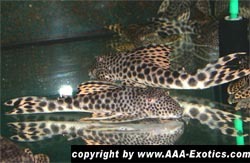 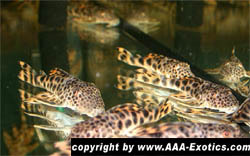 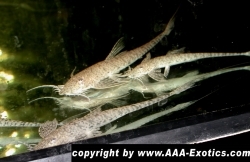 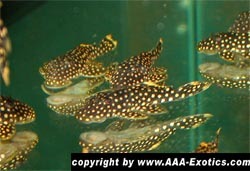 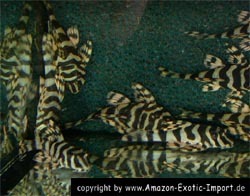 To get a complete view on our current stock please see our stocklist. 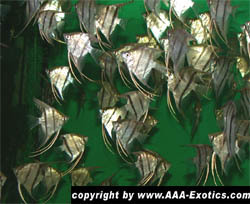 If you wish to talk to us - please call: 0049 8035 968 905 or ( mobile number ): 0049 171 9565 772. 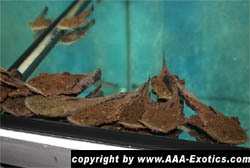 To send a fax to us please choose our faxnumber: 0049 8035 968 939. 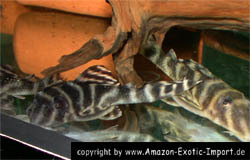 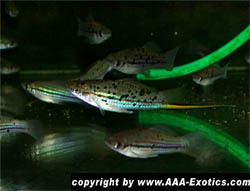 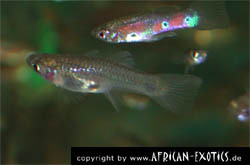 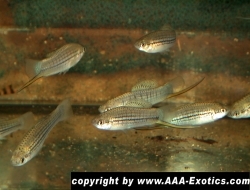 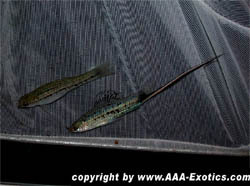 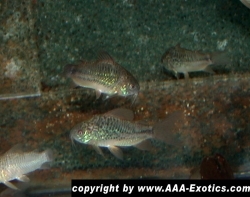 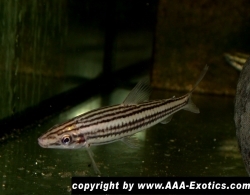 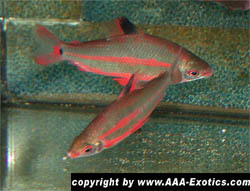 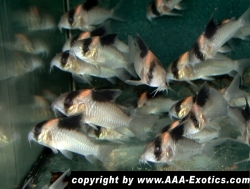 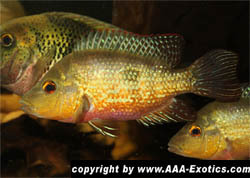 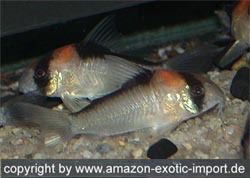 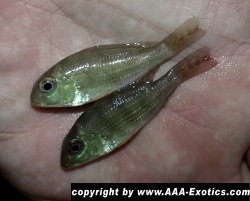 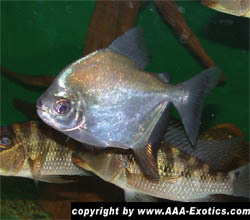 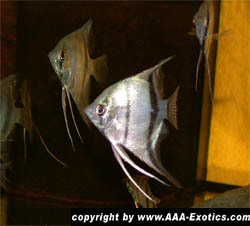 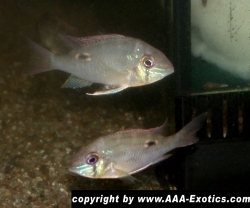 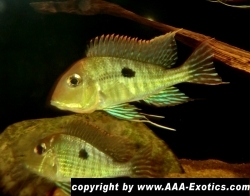 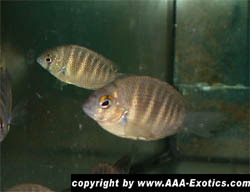 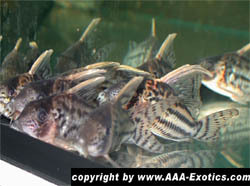 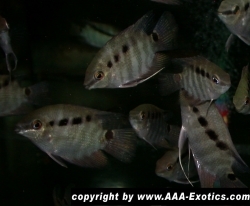 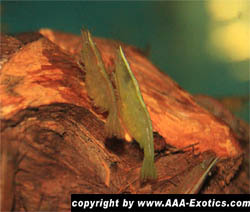 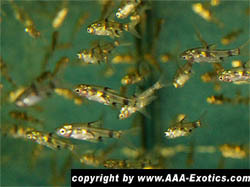 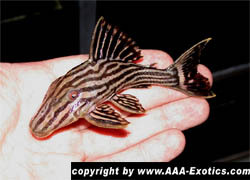 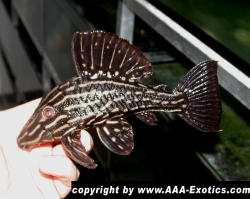 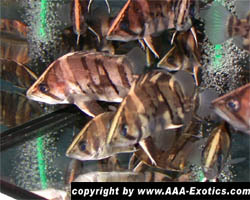 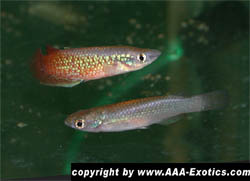 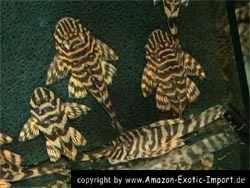 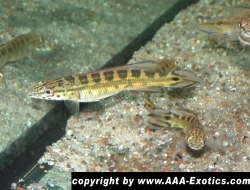 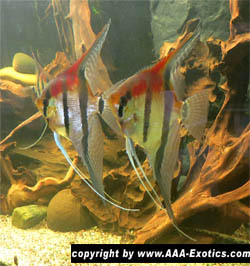 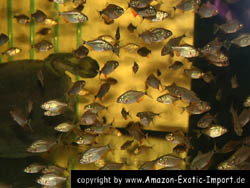 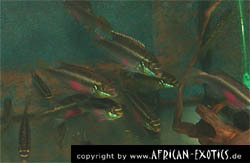 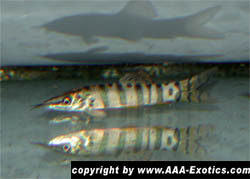 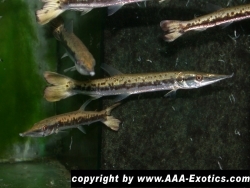 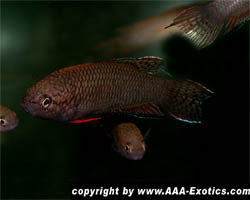 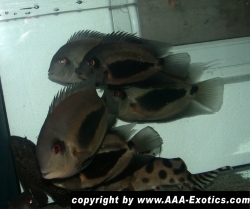 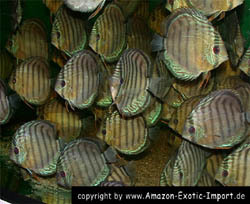 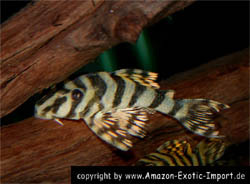 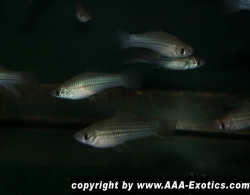 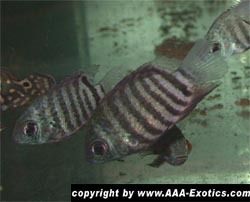 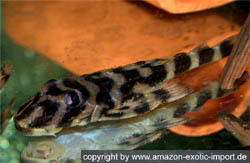 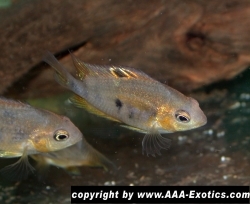 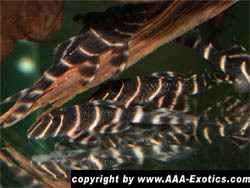 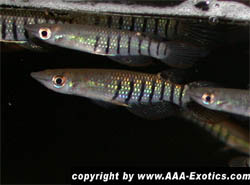 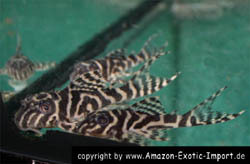 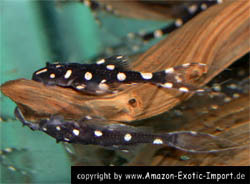 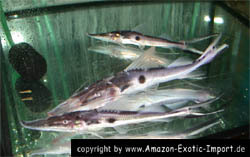 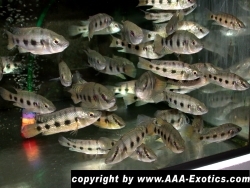 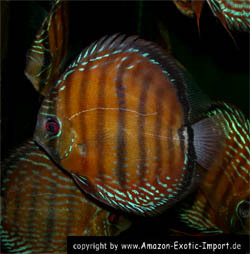 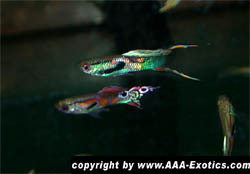 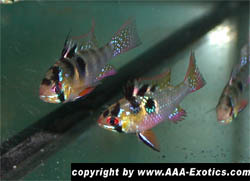 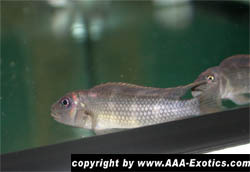 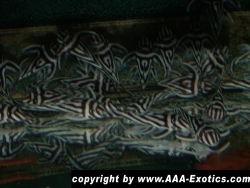 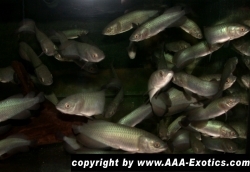 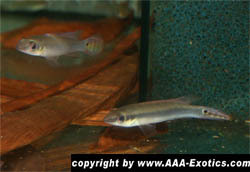 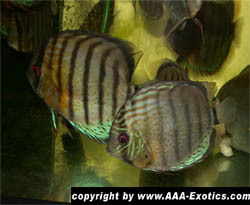 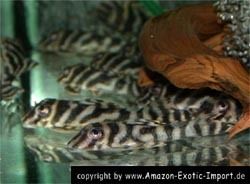 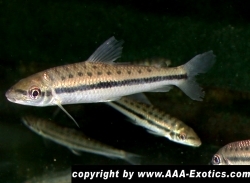 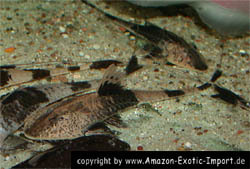 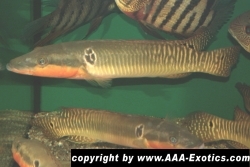 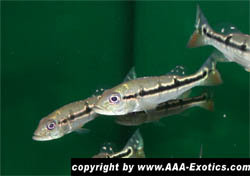 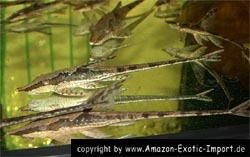 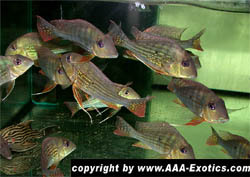 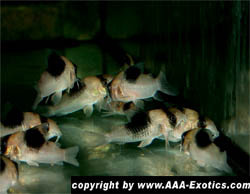 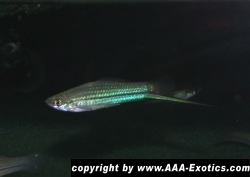 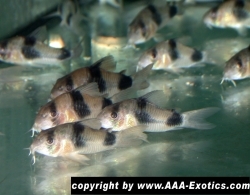 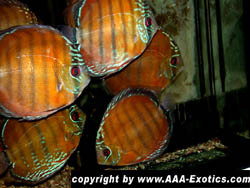 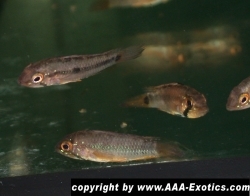 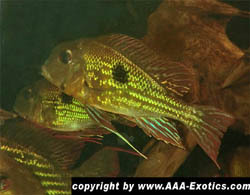 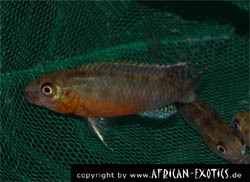 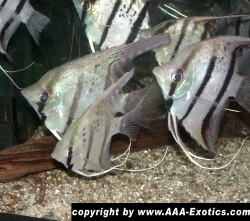 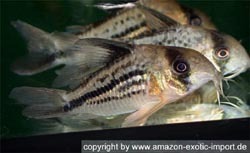 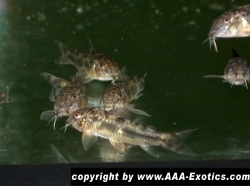 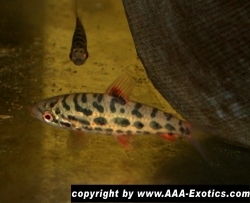 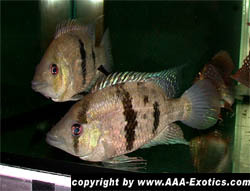 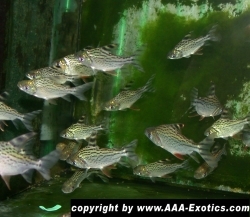 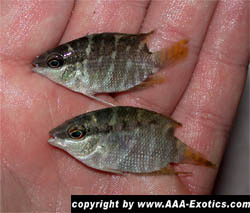 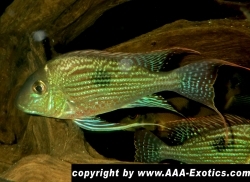 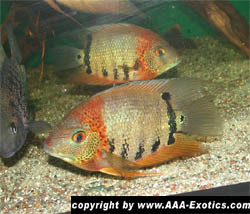 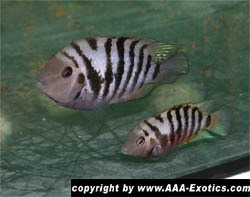 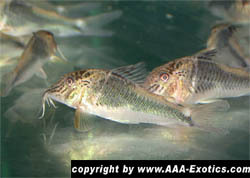 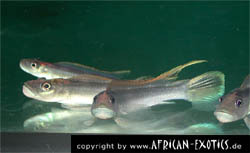 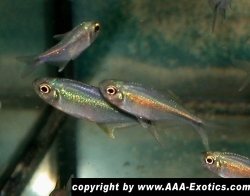 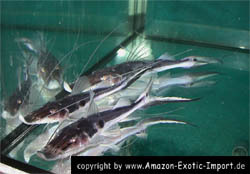 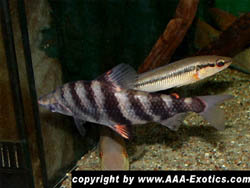 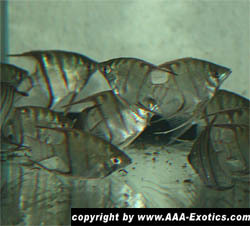 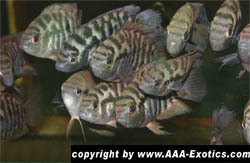 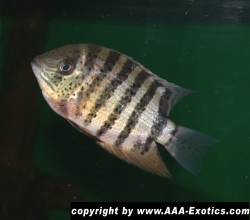 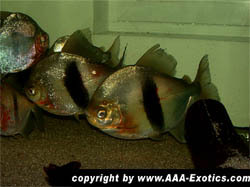 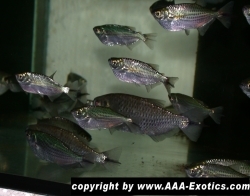 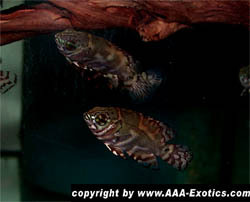 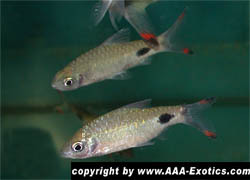 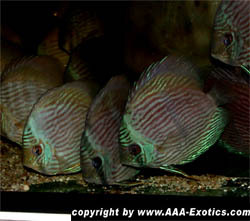 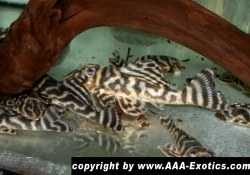 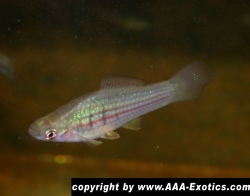 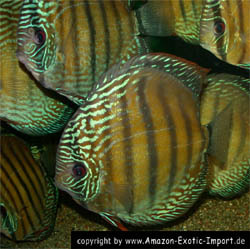 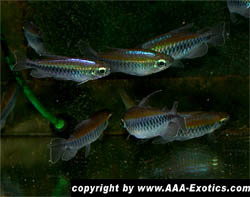 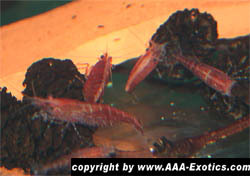 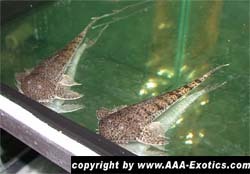 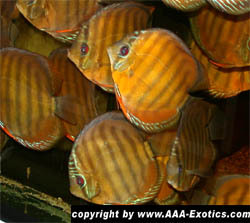 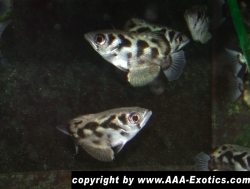 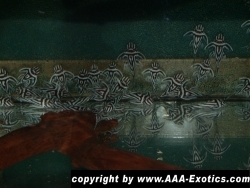 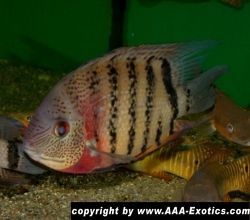 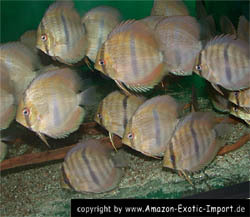 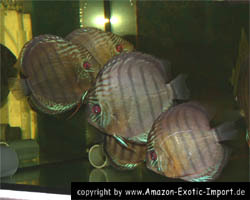 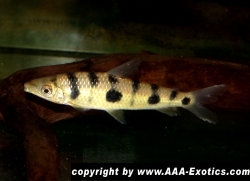 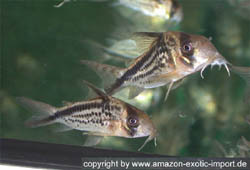 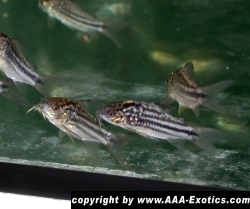 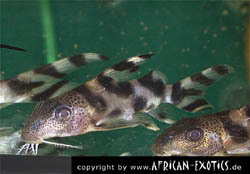 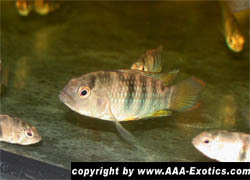 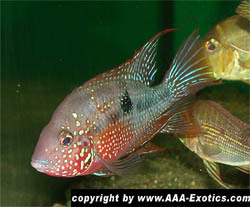 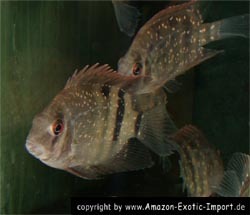 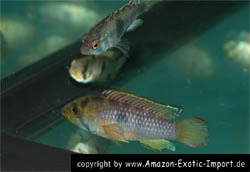 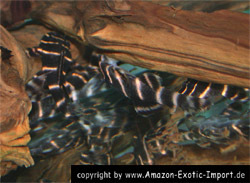 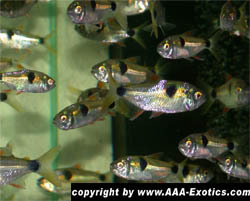 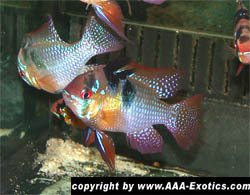 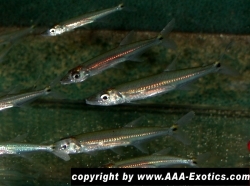 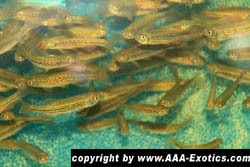 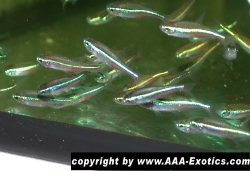 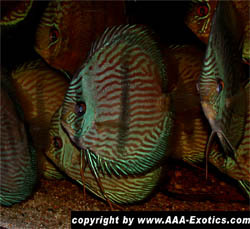 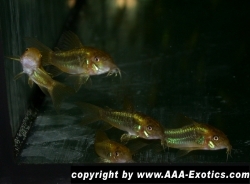 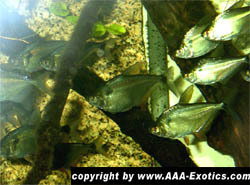 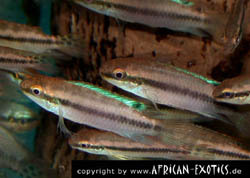 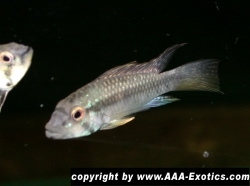 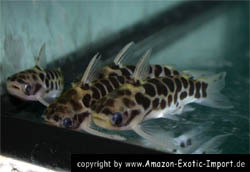 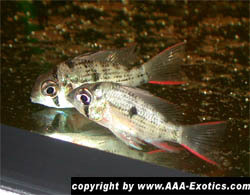 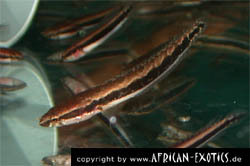 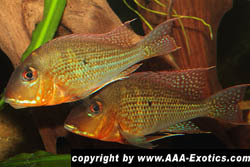 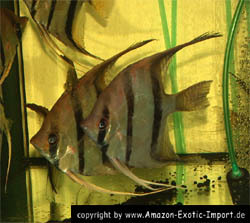 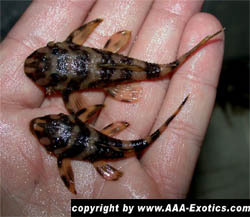 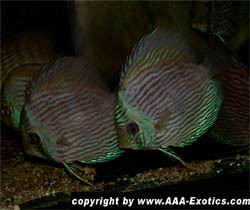 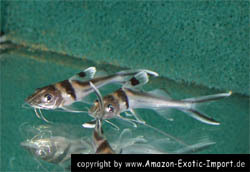 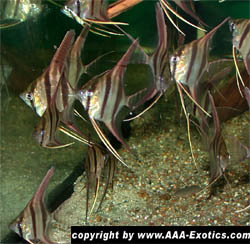 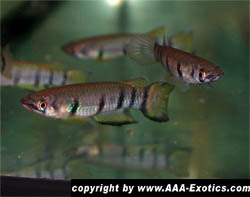 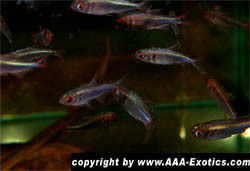 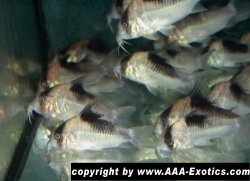 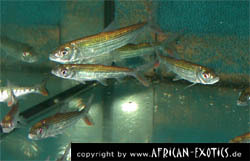 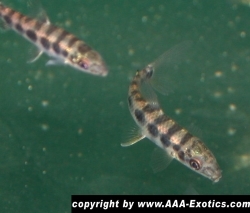 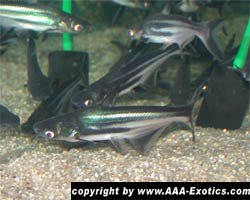 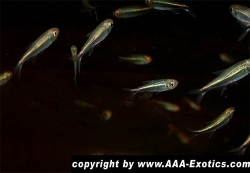 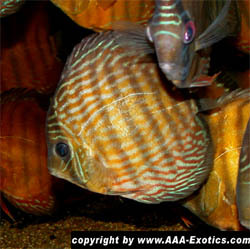 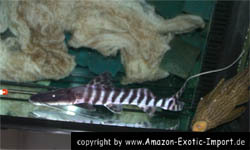 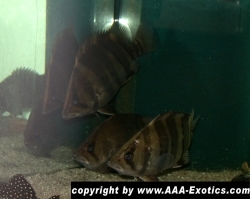 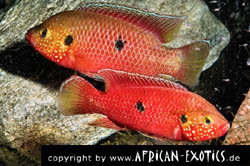 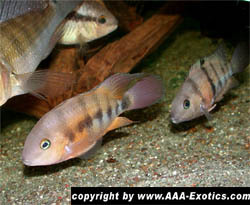 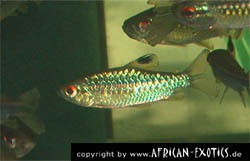 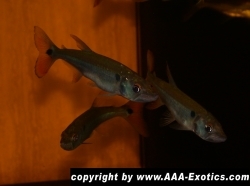 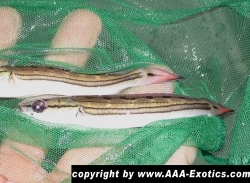 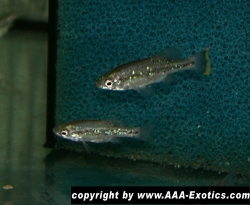 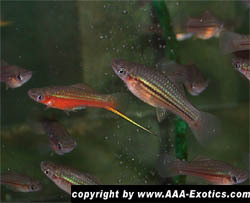 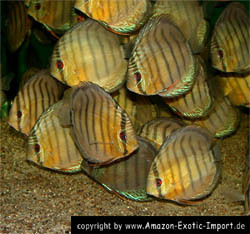 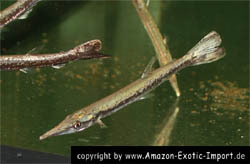 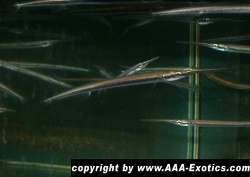 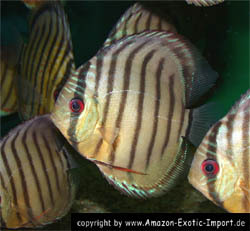 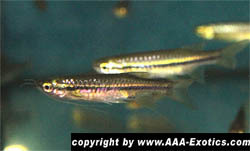 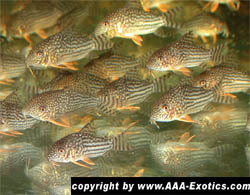 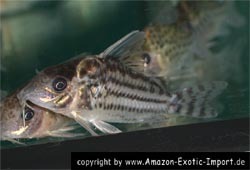 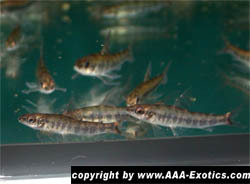 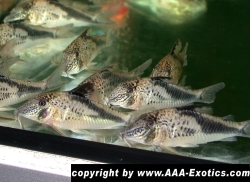 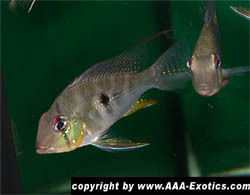 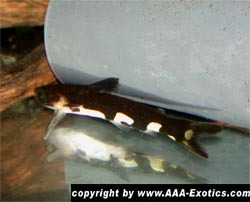 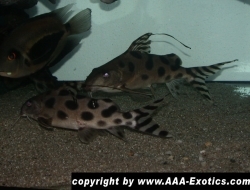 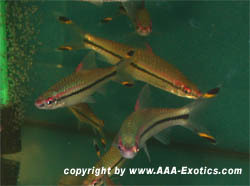 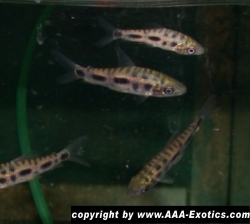 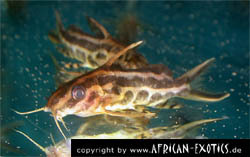 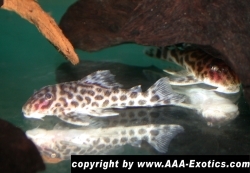 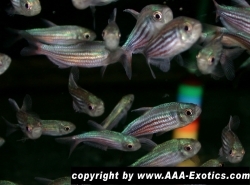 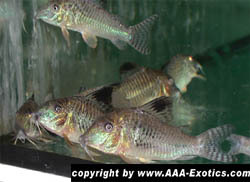 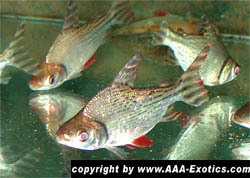 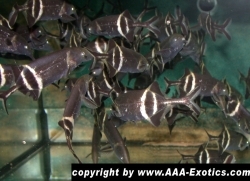 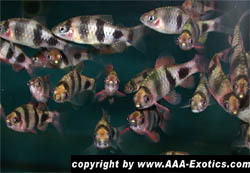 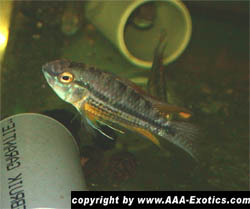 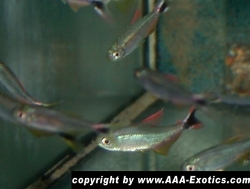 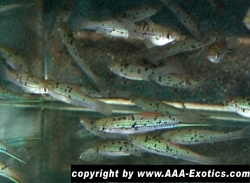 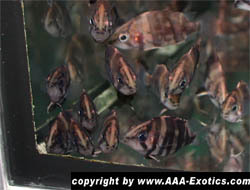 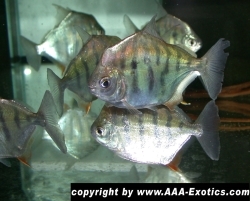 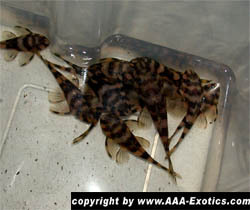 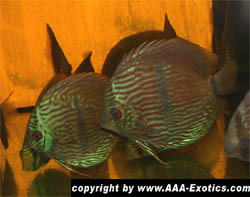 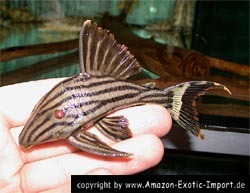 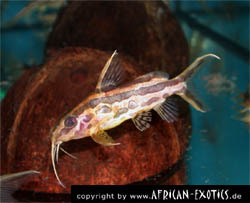 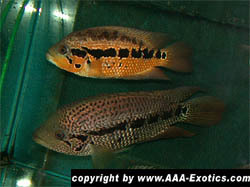 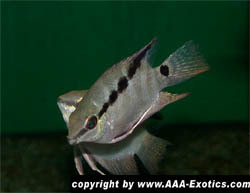 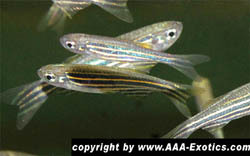 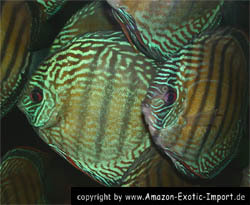 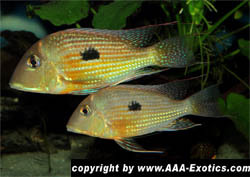 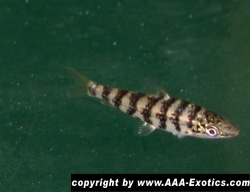 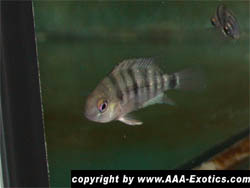 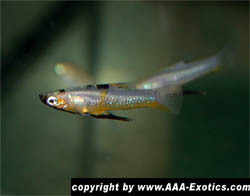 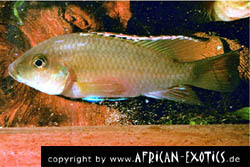 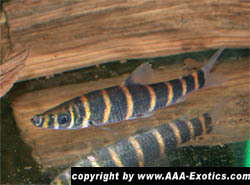 Cryptoheros altoflavus Crenicichla zebrina - Pair! 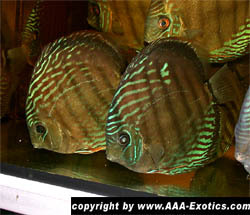 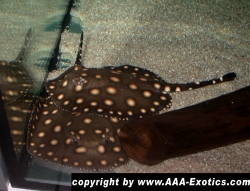 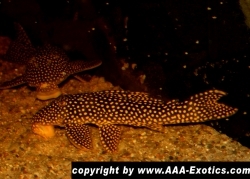 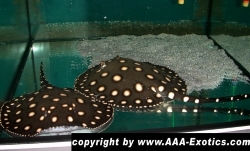 Petenia splendida - Pair! 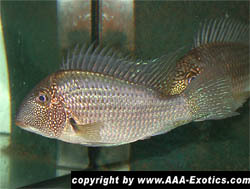 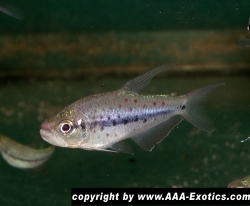 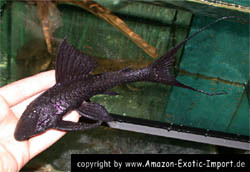 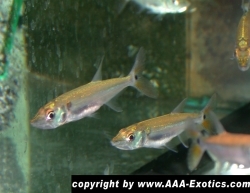 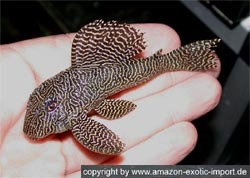 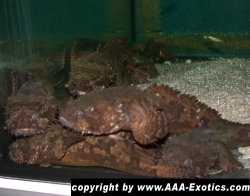 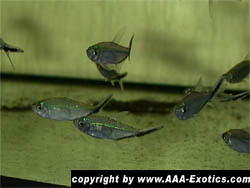 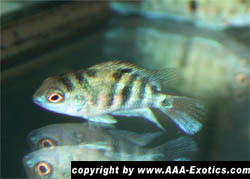 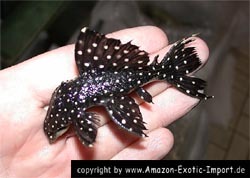 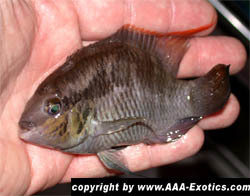 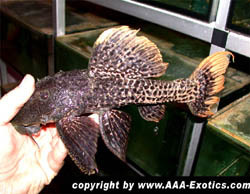 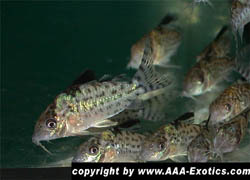 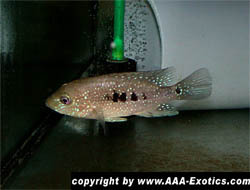 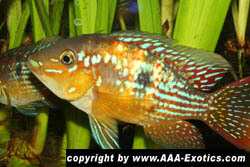 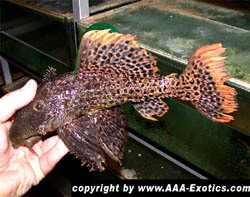 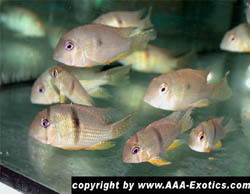 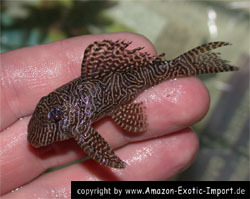 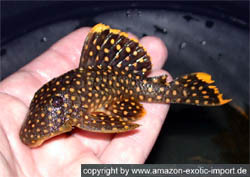 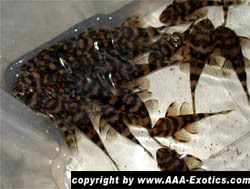 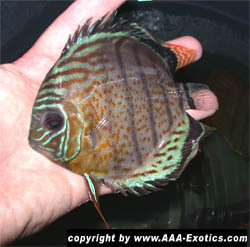 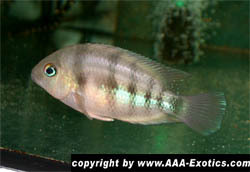 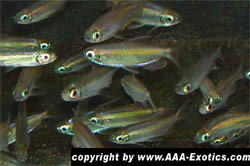 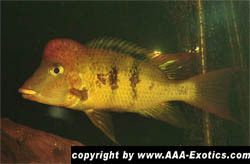 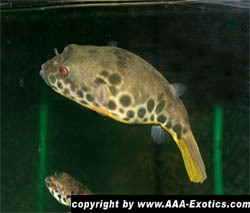 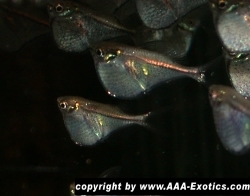 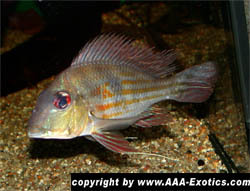 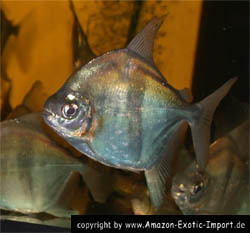 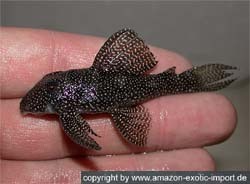 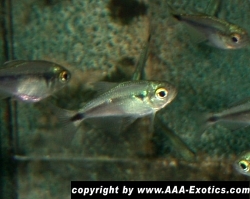 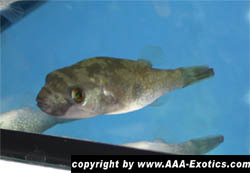 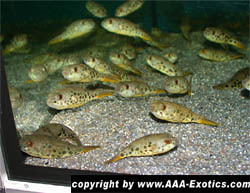 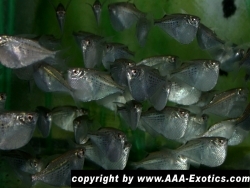 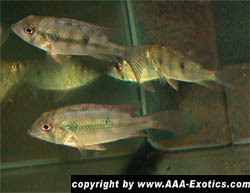 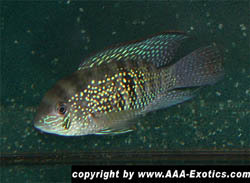 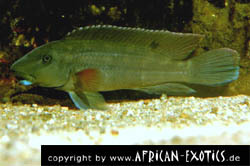 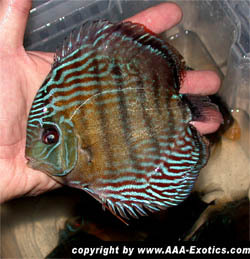 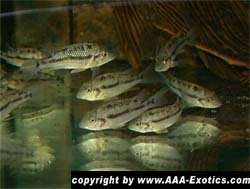 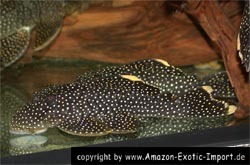 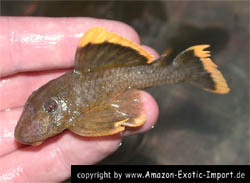 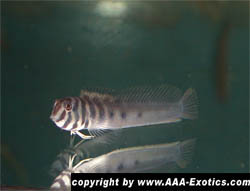 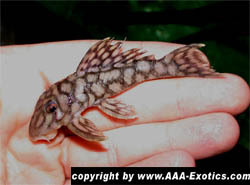 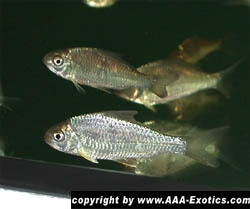 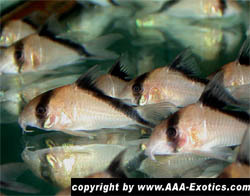 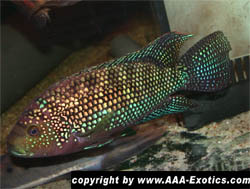 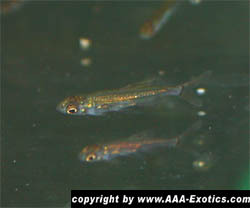 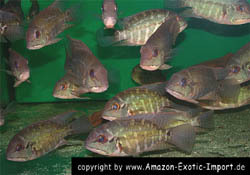 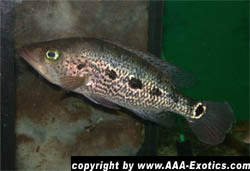 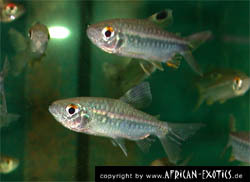 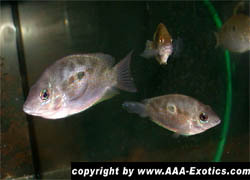 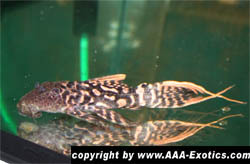 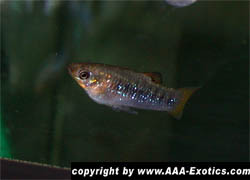 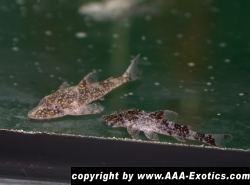 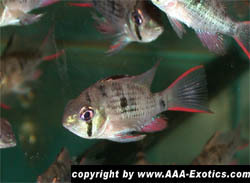 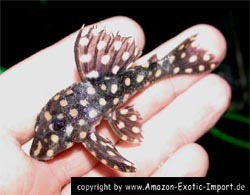 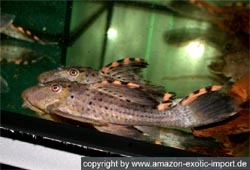 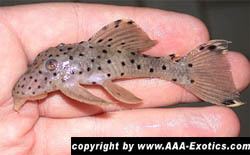 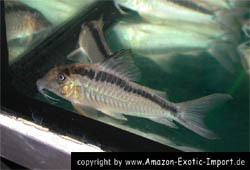 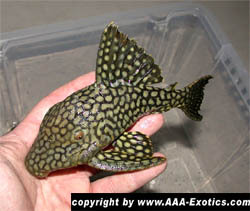 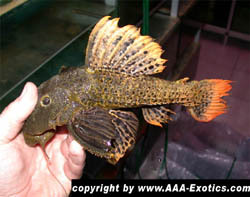 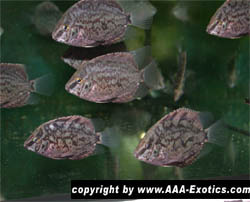 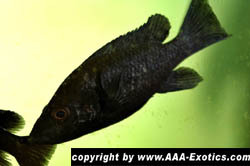 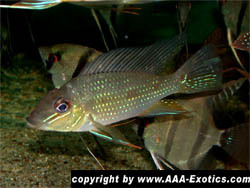 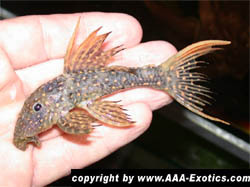 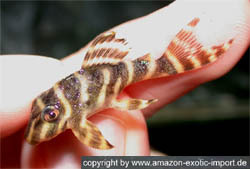 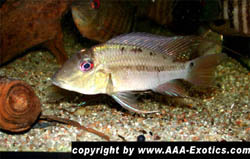 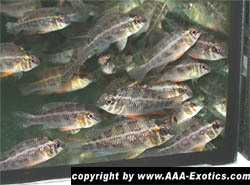 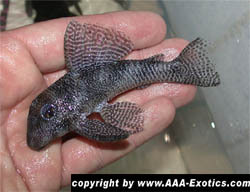 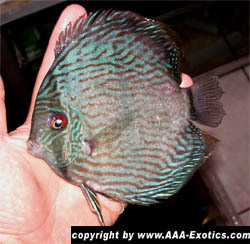 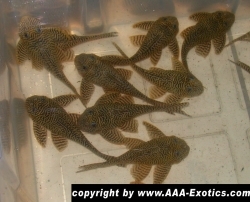 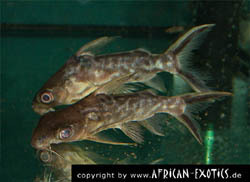 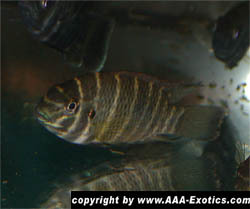 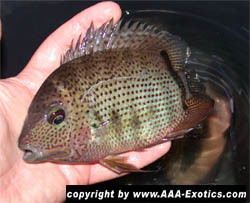 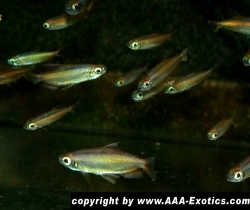 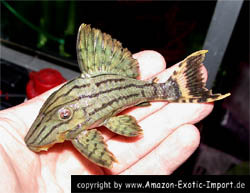 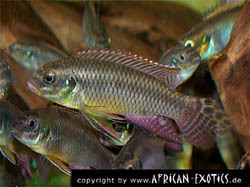 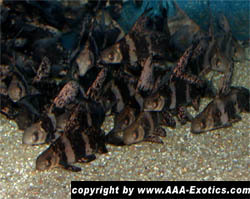 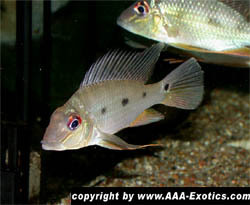 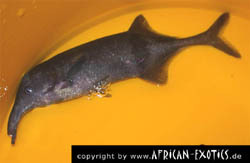 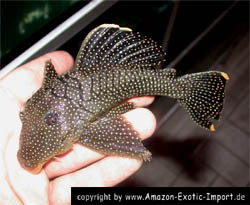 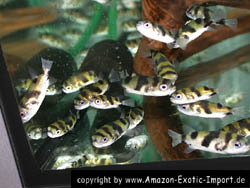 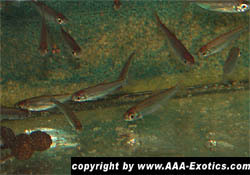 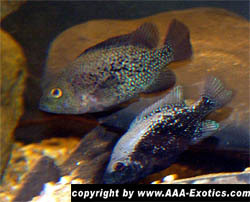 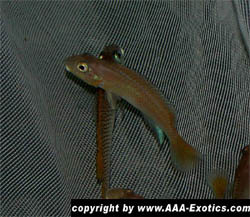 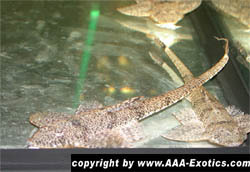 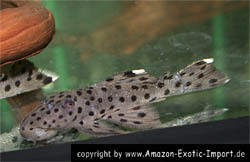 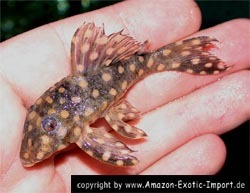 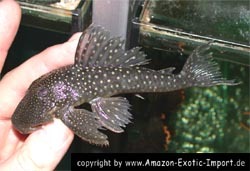 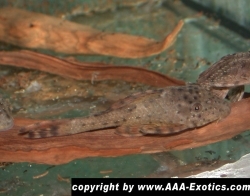 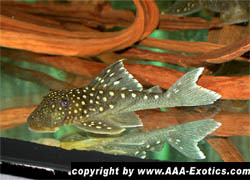 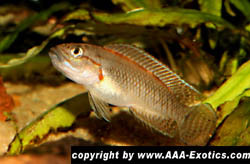 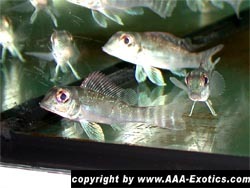 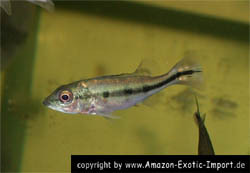 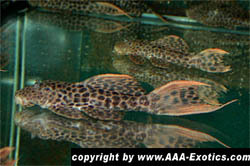 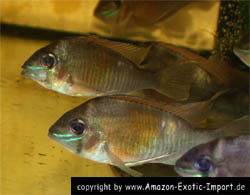 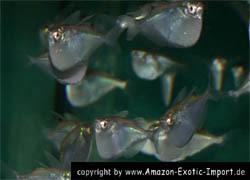 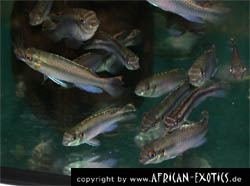 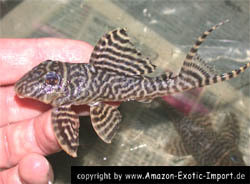 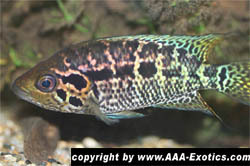 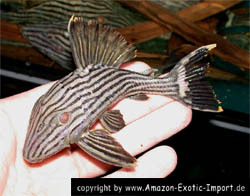 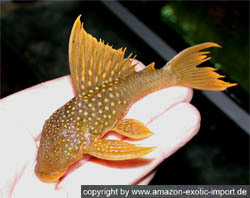 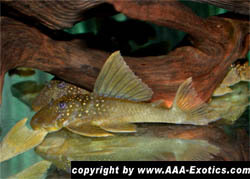 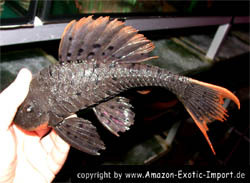 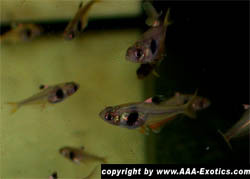 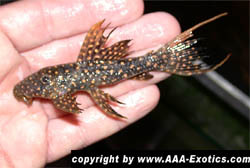 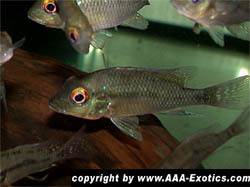 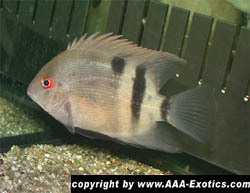 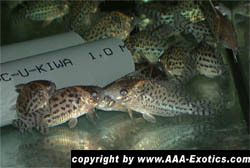 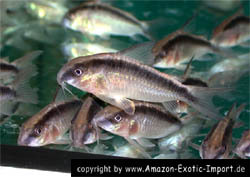 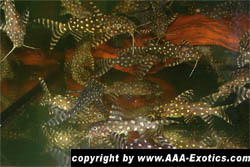 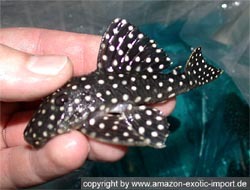 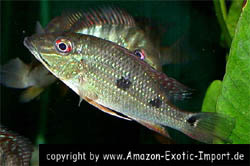 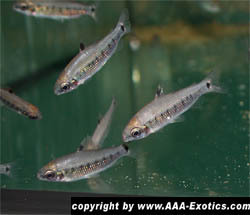 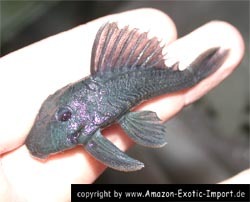 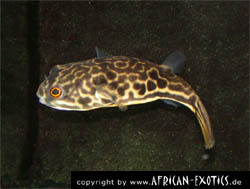 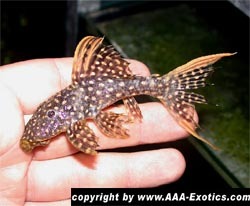 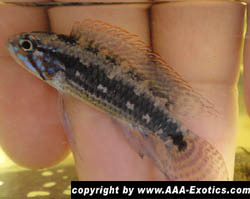 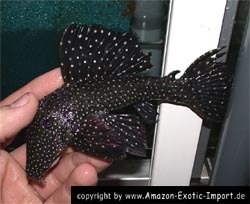 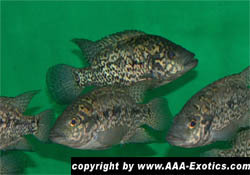 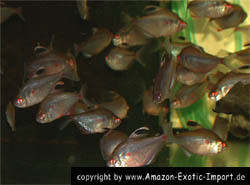 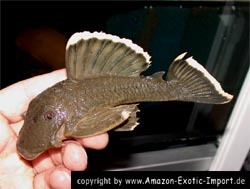 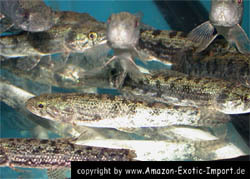 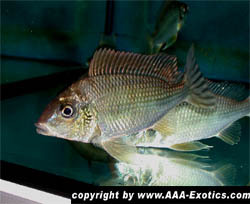 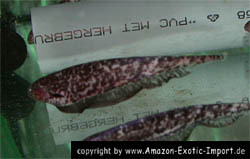 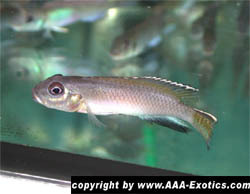 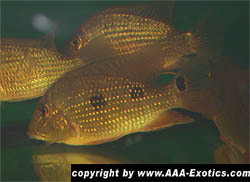 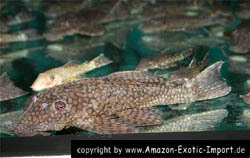 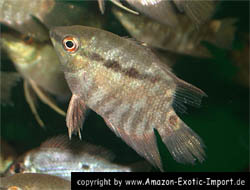 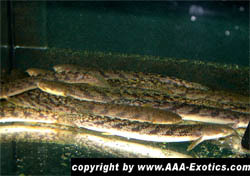 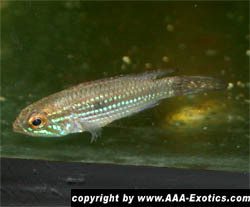 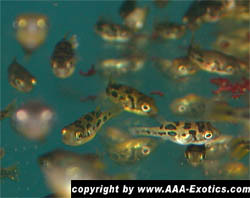 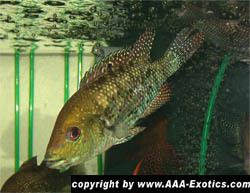 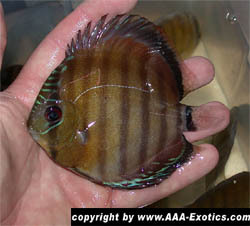 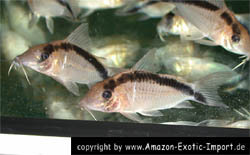 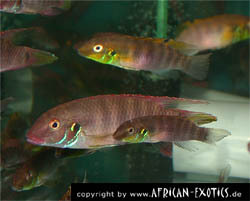 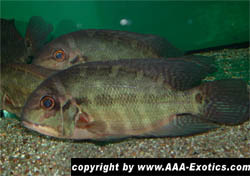 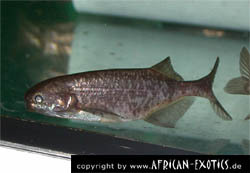 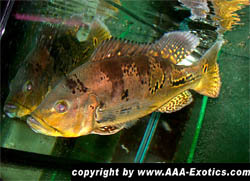 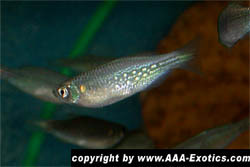 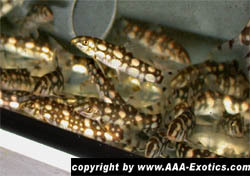 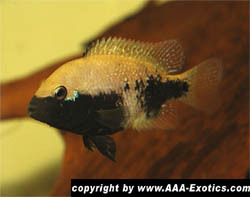 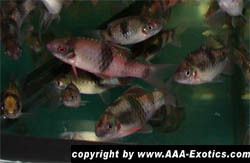 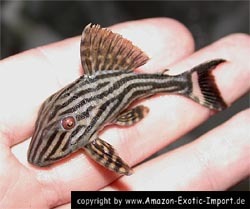 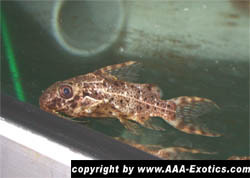 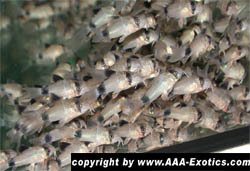 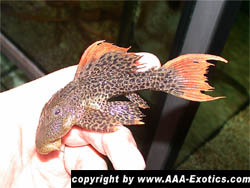 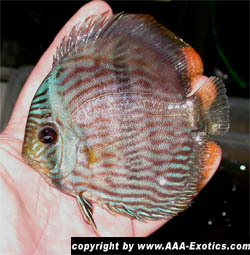 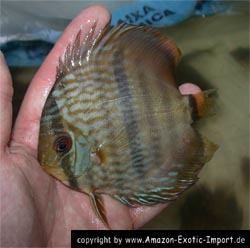 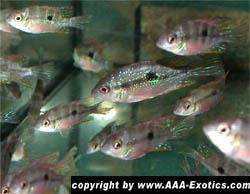 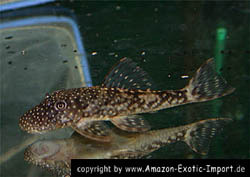 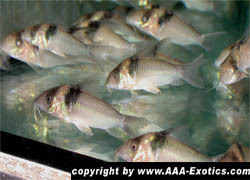 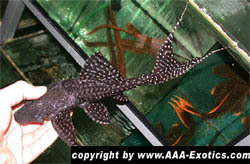 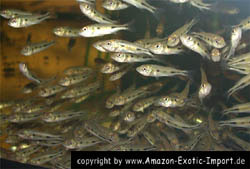 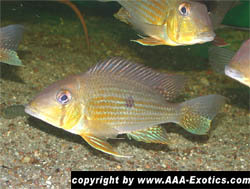 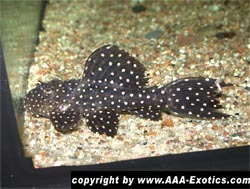 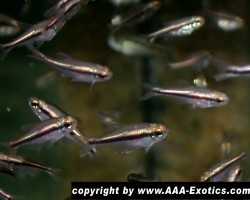 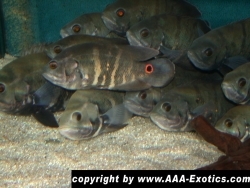 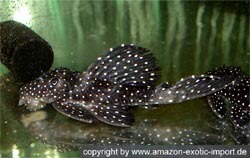 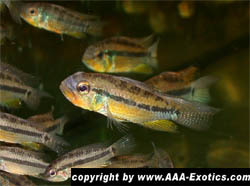 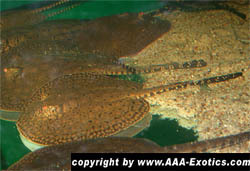 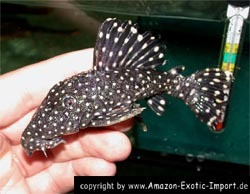 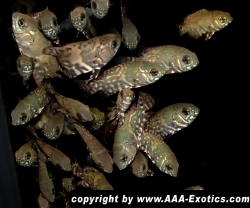 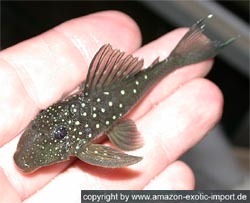 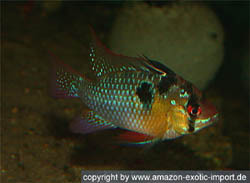 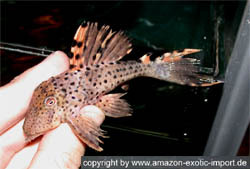 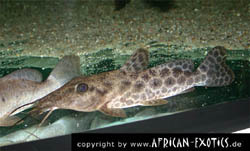 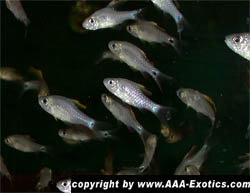 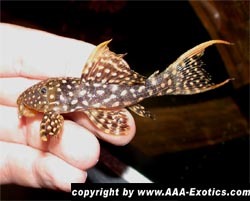 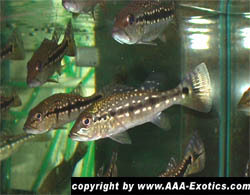 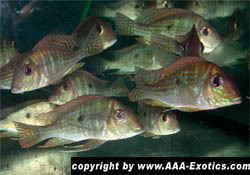 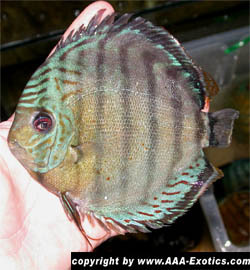 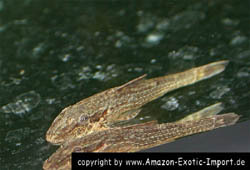 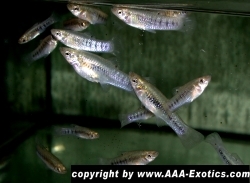 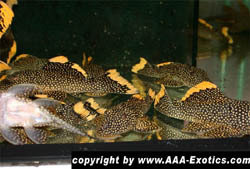 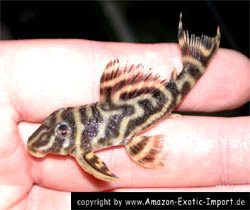 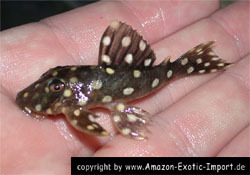 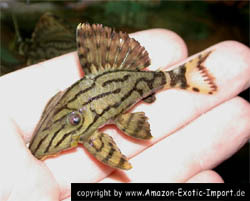 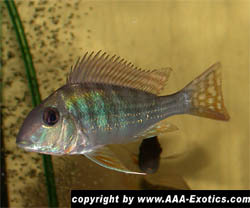 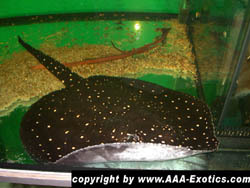 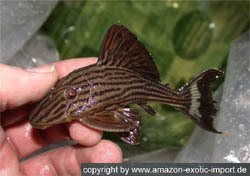 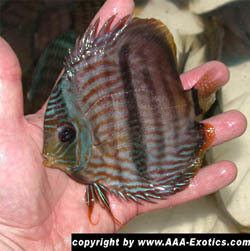 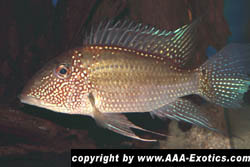 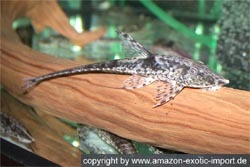 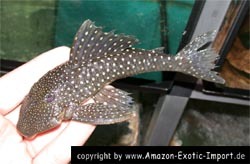 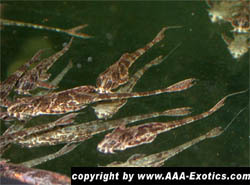 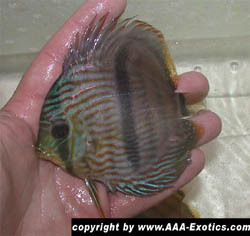 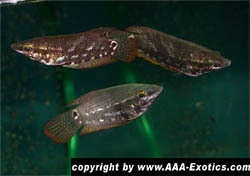 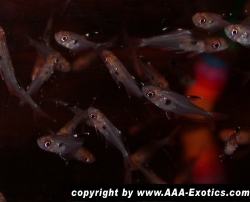 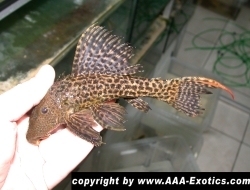 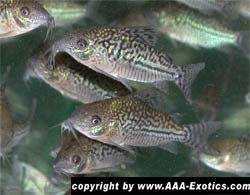 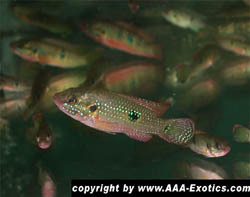 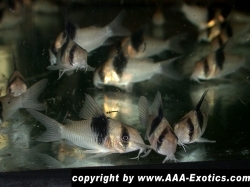 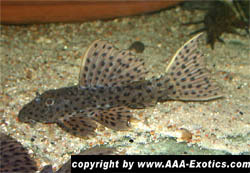 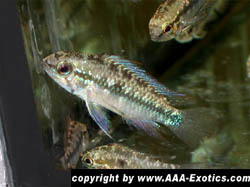 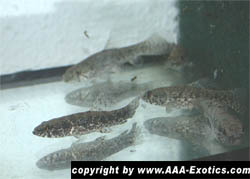 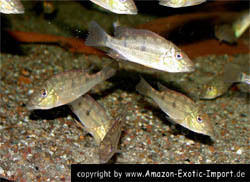 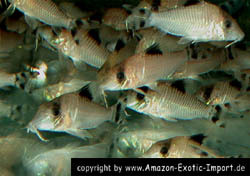 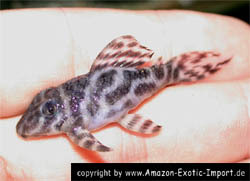 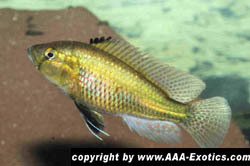 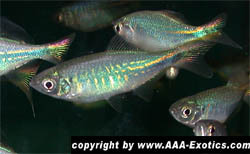 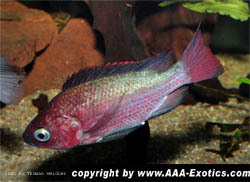 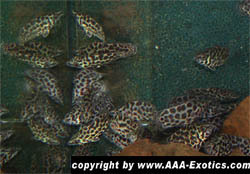 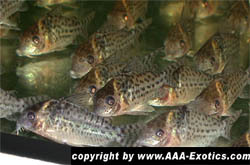 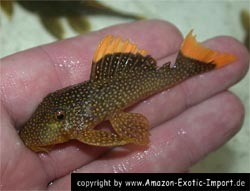 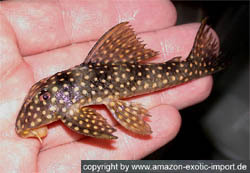 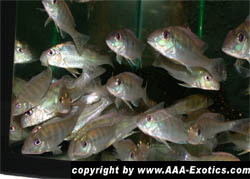 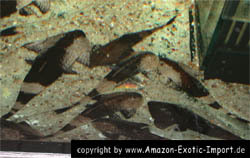 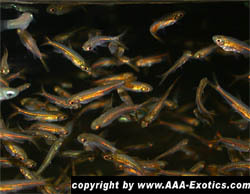 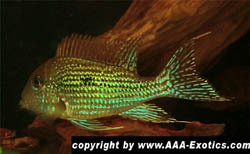 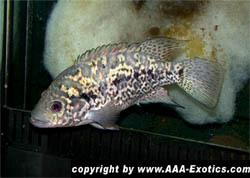 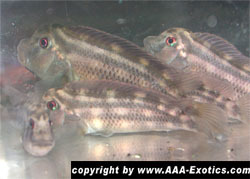 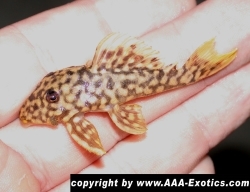 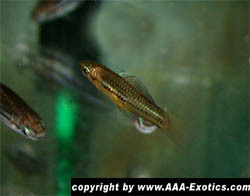 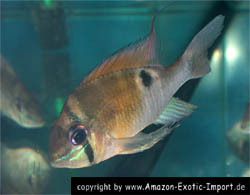 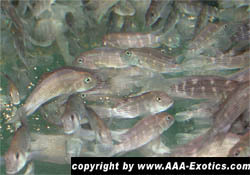 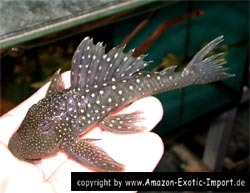 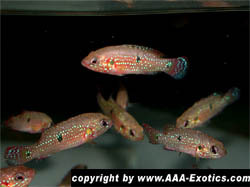 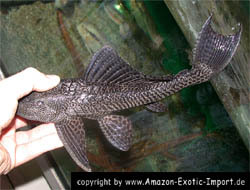 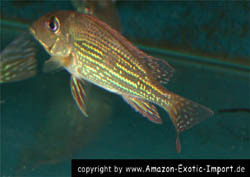 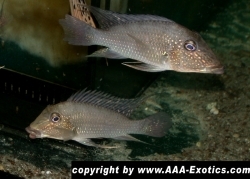 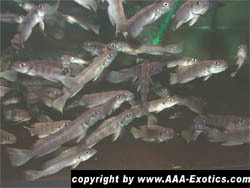 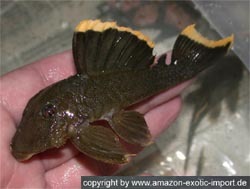 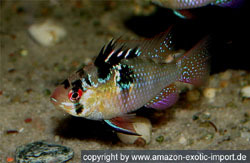 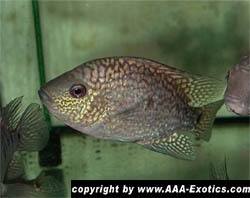 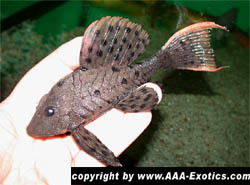 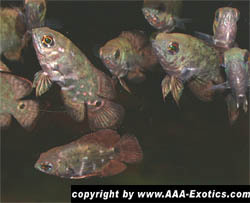 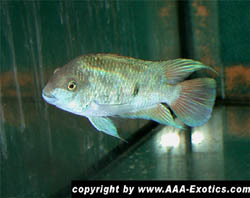 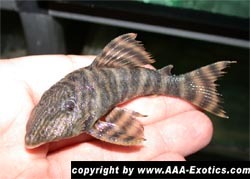 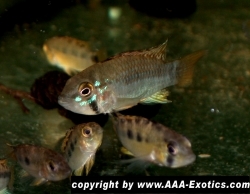 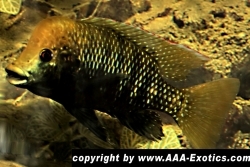 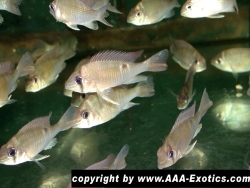 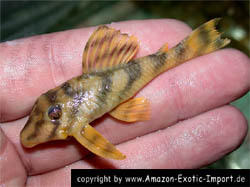 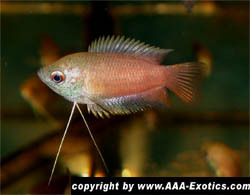 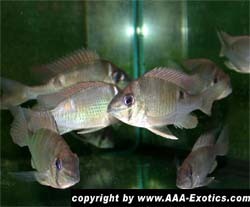 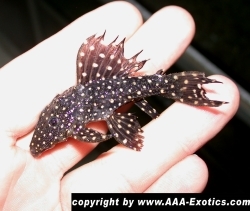 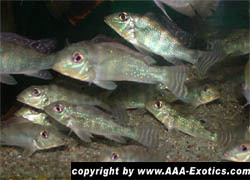 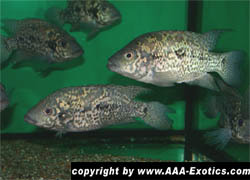 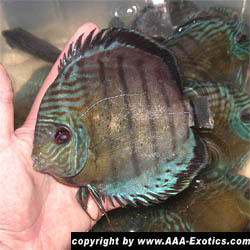 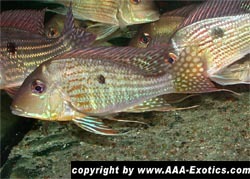 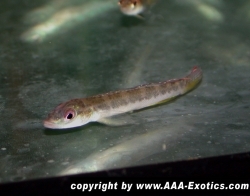 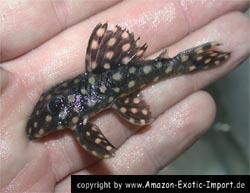 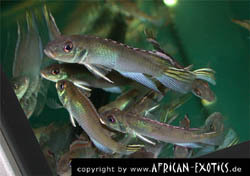 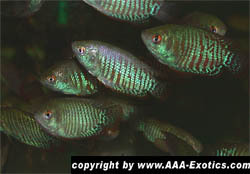 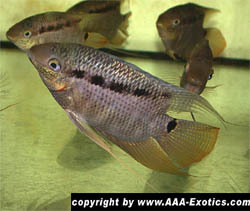 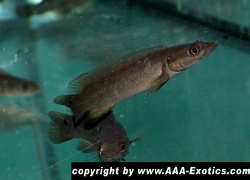 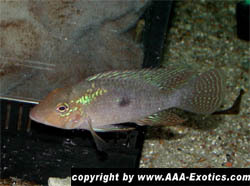 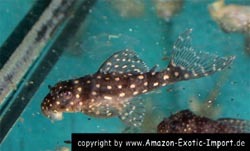 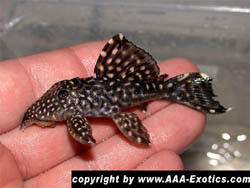 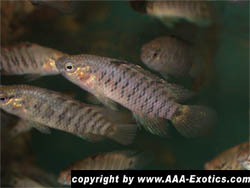 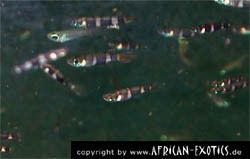 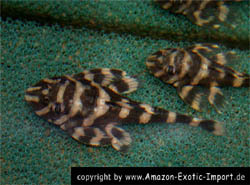 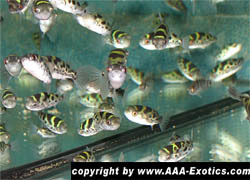 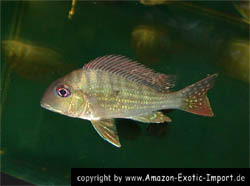 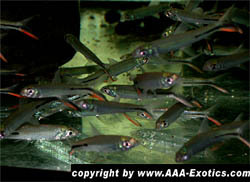 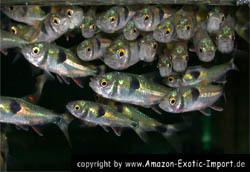 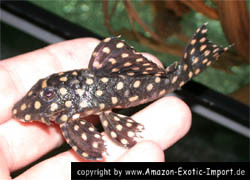 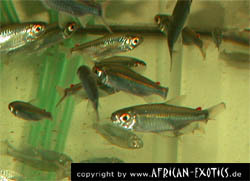 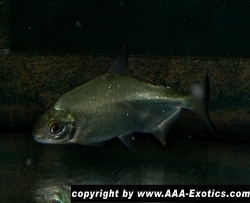 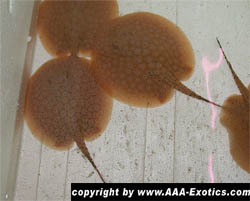 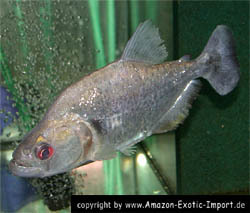 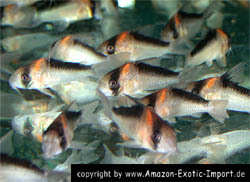 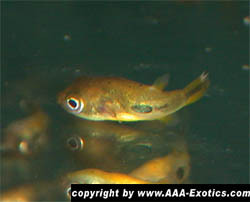 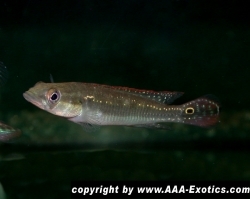 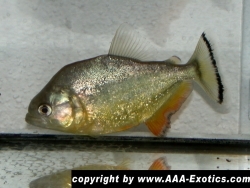 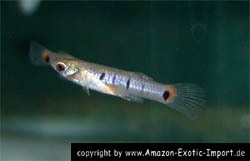 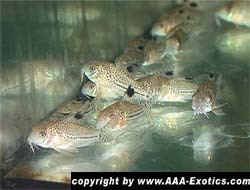 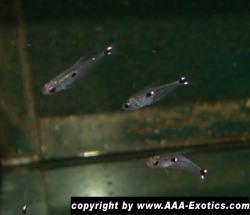 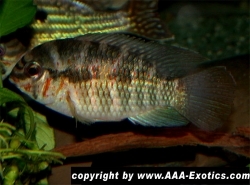 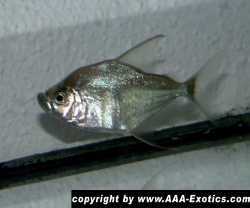 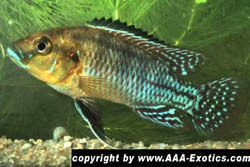 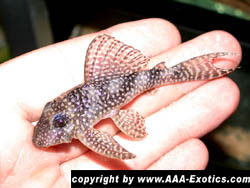 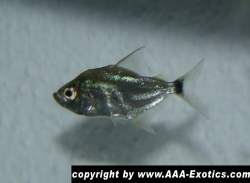 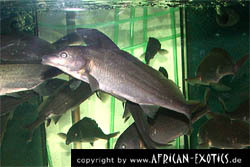 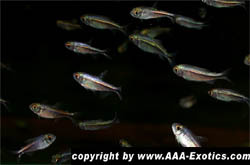 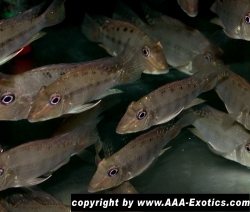 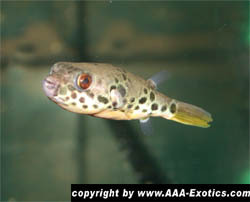 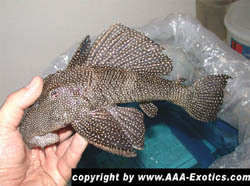 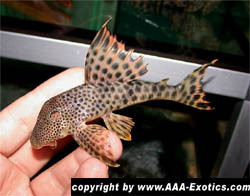 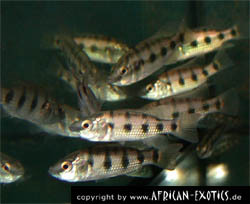 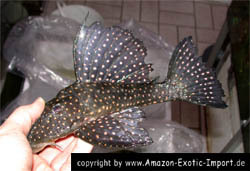 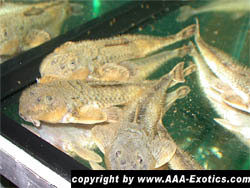 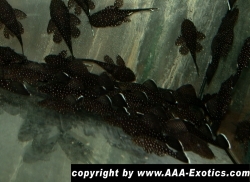 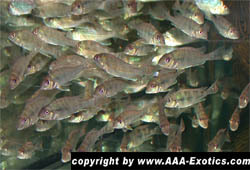 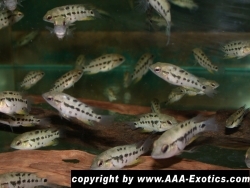 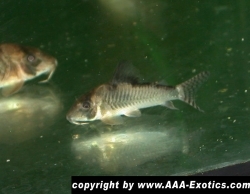 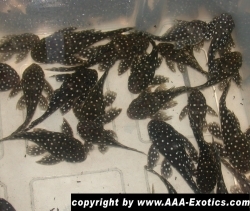 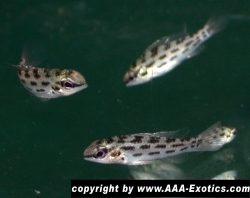 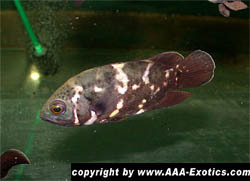 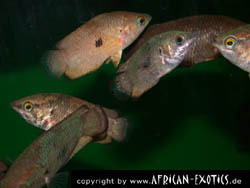 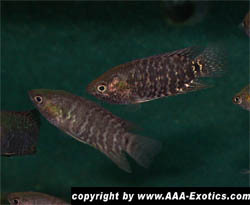 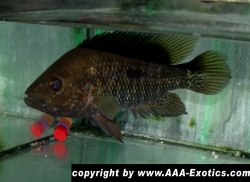 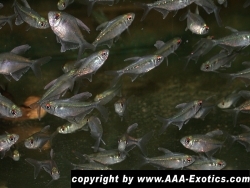 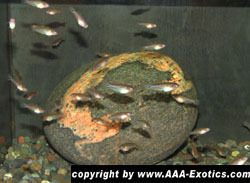 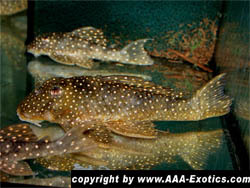 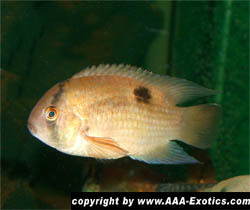 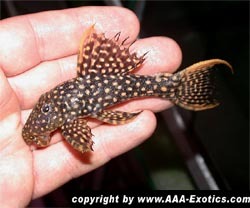 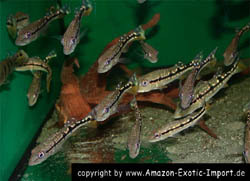 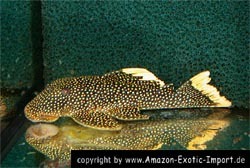 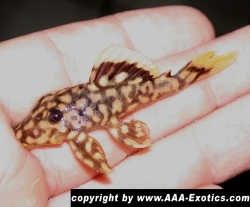 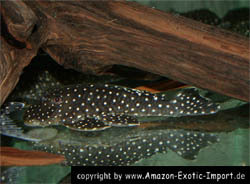 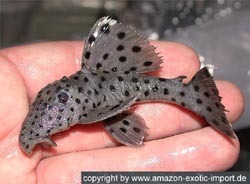 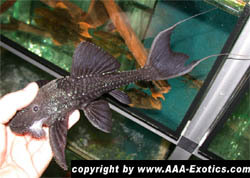 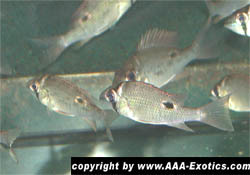 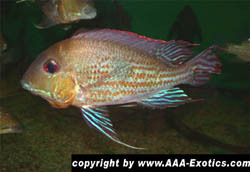 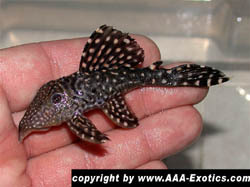 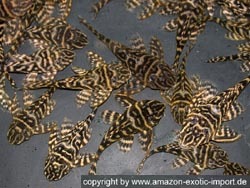 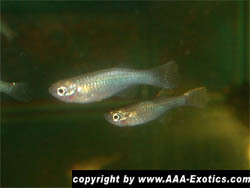 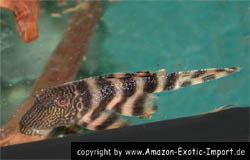 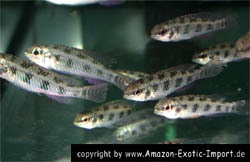 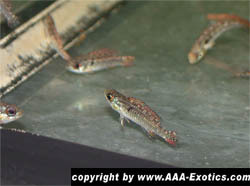 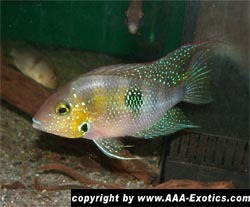 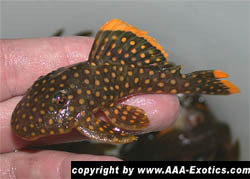 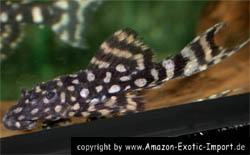 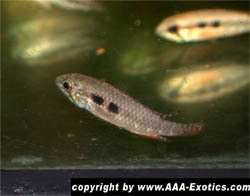 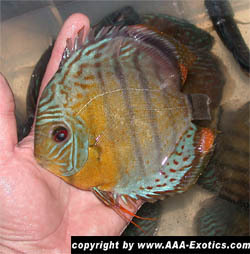 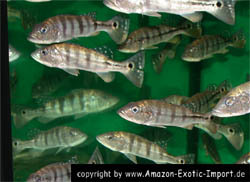 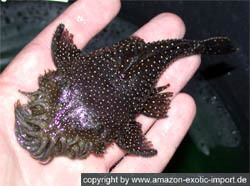 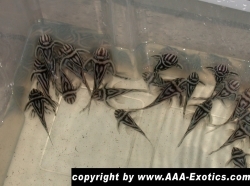 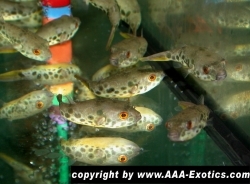 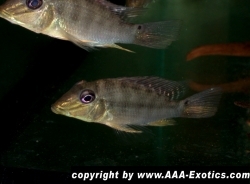 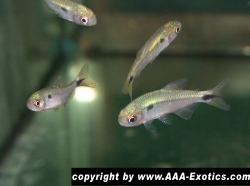 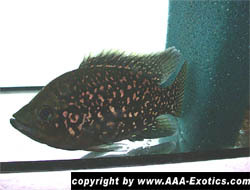 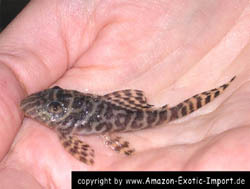 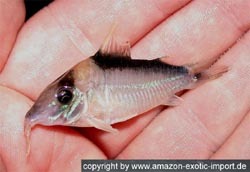 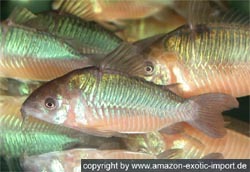 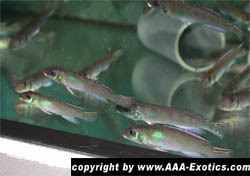 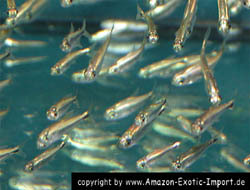 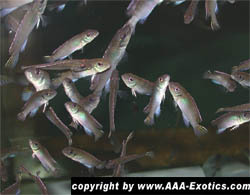 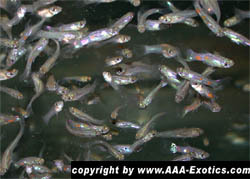 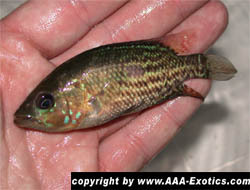 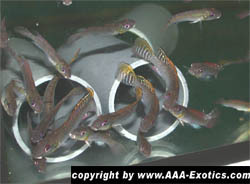 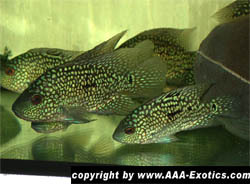 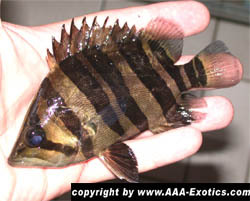 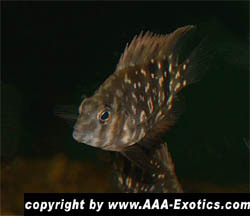 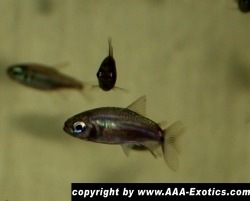 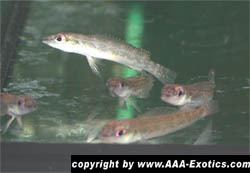 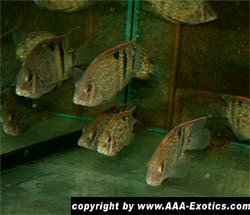 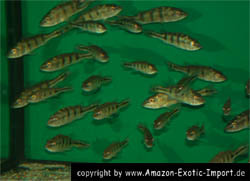 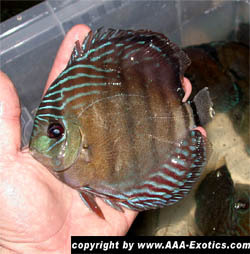 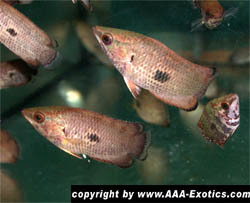 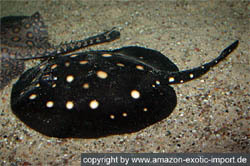 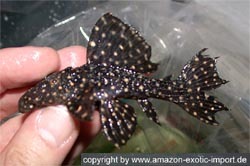 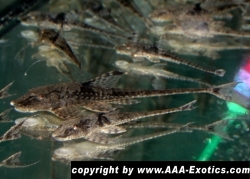 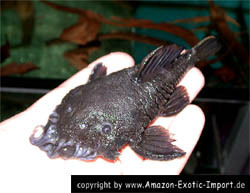 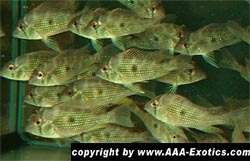 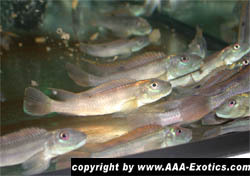 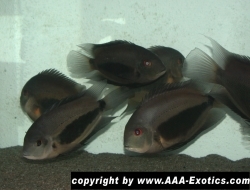 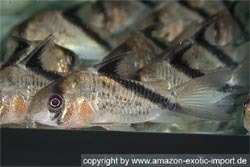 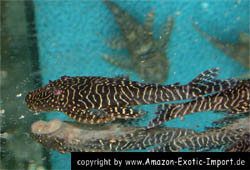 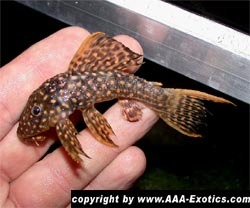 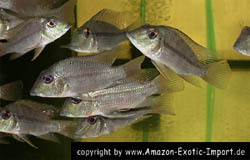 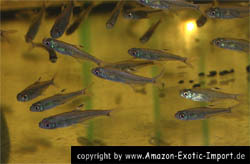 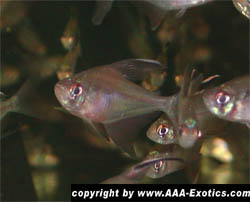 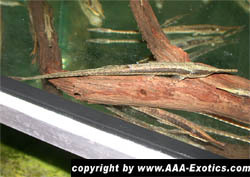 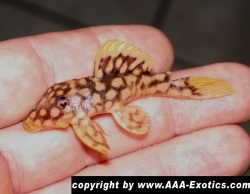 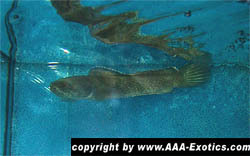 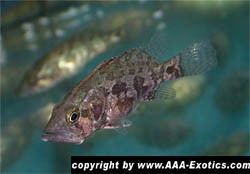 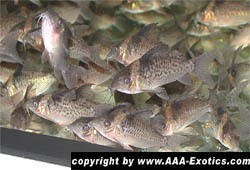 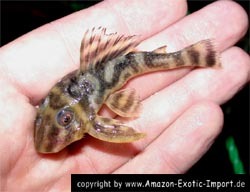 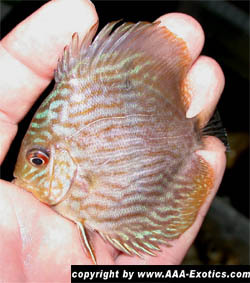 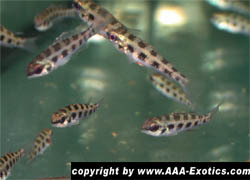 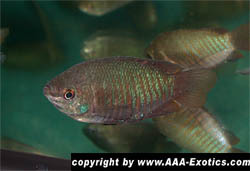 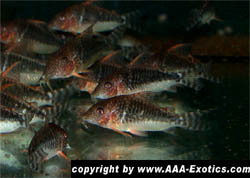 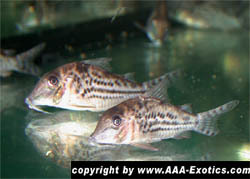 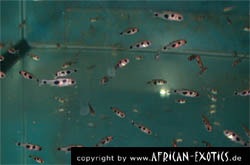 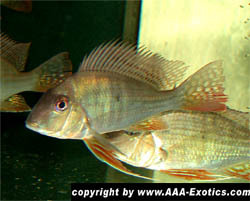 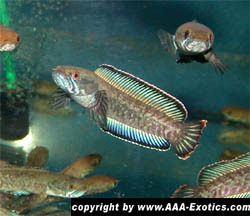 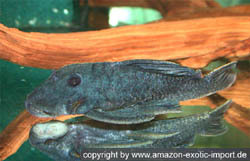 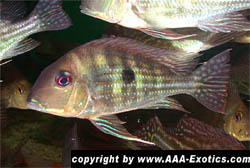 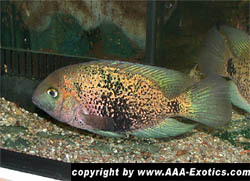 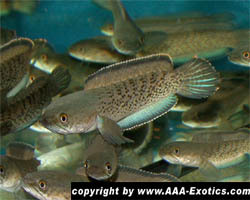 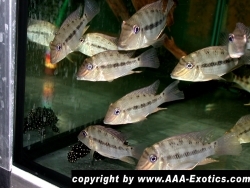 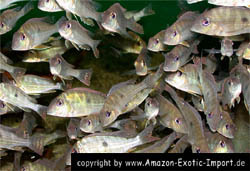 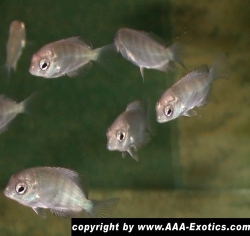 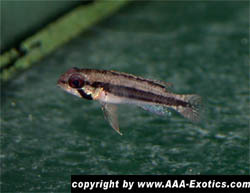 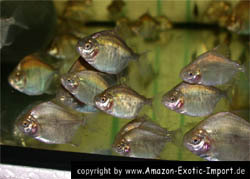 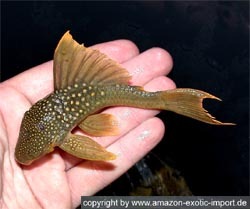 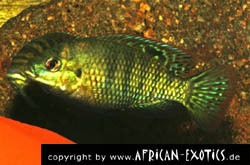 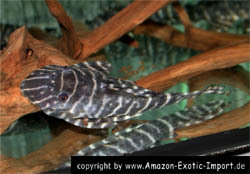 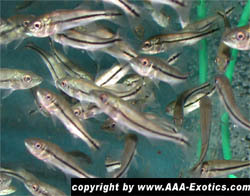 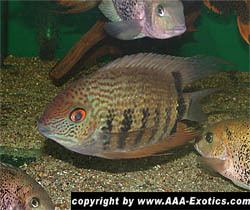 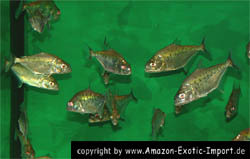 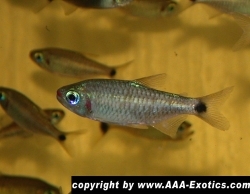 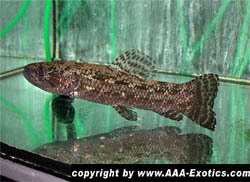 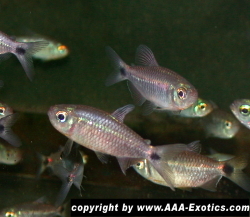 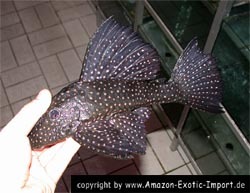 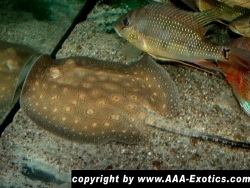 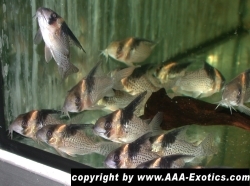 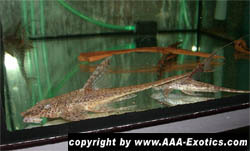 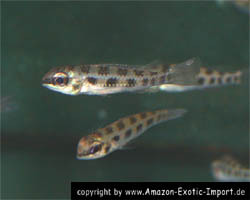 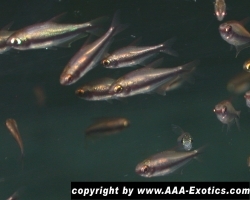 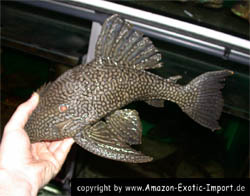 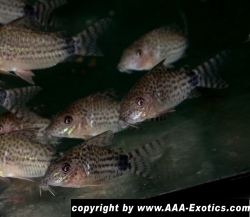 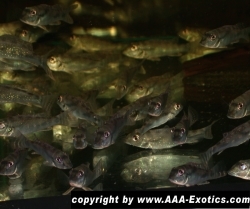 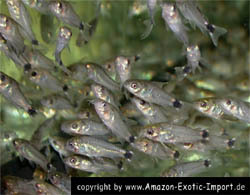 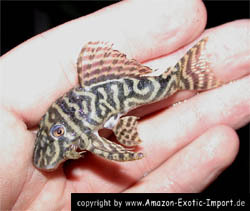 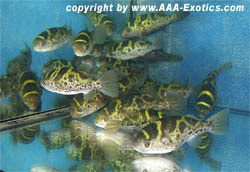 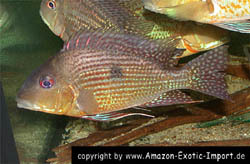 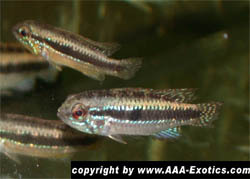 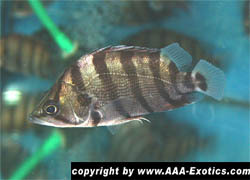 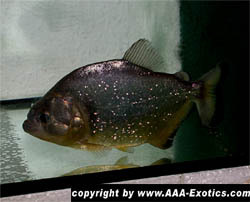 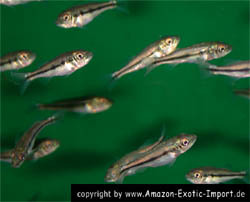 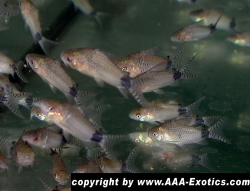 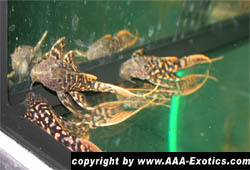 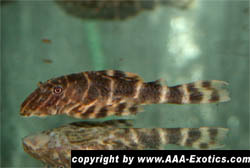 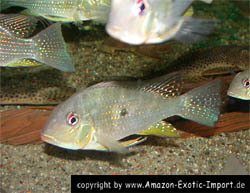 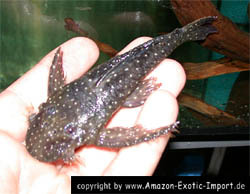 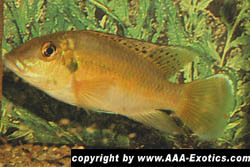 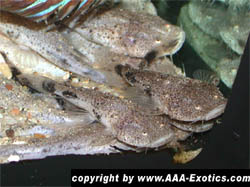 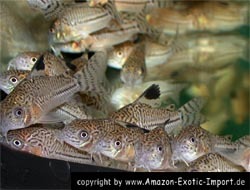 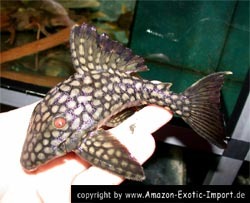 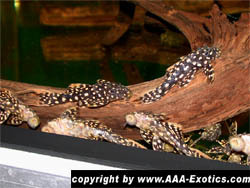 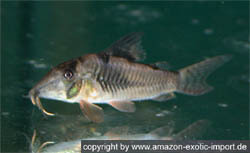 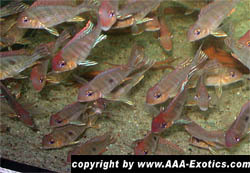 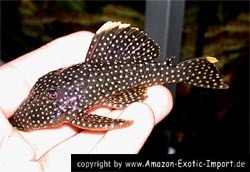 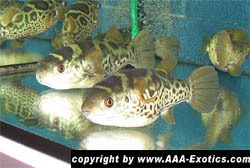 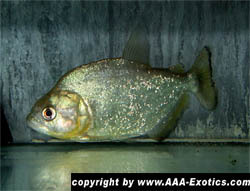 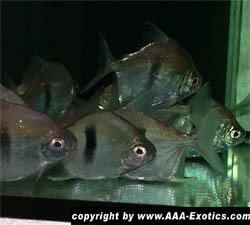 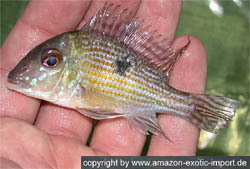 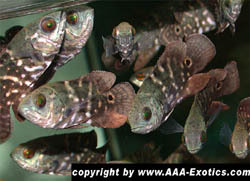 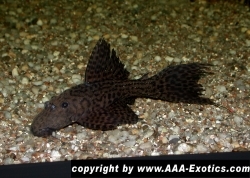 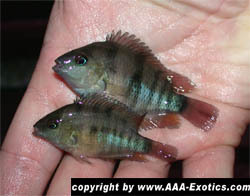 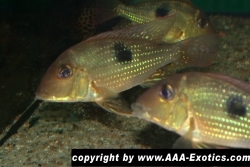 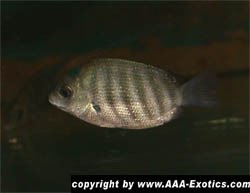 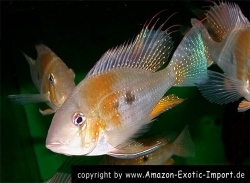 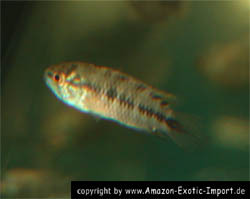 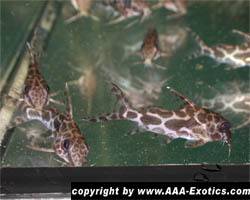 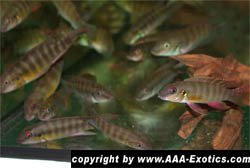 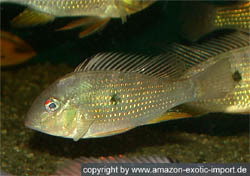 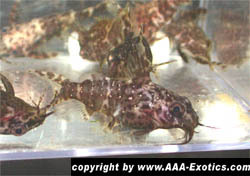 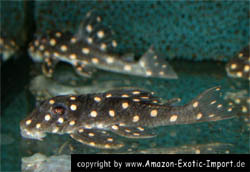 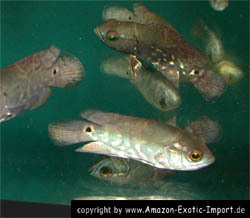 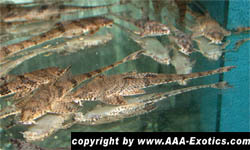 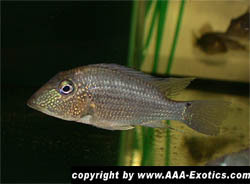 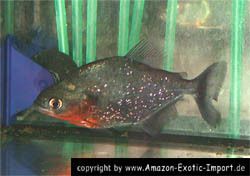 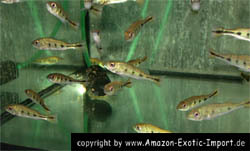 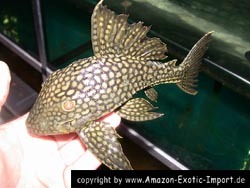 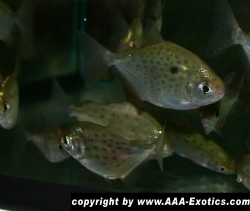 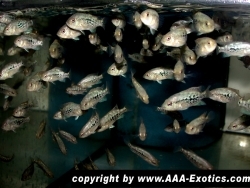 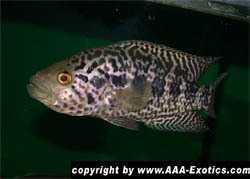 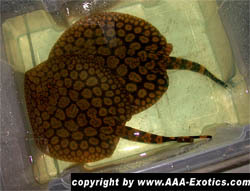 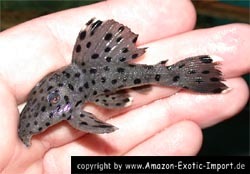 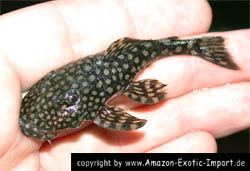 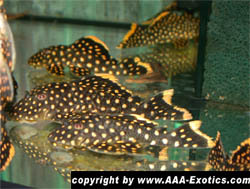 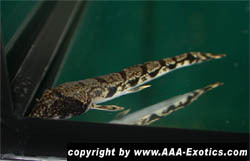 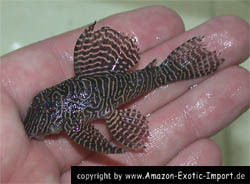 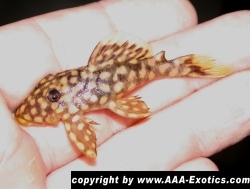 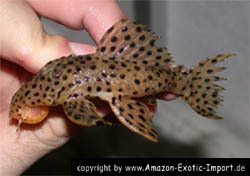 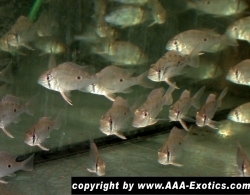 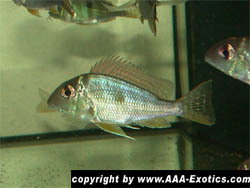 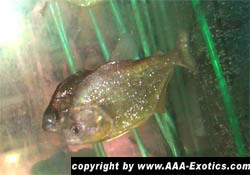 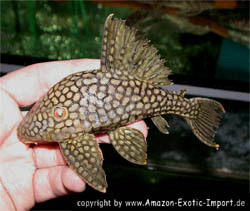 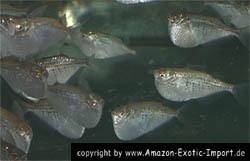 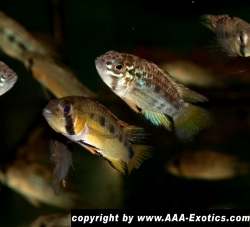 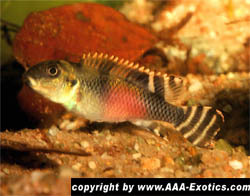 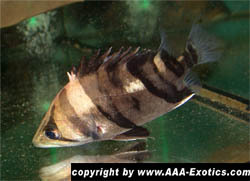 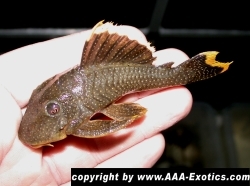 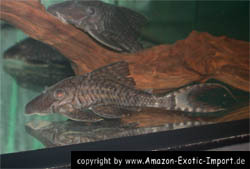 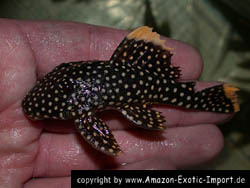 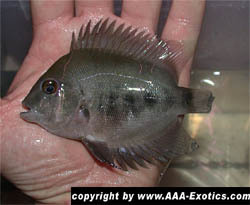 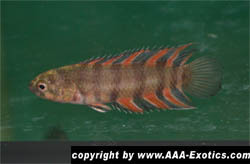 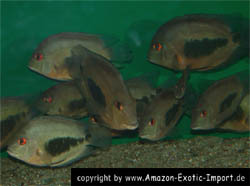 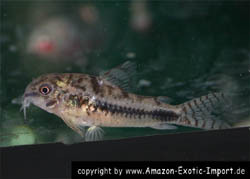 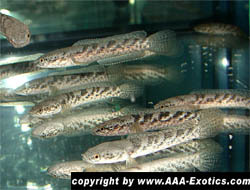 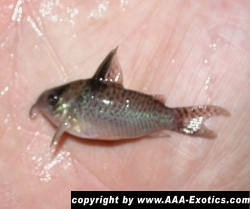 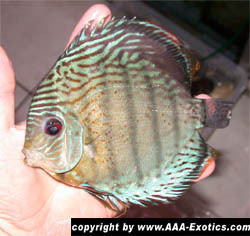 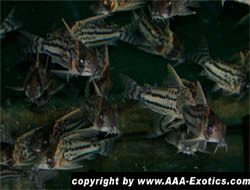 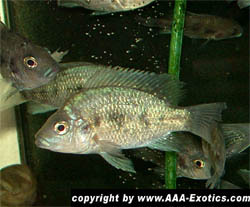 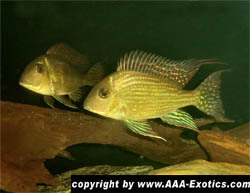 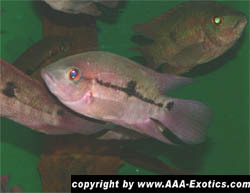 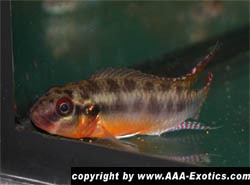 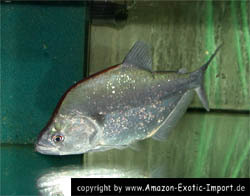 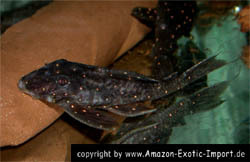 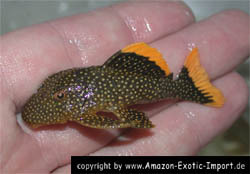 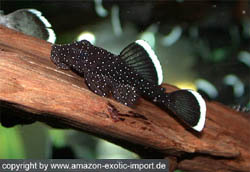 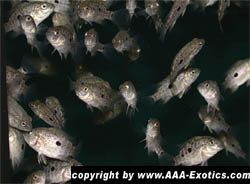 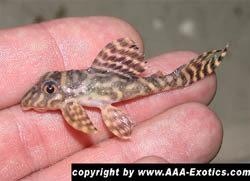 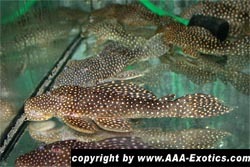 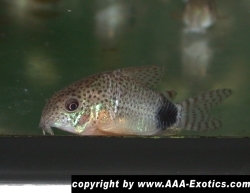 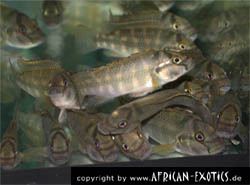 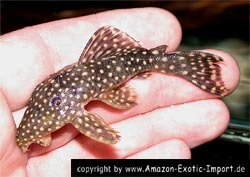 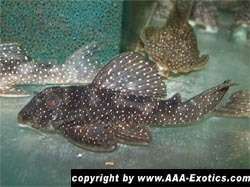 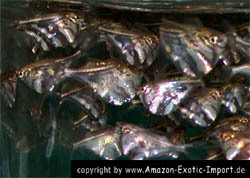 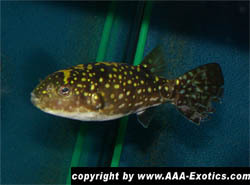 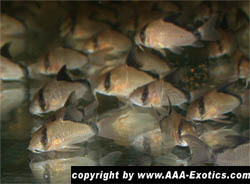 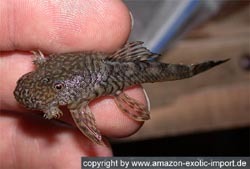 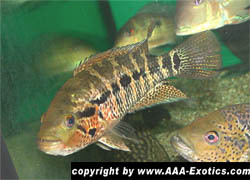 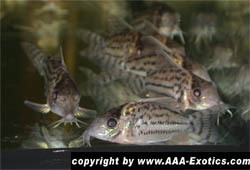 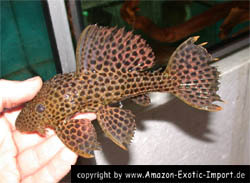 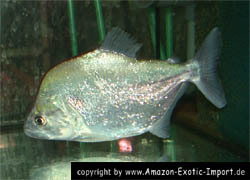 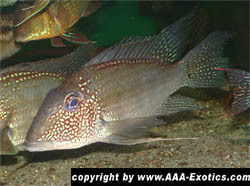 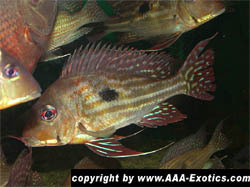 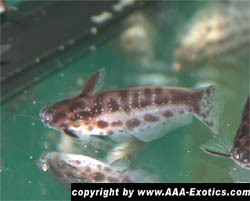 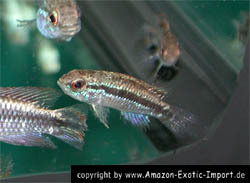 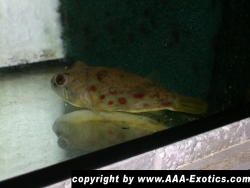 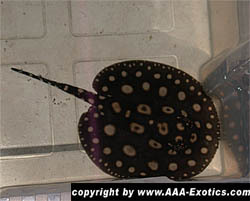 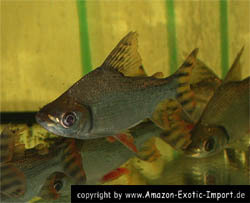 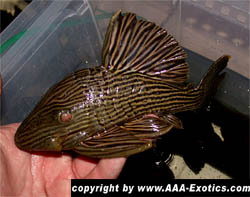 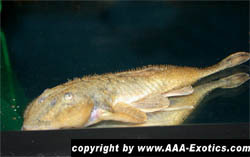 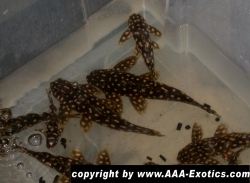 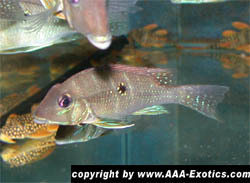 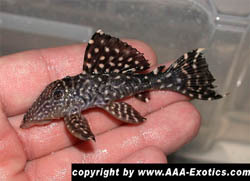 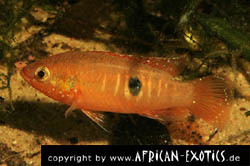 Microgeophagus ramirezi Pterophyllum sp. 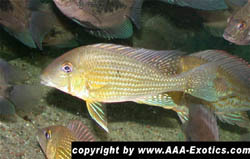 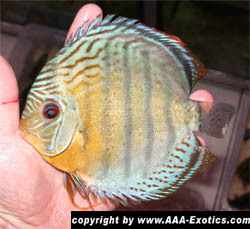 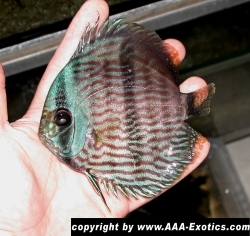 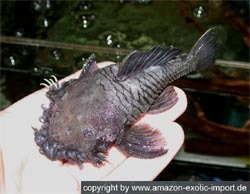 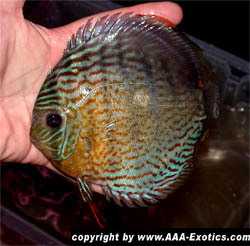 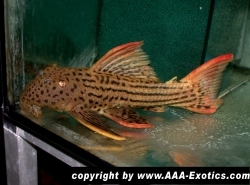 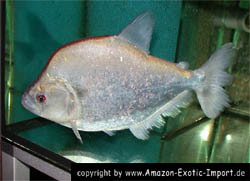 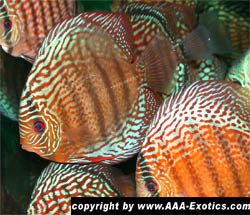 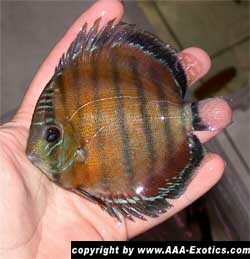 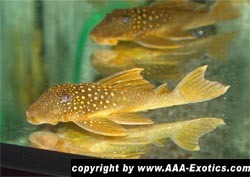 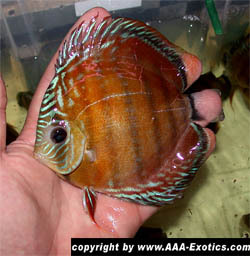 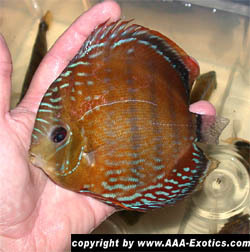 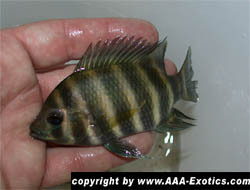 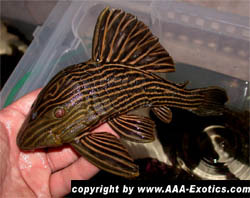 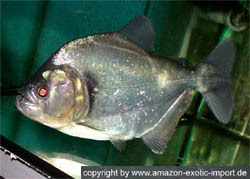 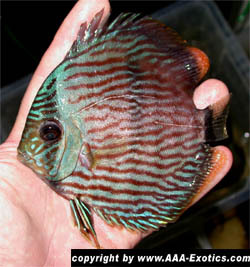 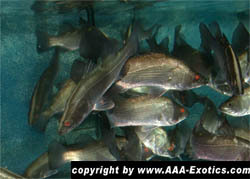 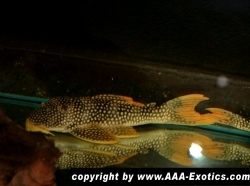 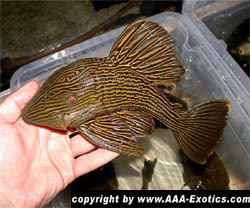 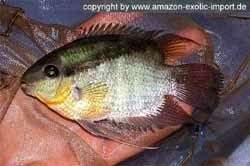 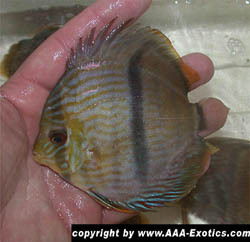 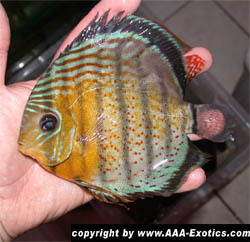 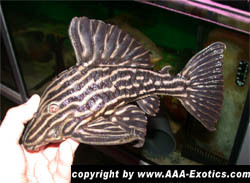 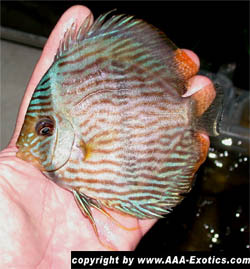 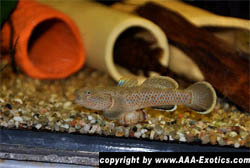 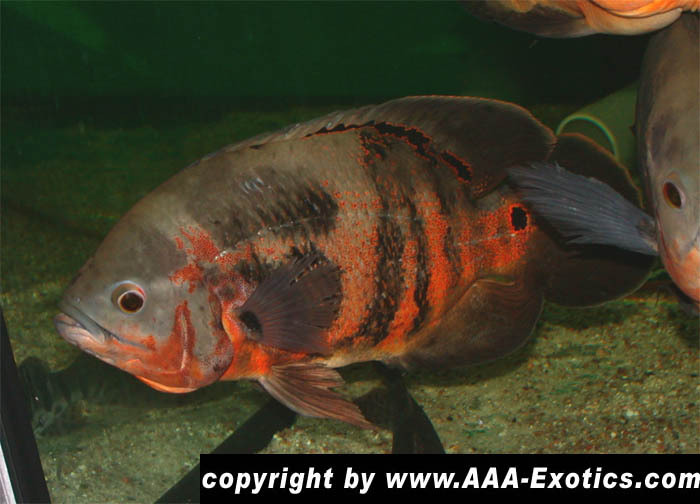 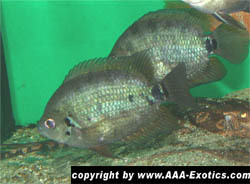 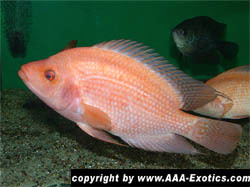 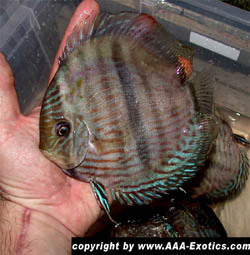 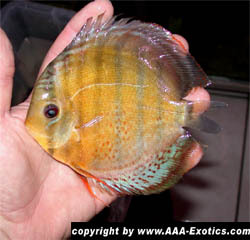 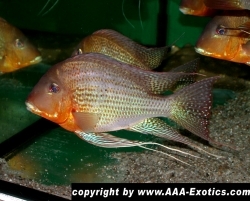 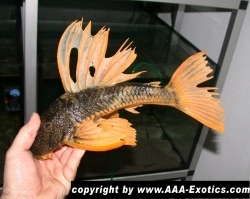 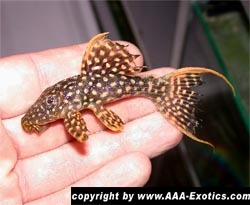 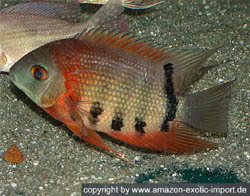 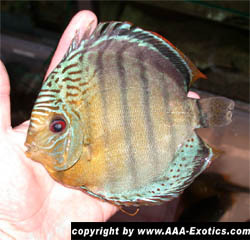 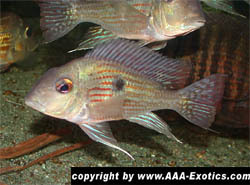 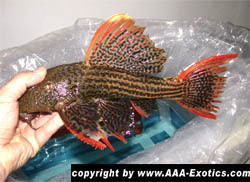 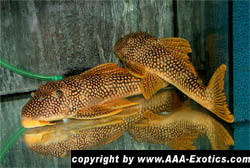 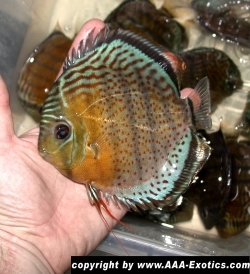 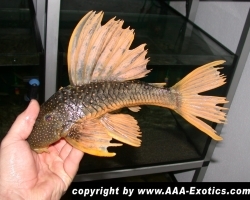 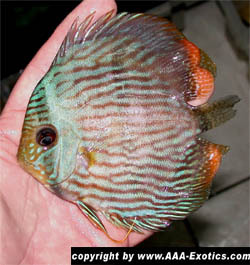 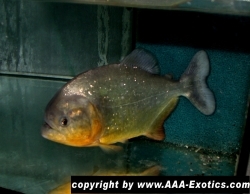 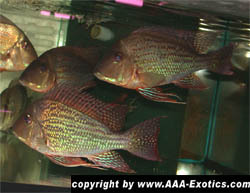 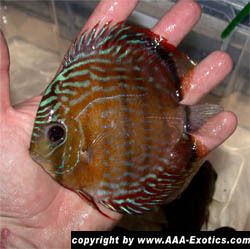 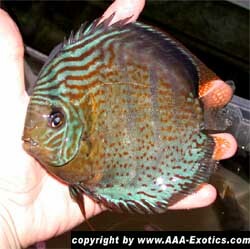 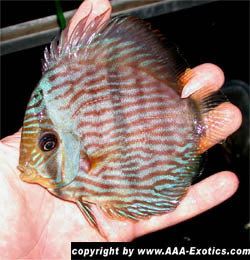 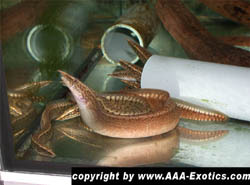 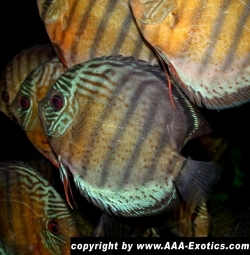 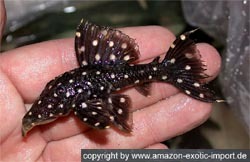 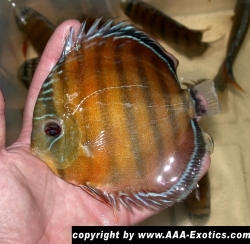 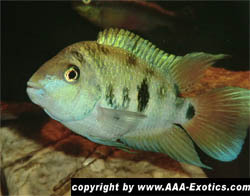 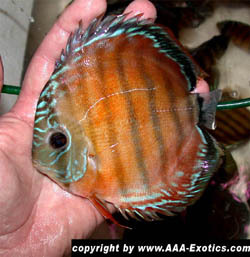 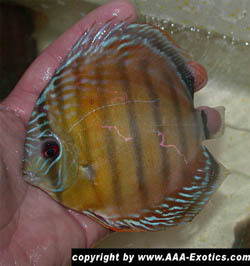 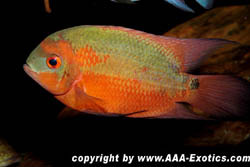 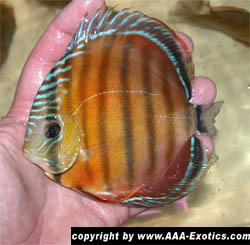 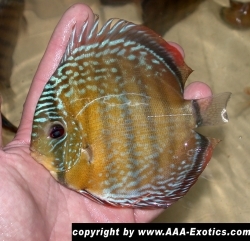 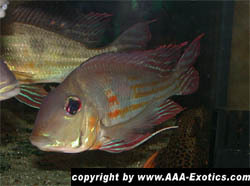 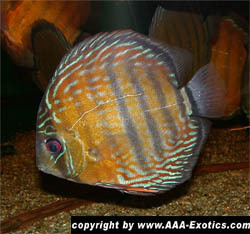 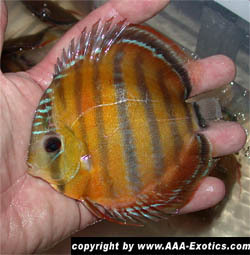 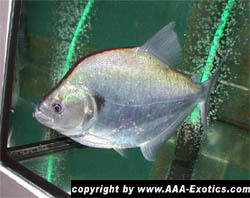 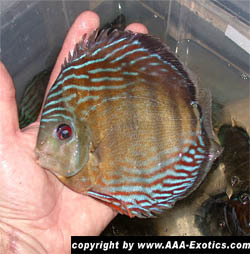 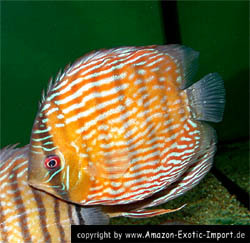 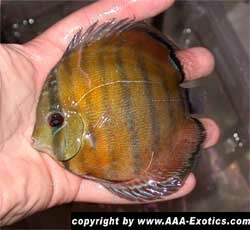 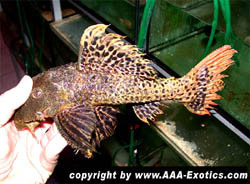 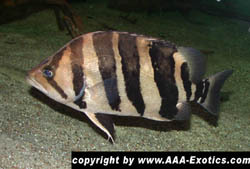 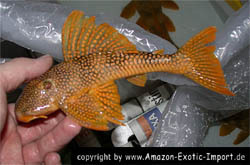 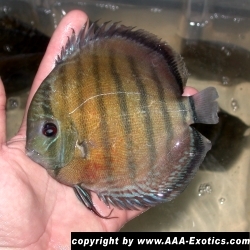 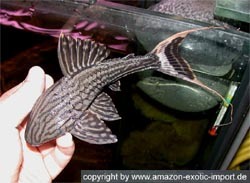 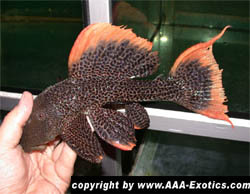 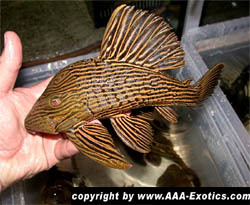 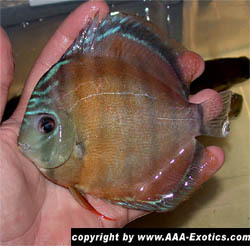 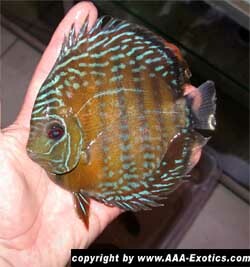 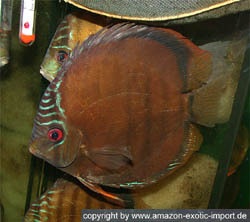 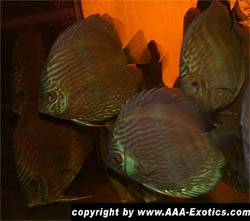 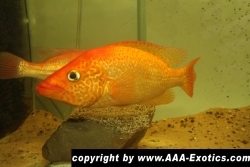 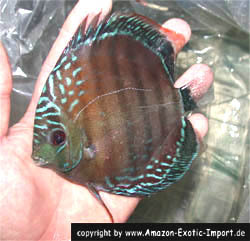 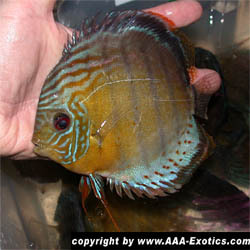 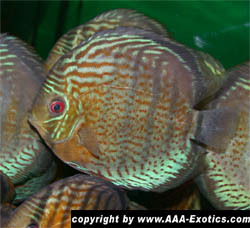 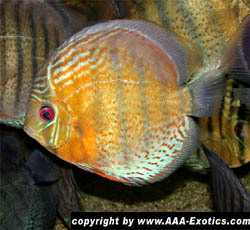 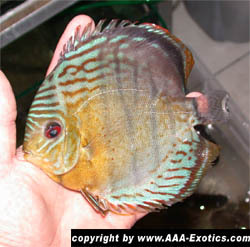 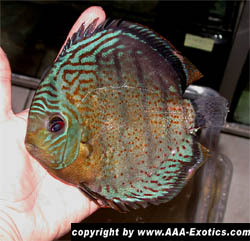 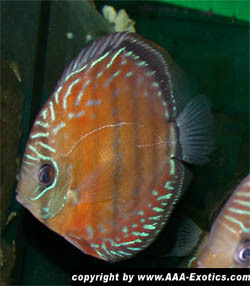 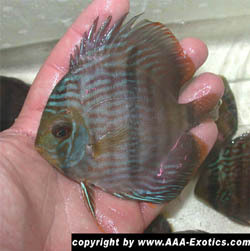 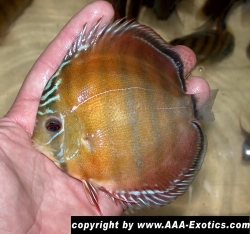 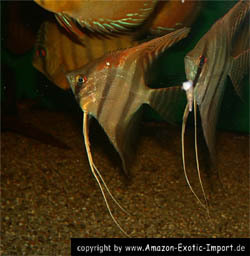 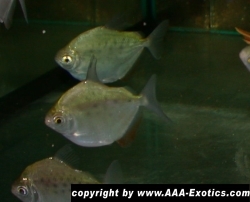 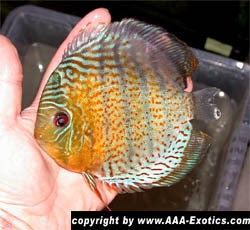 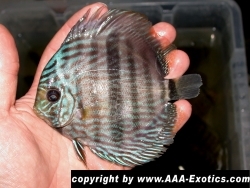 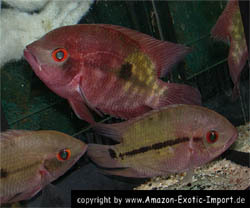 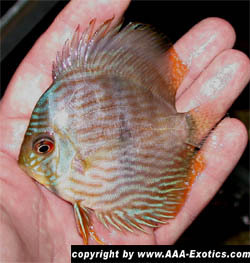 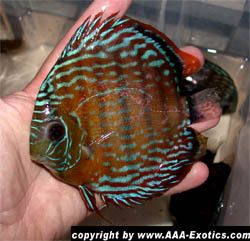 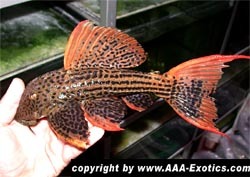 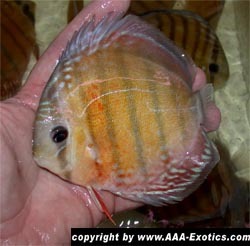 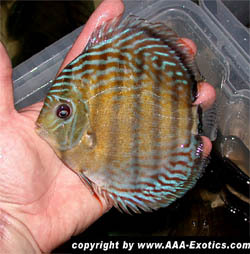 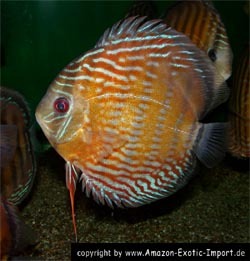 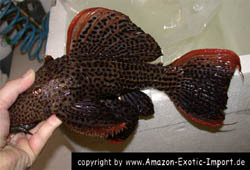 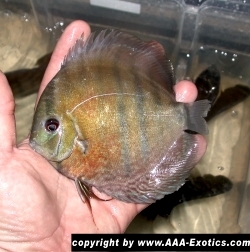 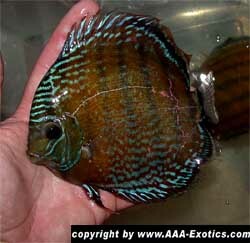 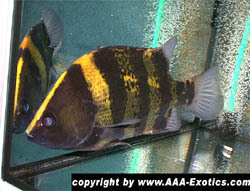 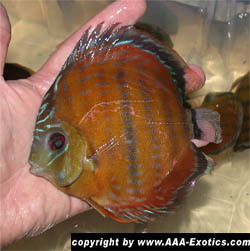 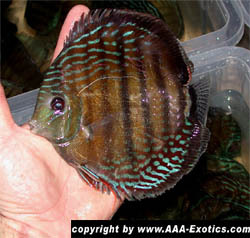 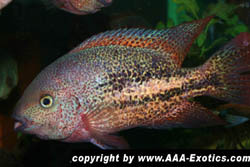 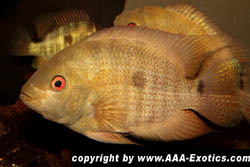 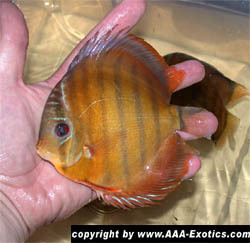 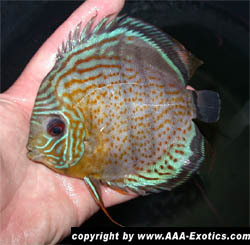 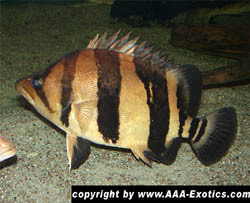 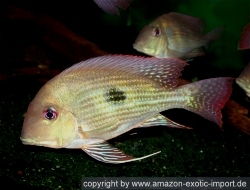 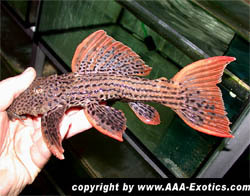 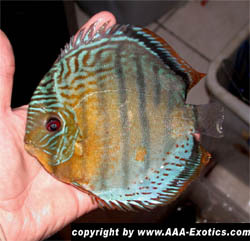 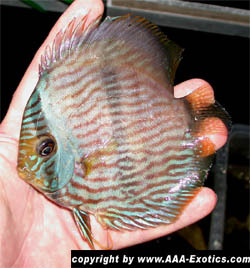 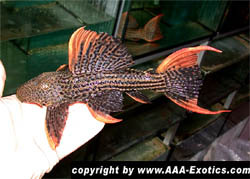 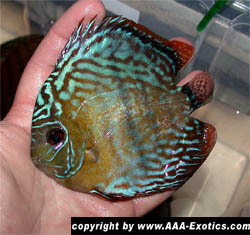 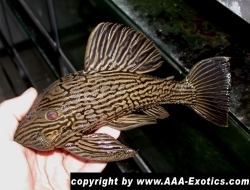 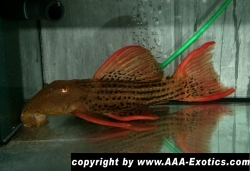 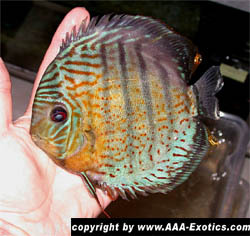 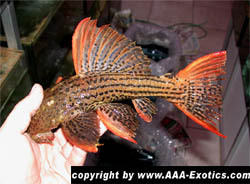 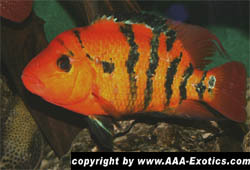 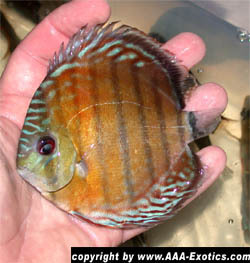 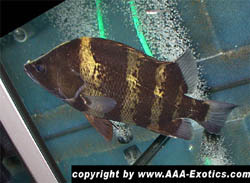 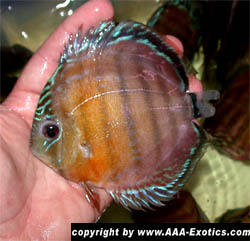 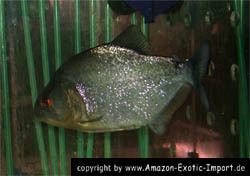 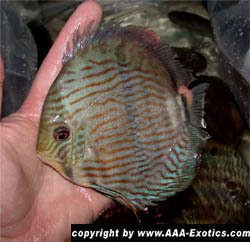 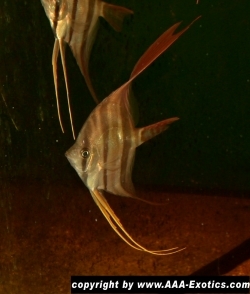 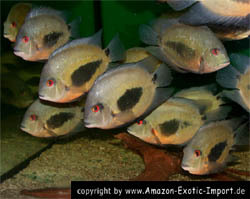 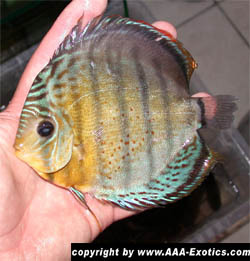 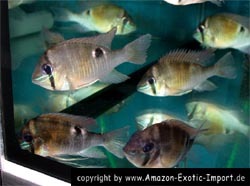 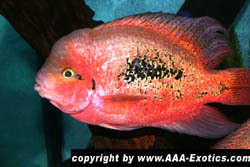 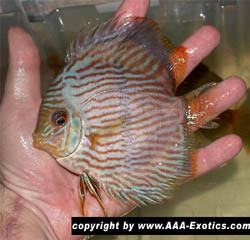 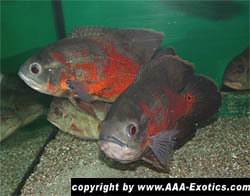 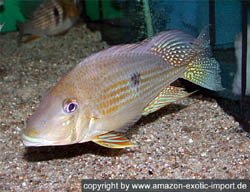 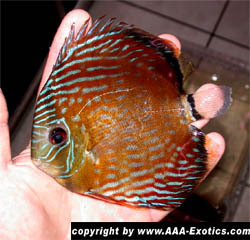 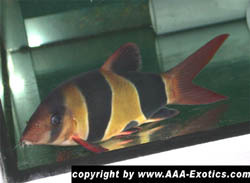 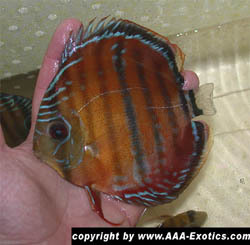 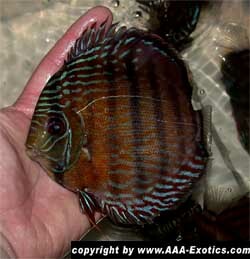 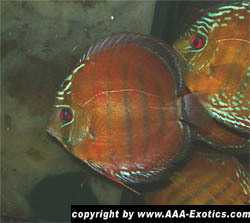 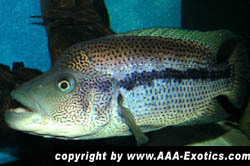 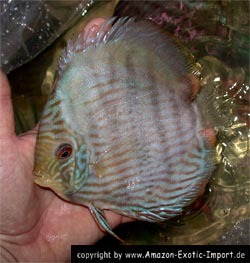 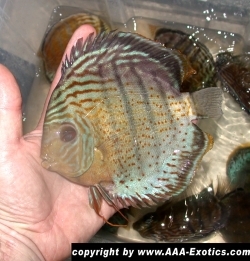 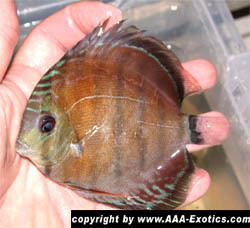 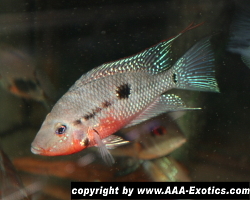 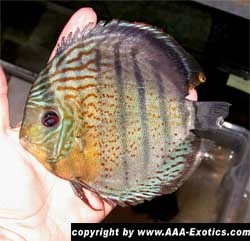 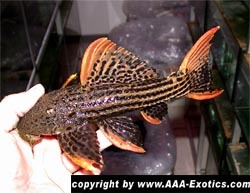 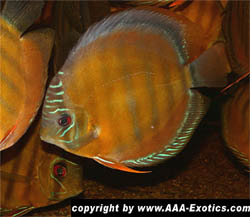 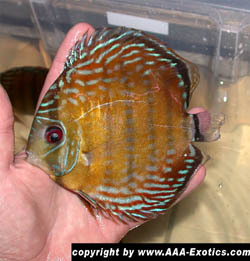 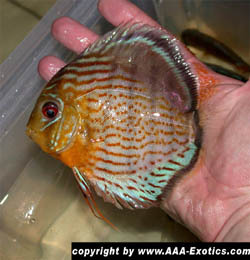 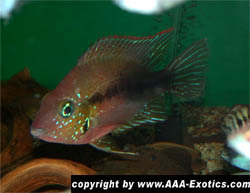 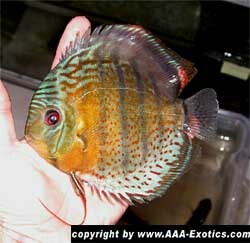 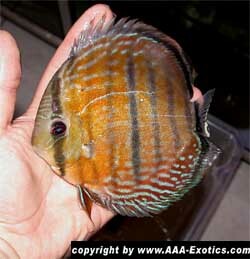 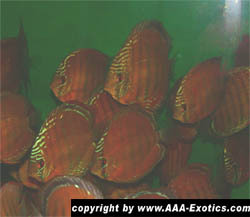 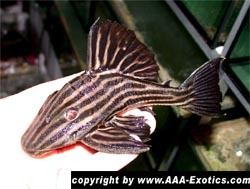 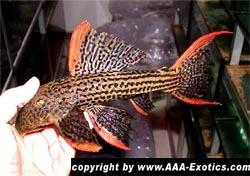 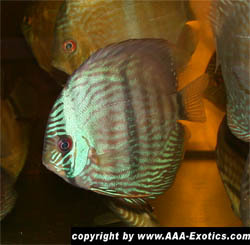 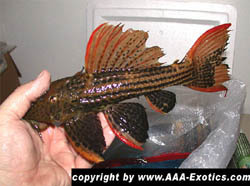 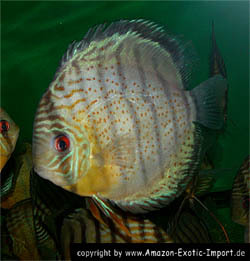 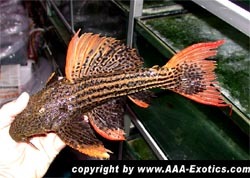 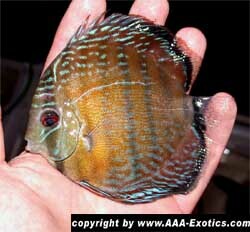 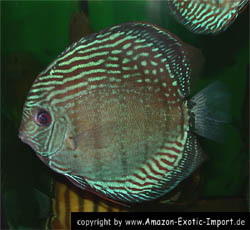 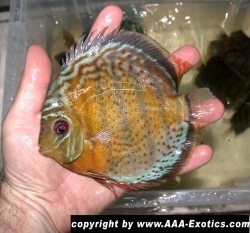 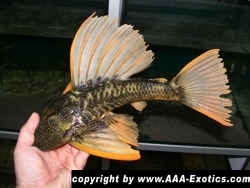 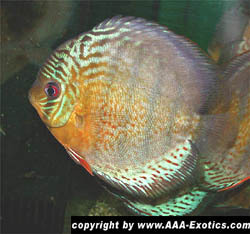 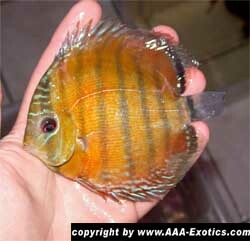 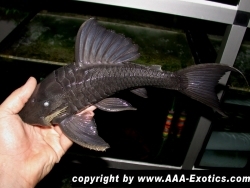 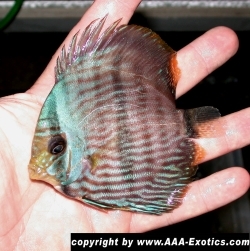 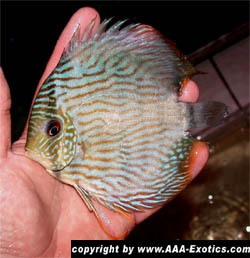 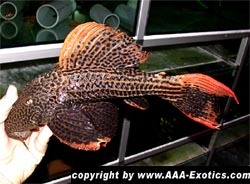 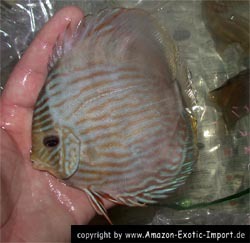 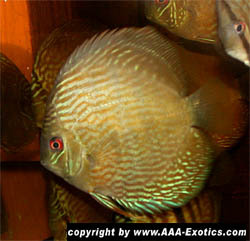 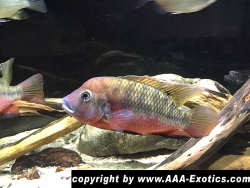 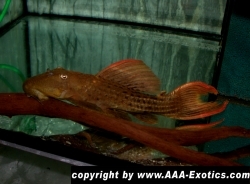 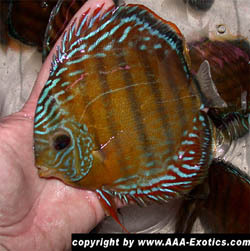 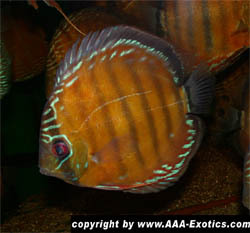 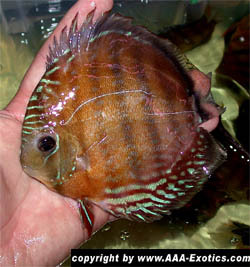 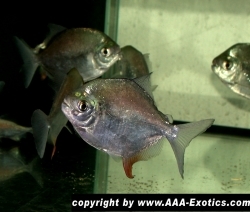 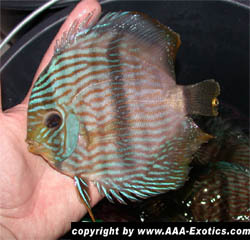 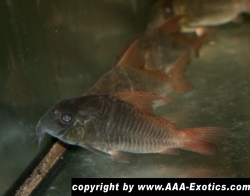 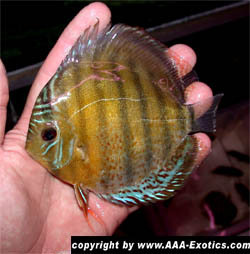 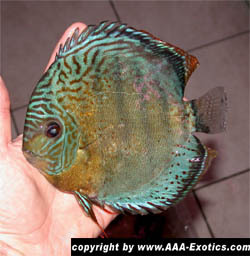 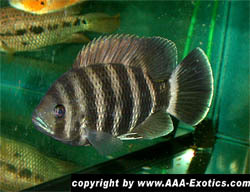 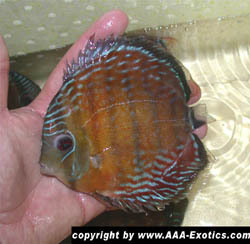 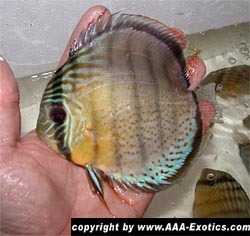 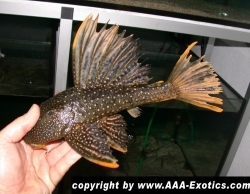 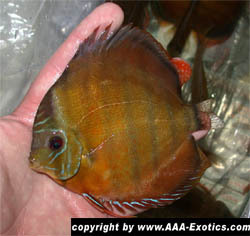 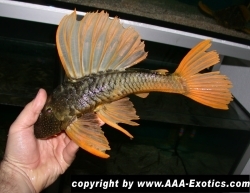 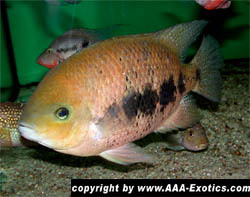 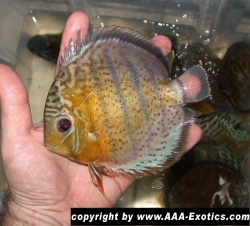 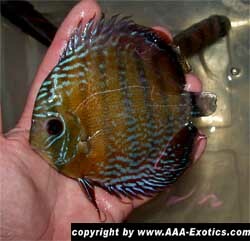 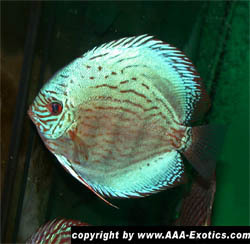 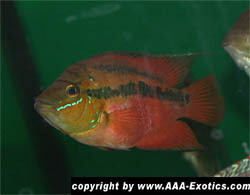 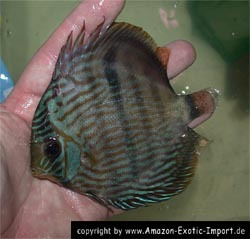 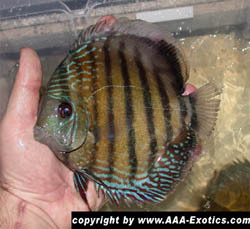 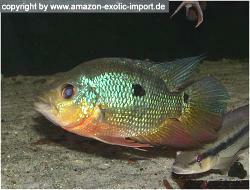 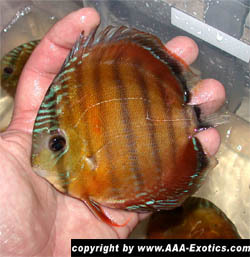 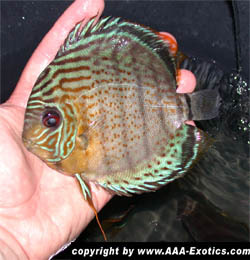 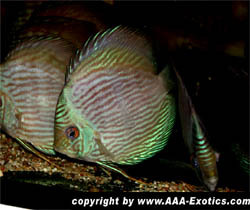 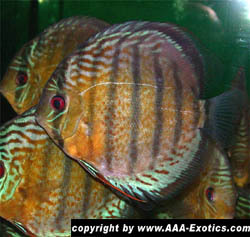 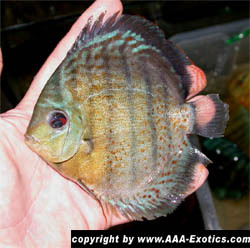 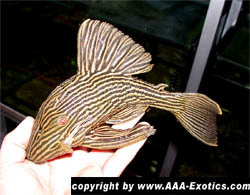 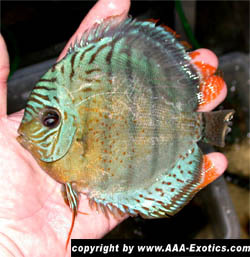 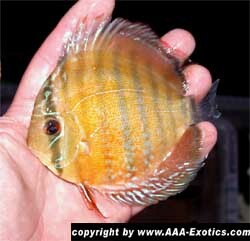 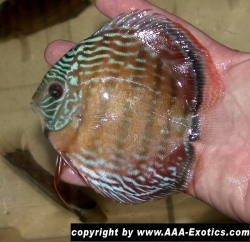 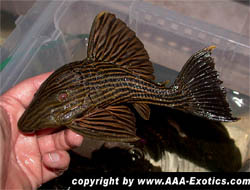 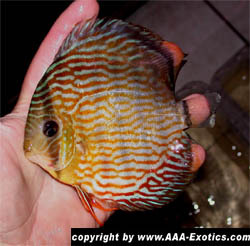 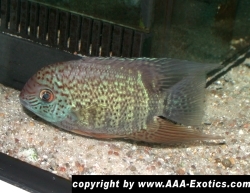 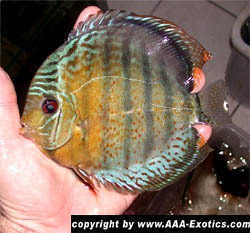 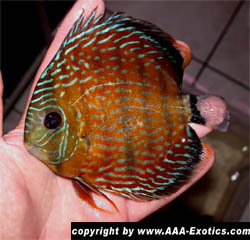 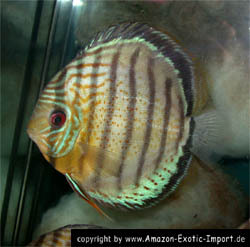 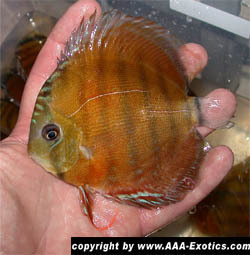 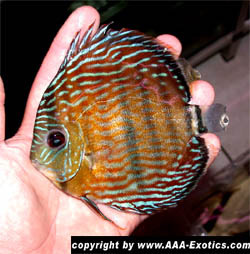 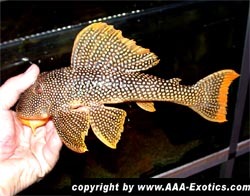 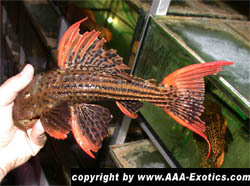 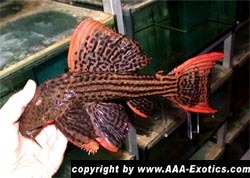 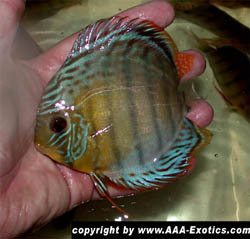 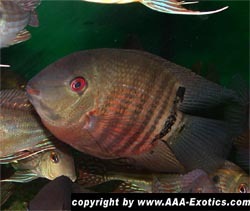 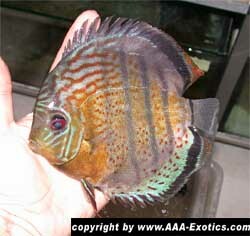 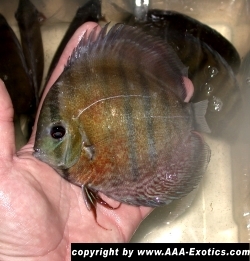 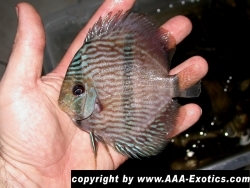 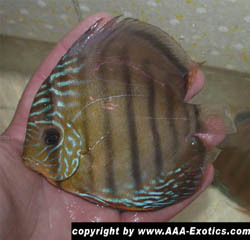 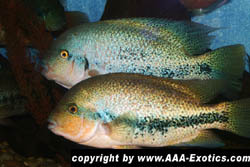 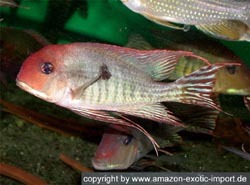 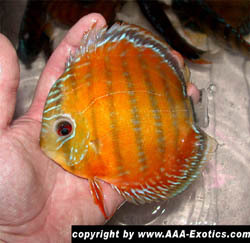 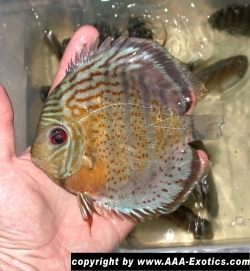 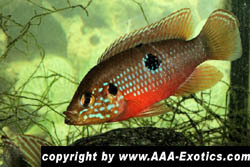 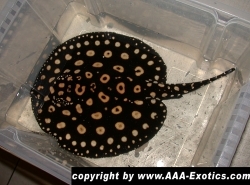 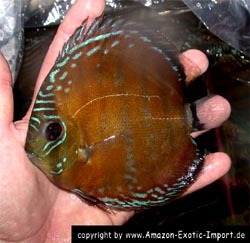 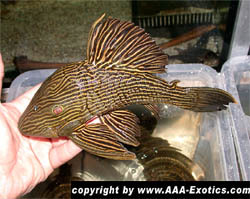 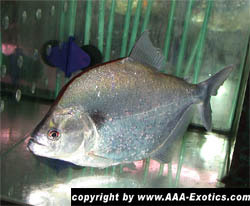 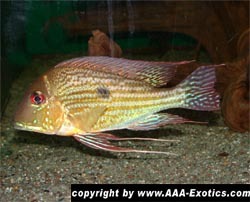 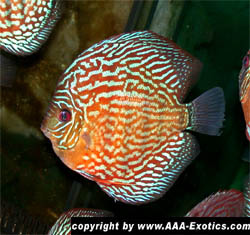 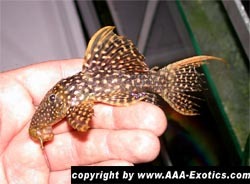 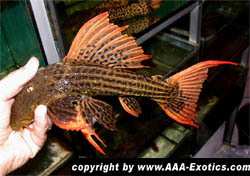 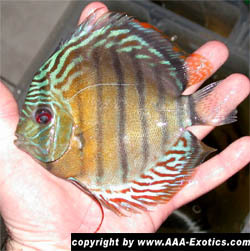 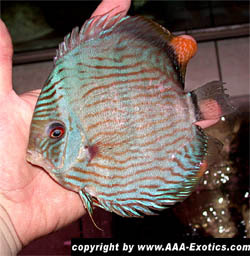 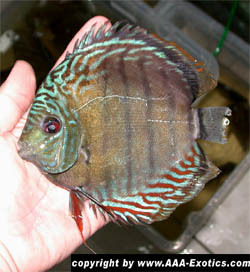 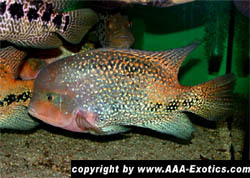 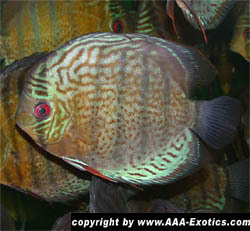 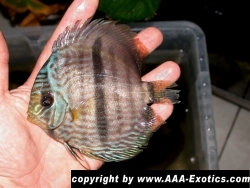 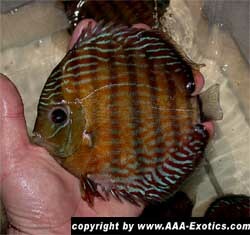 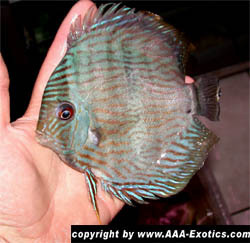 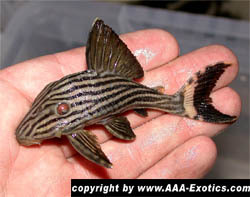 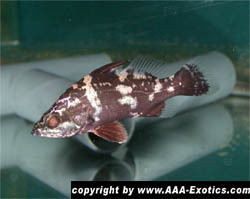 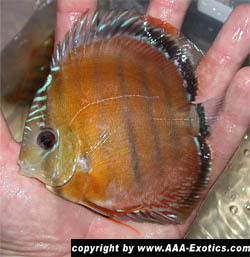 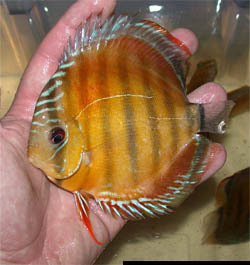 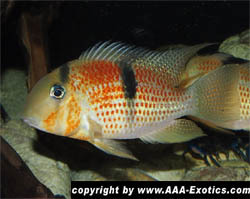 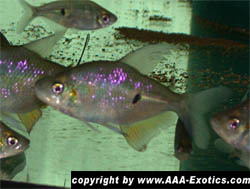 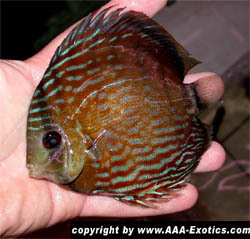 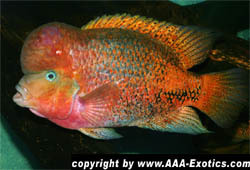 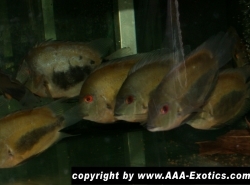 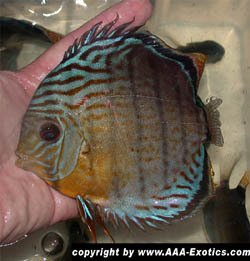 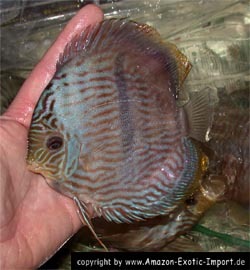 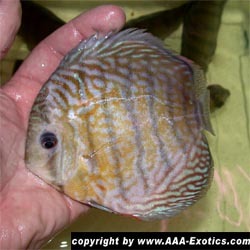 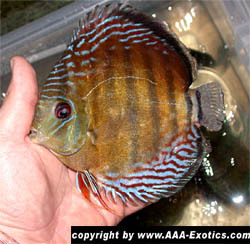 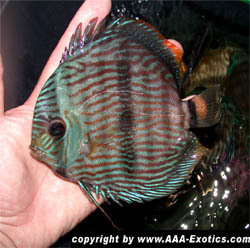 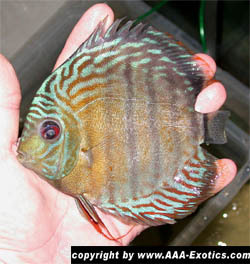 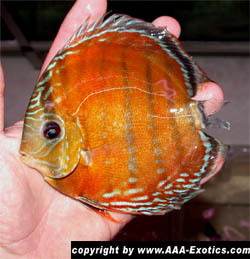 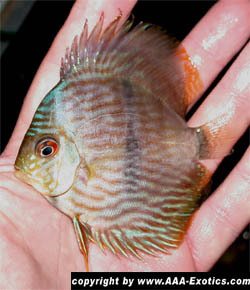 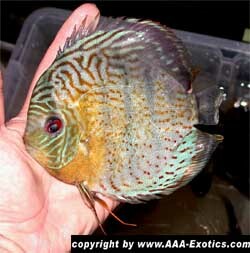 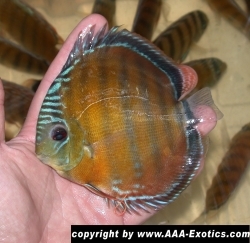 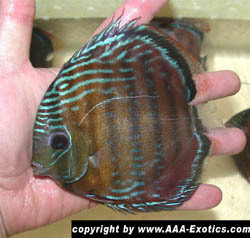 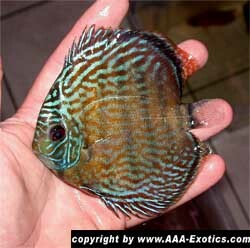 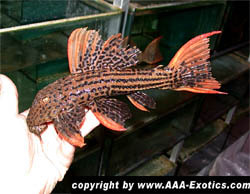 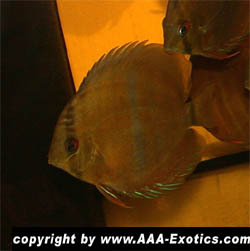 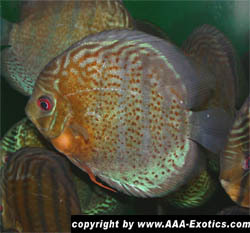 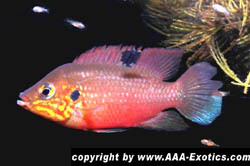 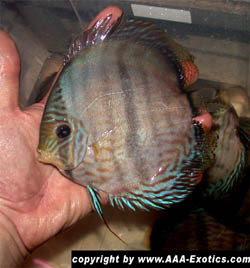 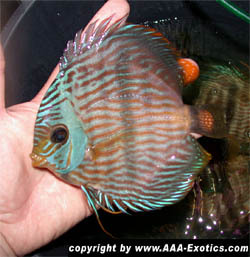 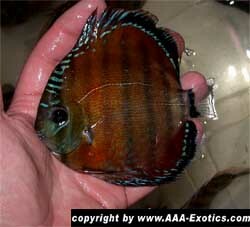 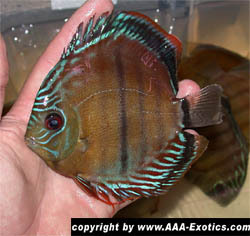 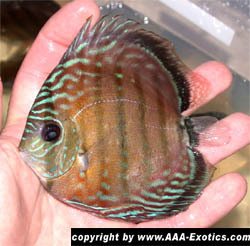 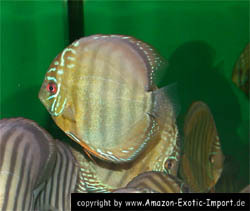 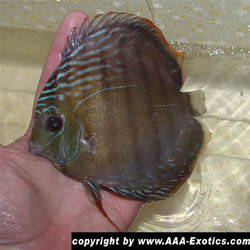 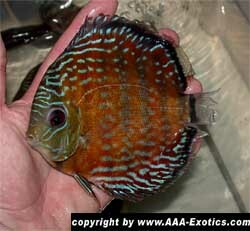 "Manacapuru Red Shoulder" L 52 Zonancistus sp. 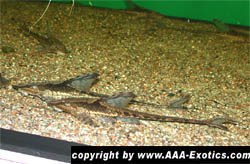 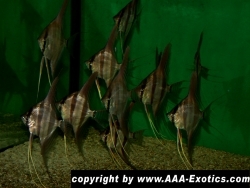 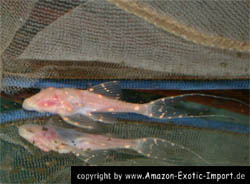 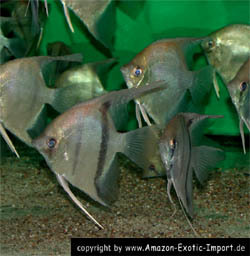 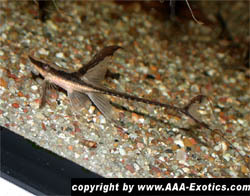 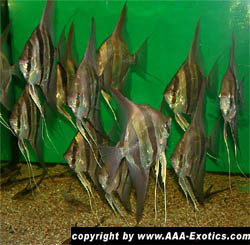 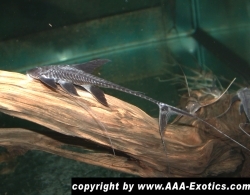 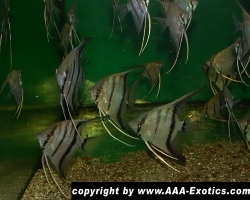 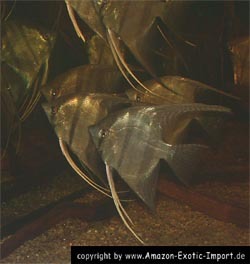 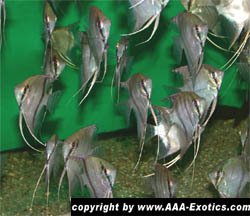 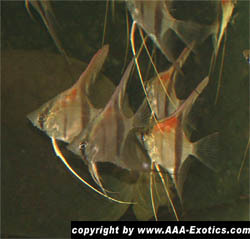 Pterophyllum altum "Orinoco" Pterophyllum altum "Orinoco" Pterophyllum altum "Orinoco"
Geophagus sp. 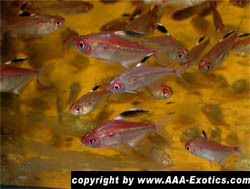 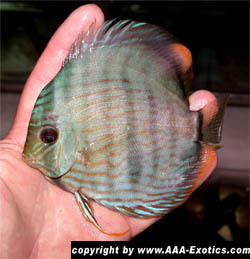 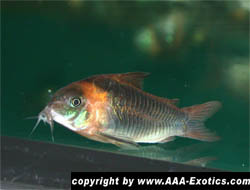 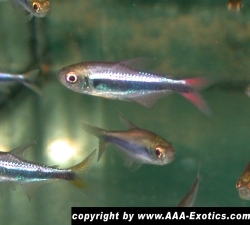 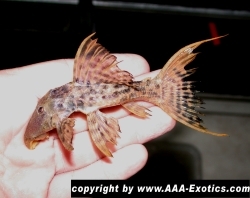 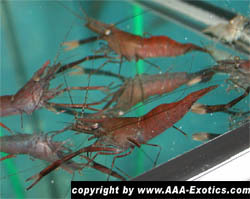 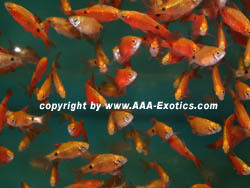 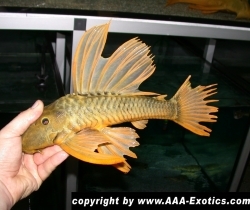 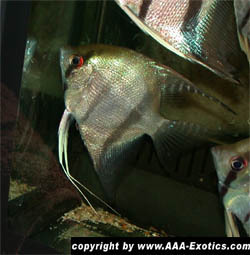 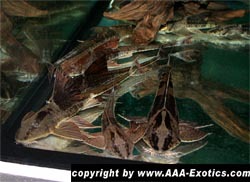 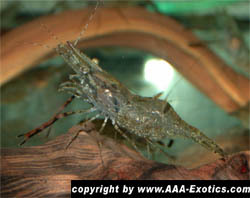 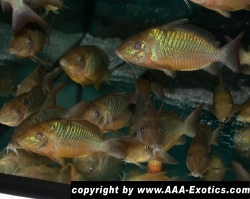 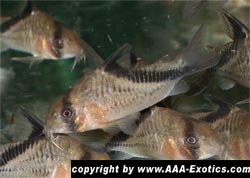 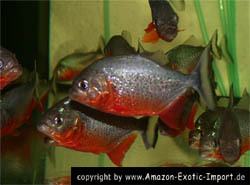 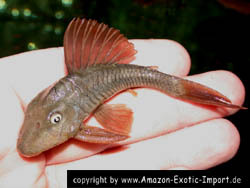 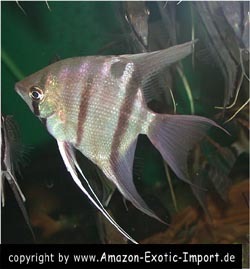 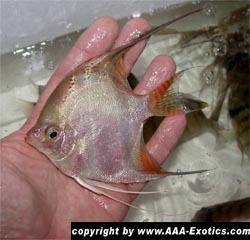 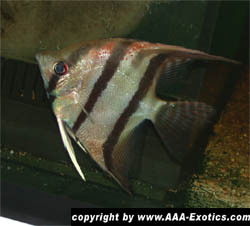 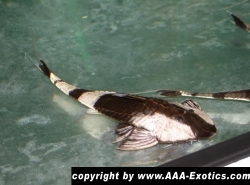 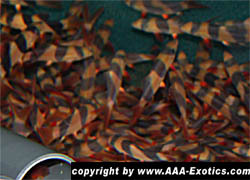 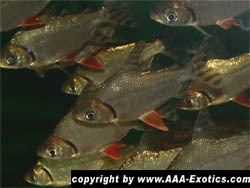 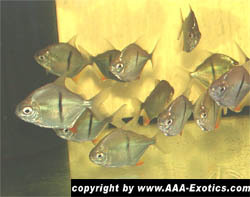 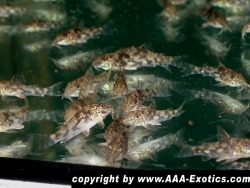 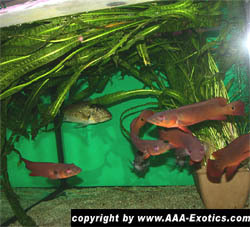 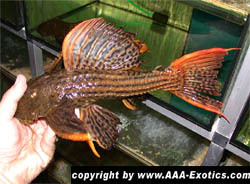 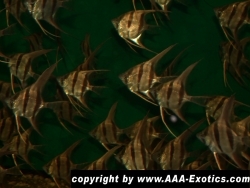 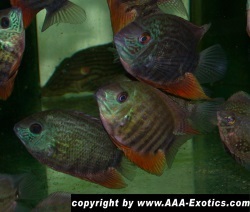 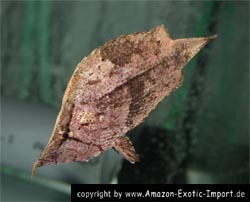 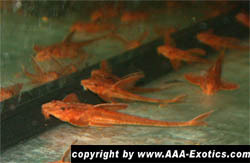 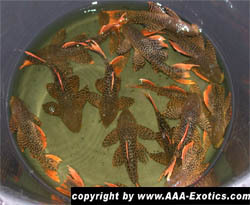 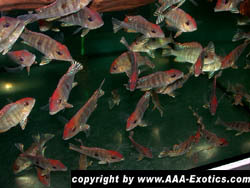 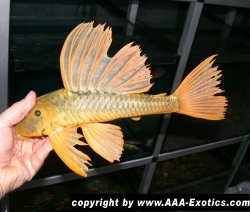 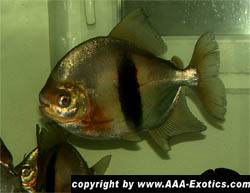 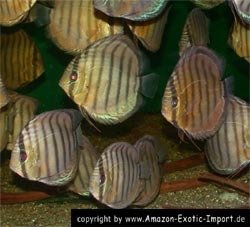 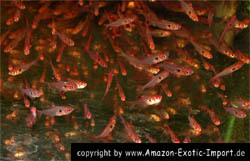 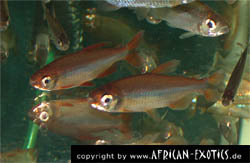 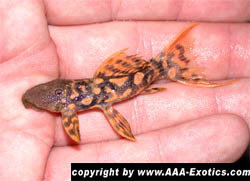 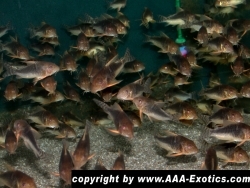 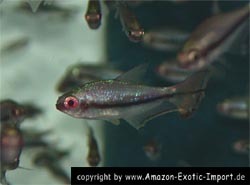 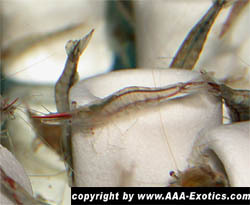 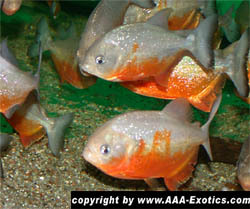 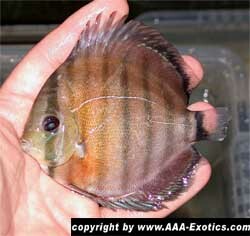 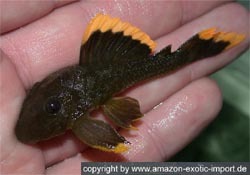 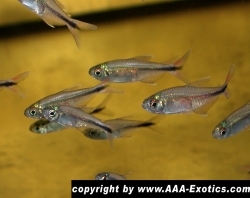 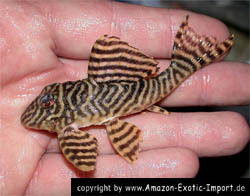 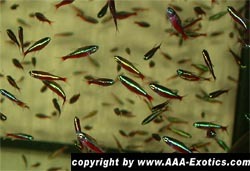 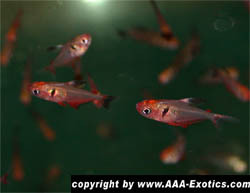 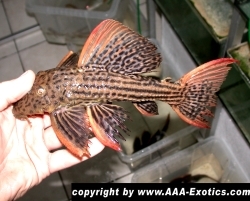 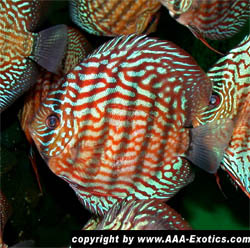 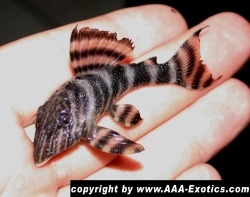 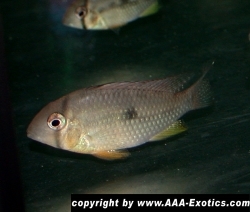 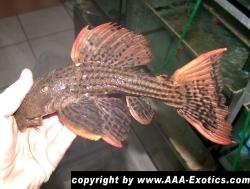 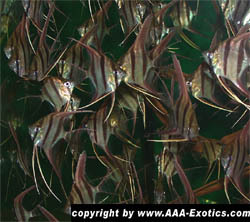 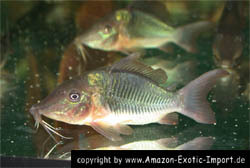 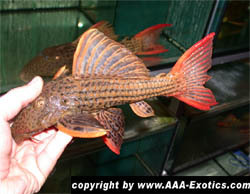 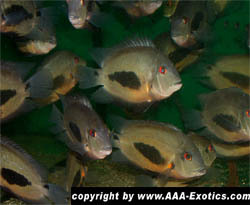 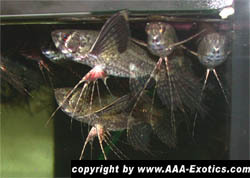 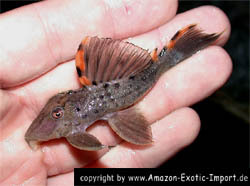 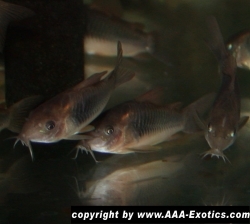 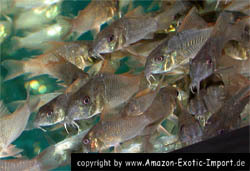 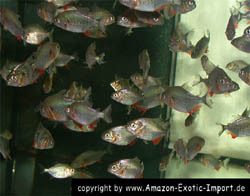 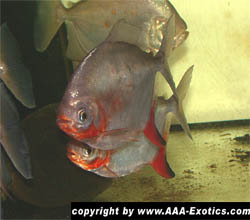 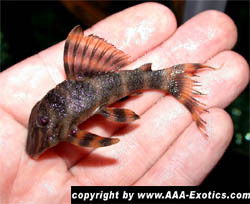 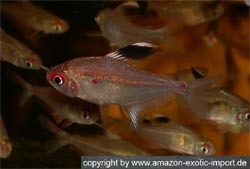 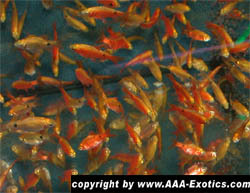 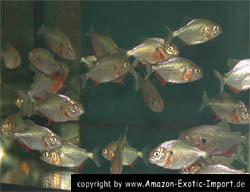 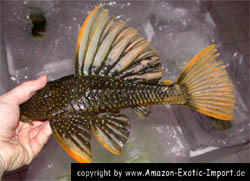 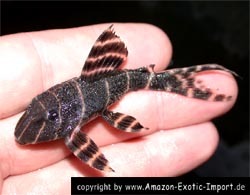 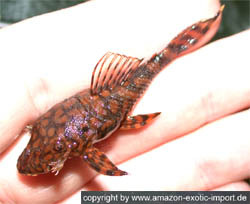 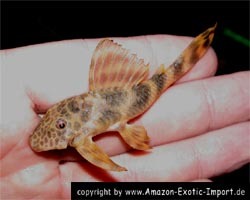 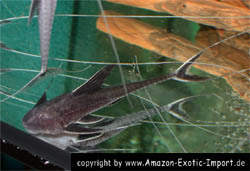 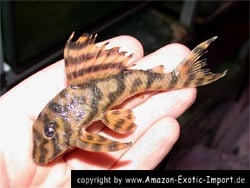 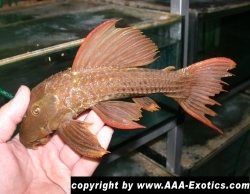 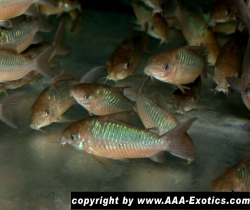 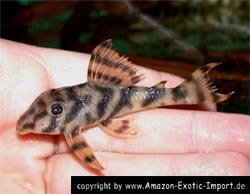 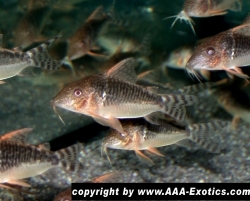 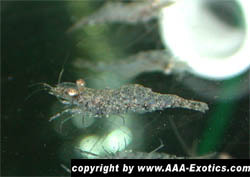 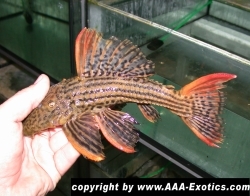 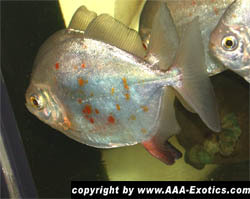 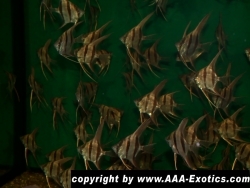 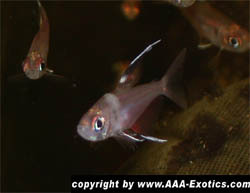 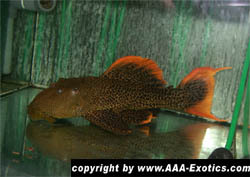 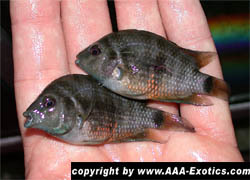 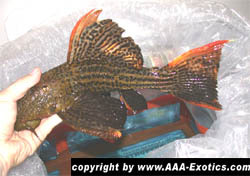 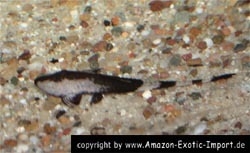 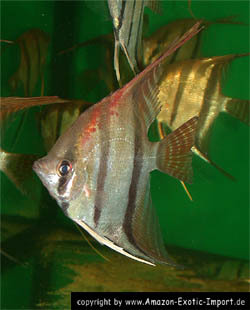 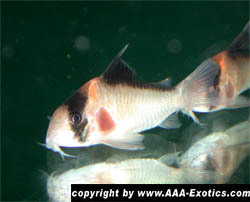 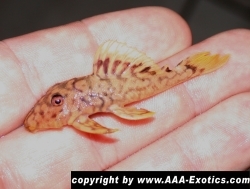 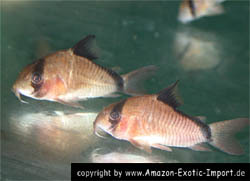 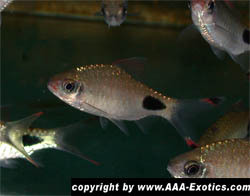 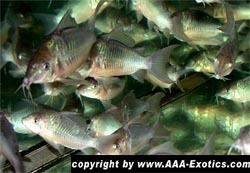 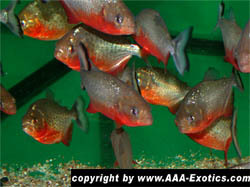 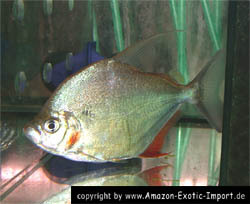 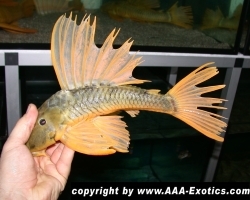 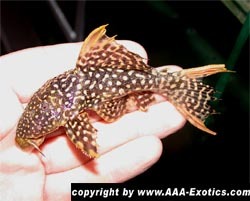 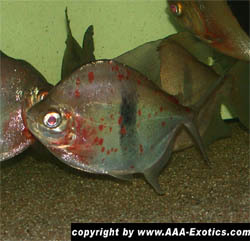 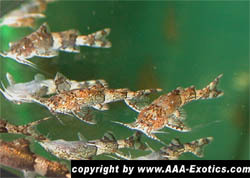 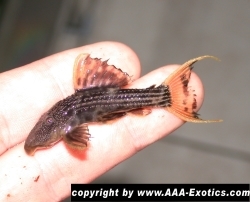 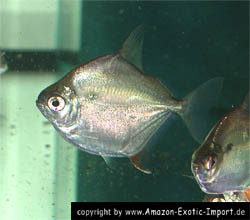 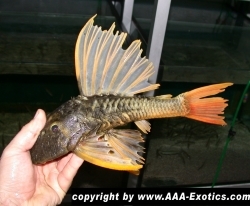 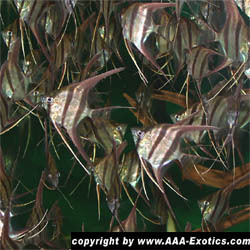 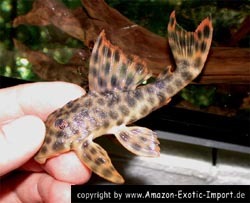 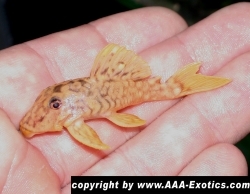 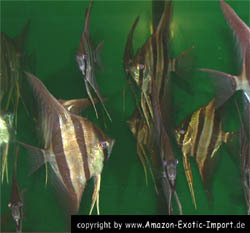 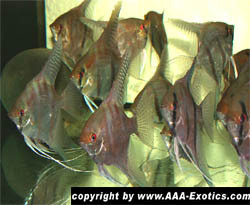 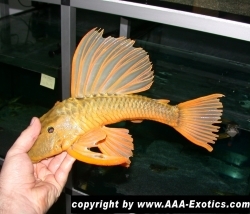 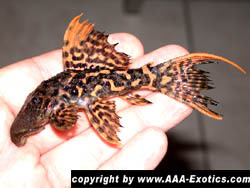 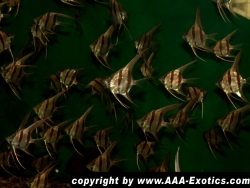 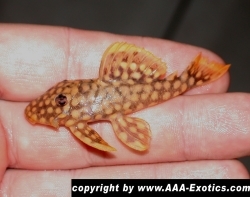 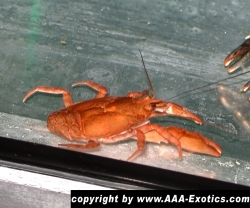 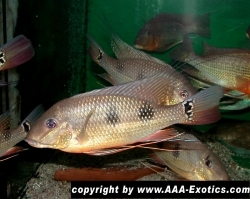 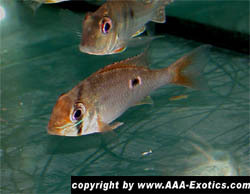 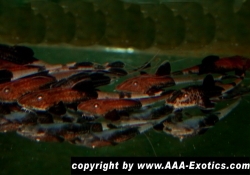 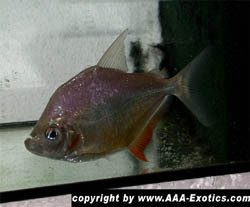 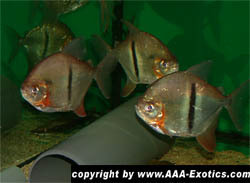 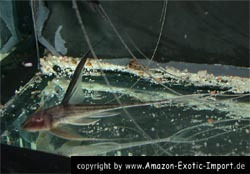 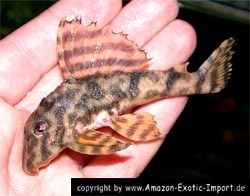 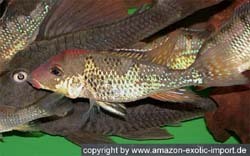 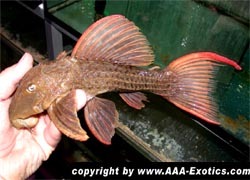 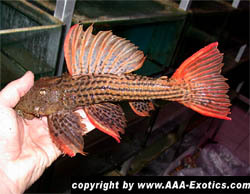 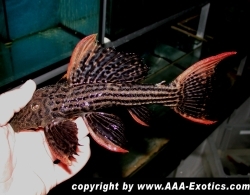 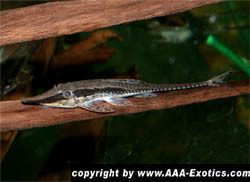 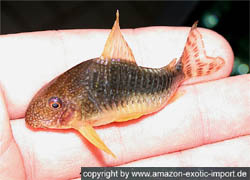 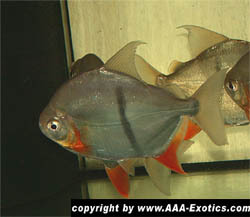 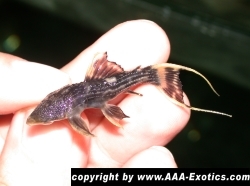 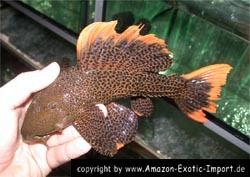 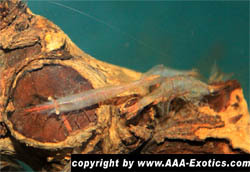 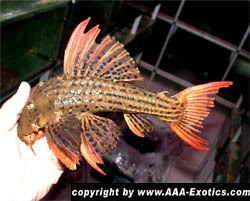 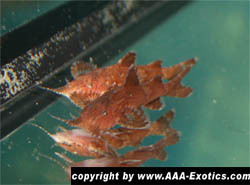 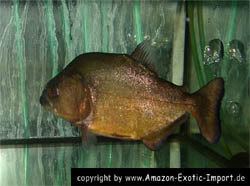 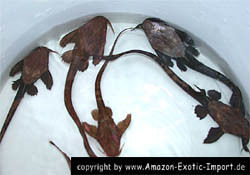 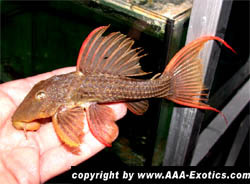 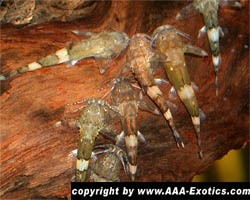 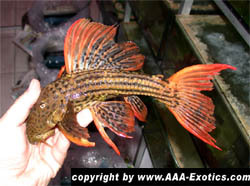 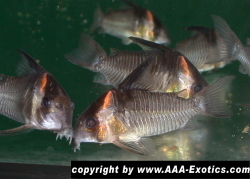 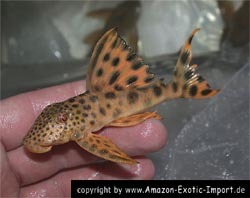 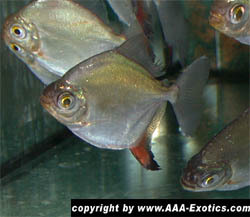 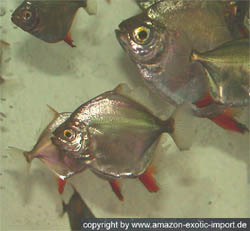 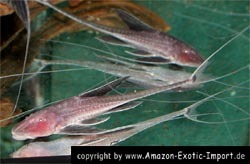 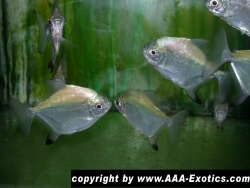 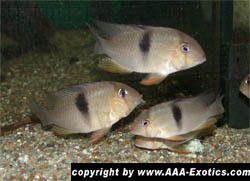 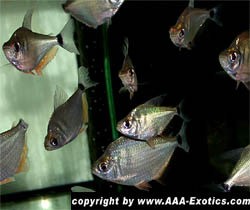 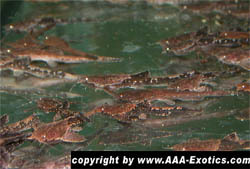 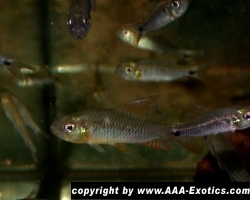 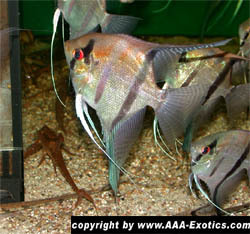 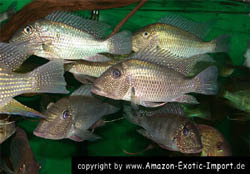 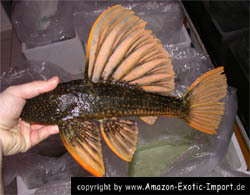 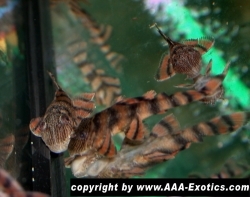 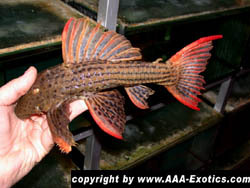 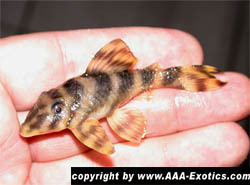 "Tapajos Red Head" Pterophyllum sp. 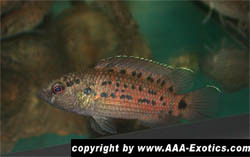 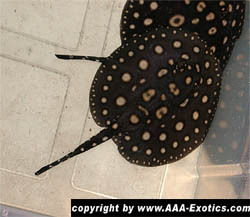 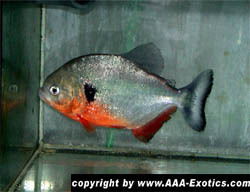 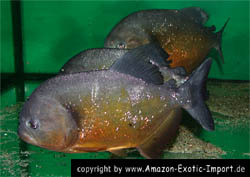 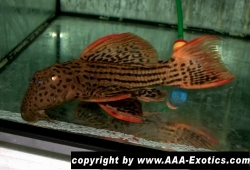 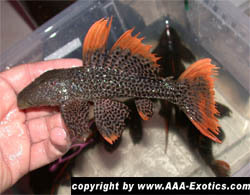 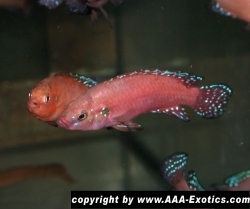 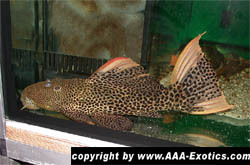 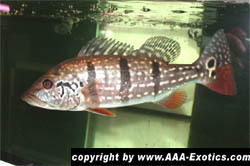 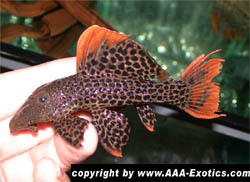 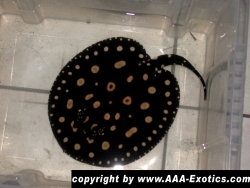 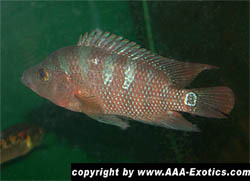 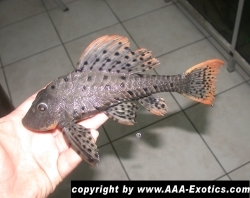 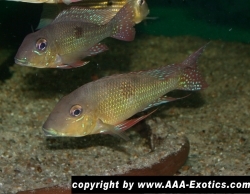 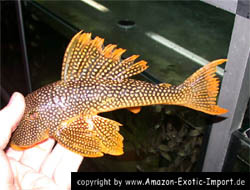 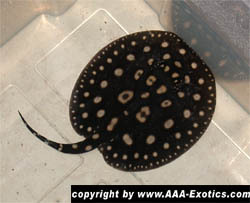 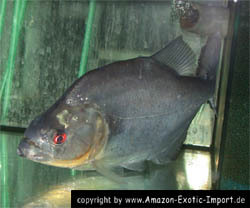 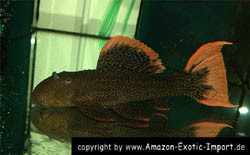 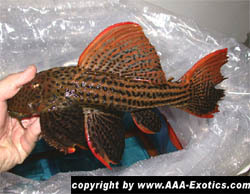 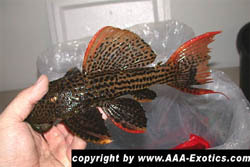 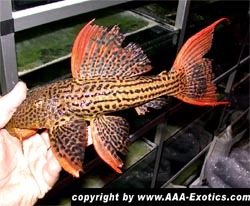 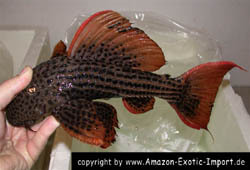 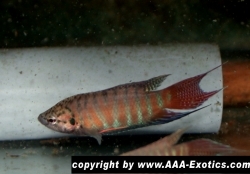 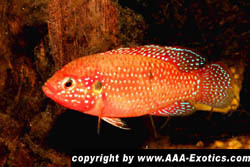 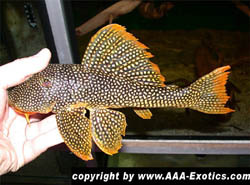 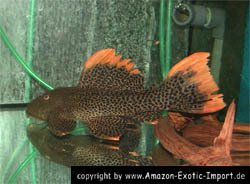 "Manacapuru Red Shoulder" L 405 Panaqolus sp. 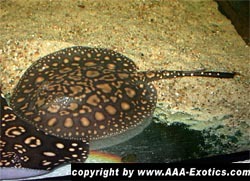 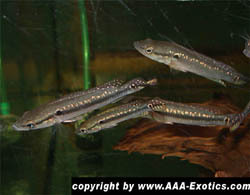 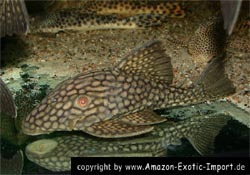 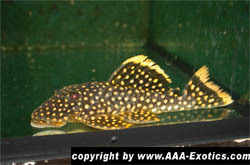 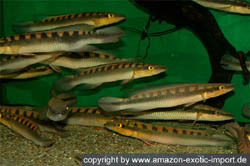 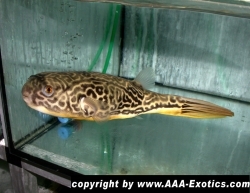 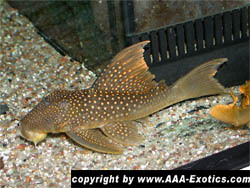 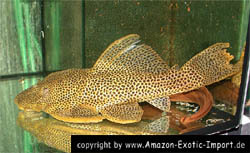 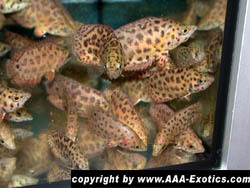 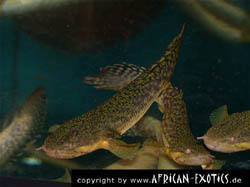 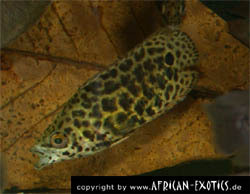 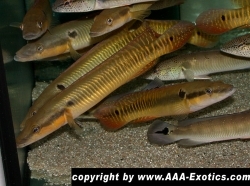 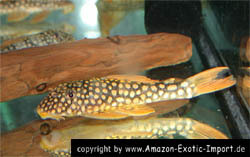 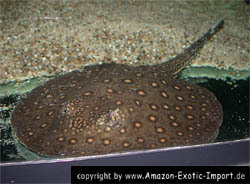 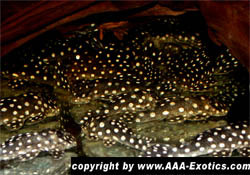 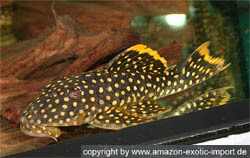 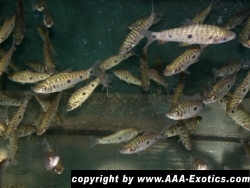 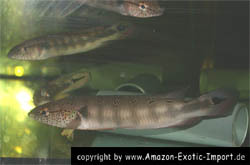 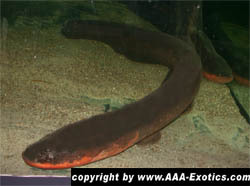 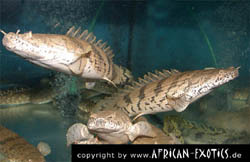 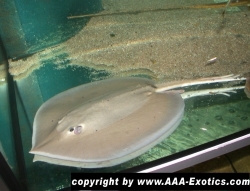 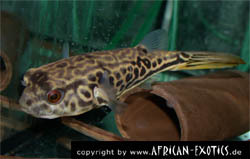 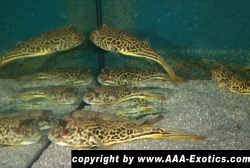 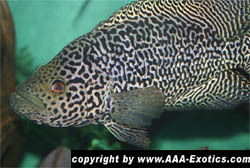 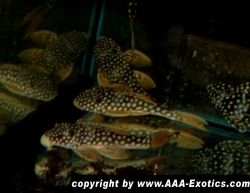 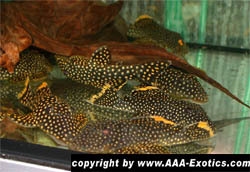 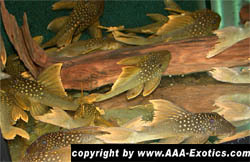 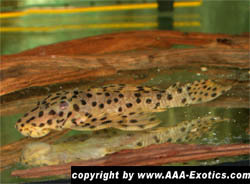 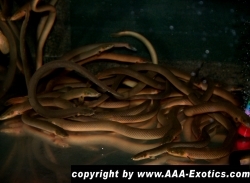 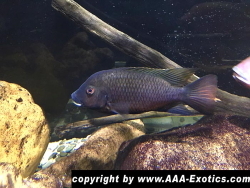 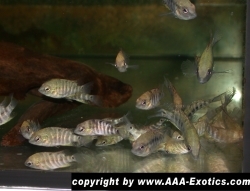 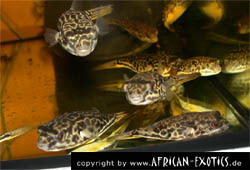 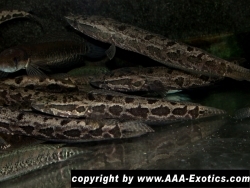 "Rio Anapu"
Myleus schomburgki "Wide Bar Blue Hook" Myleus schomburgki "Wide Bar Blue Hook" Myleus schomburgki "Wide Bar Red Blotch"
Distichodus affinis "Lefini River" Distichodus decemmaculatus Phenacogrammus aurantiacus "Jaune"
Corydoras panda NZ Corydoras sterbai NZ Rineloricaria sp. 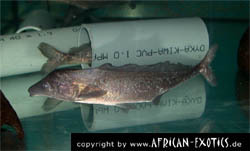 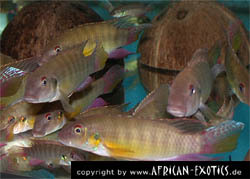 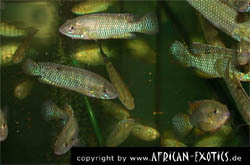 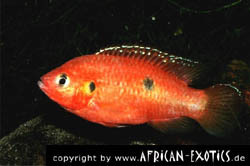 "Red"
Nanochromis parilus Polypterus lapradei "Koliba" Polypterus endlicheri "Guinea"
Polypterus delhezi Protopterus dolloi Protopterus aethiopicus "ALBINO"
Hemichromis sp. 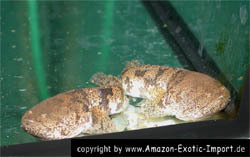 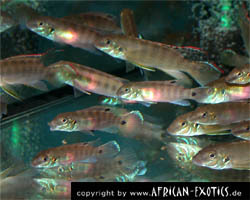 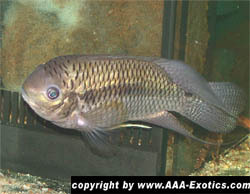 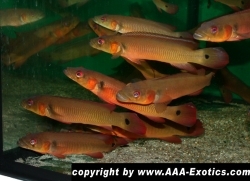 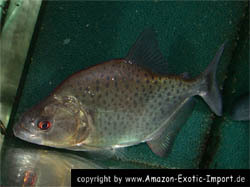 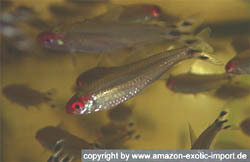 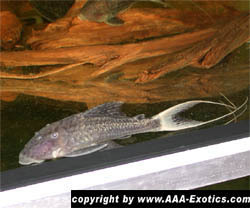 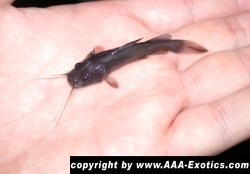 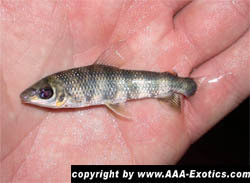 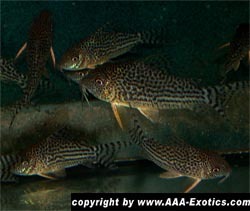 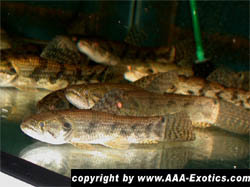 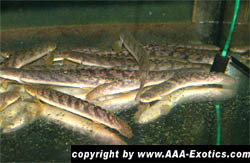 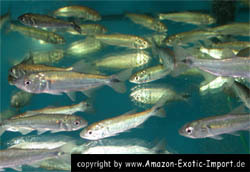 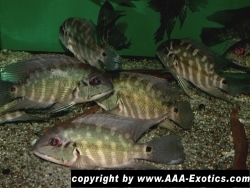 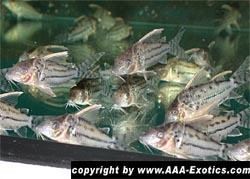 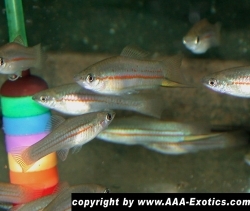 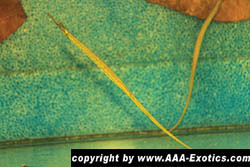 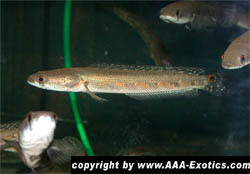 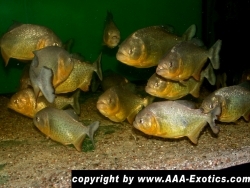 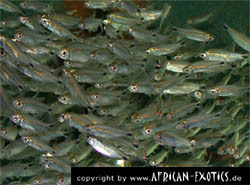 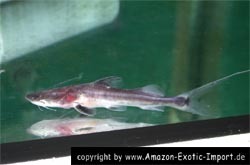 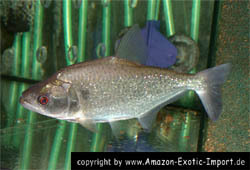 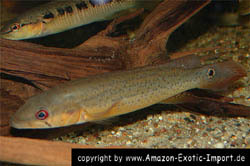 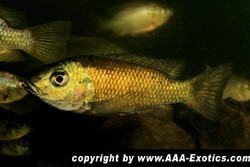 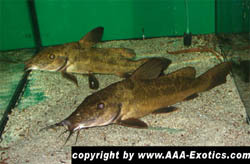 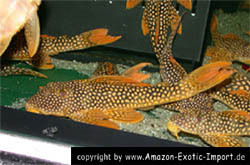 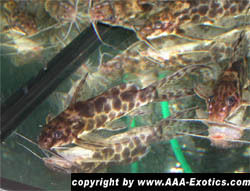 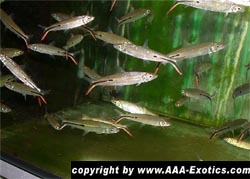 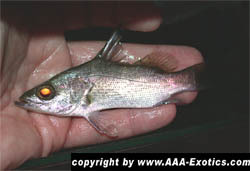 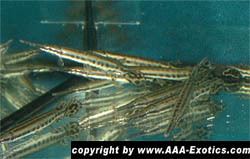 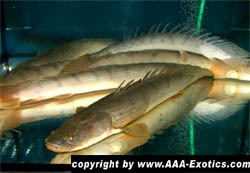 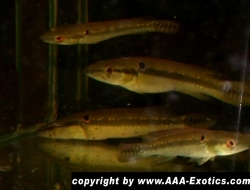 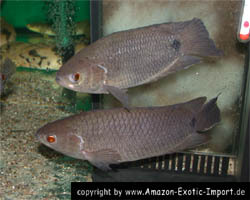 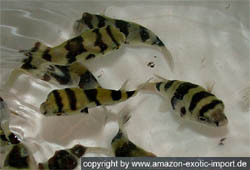 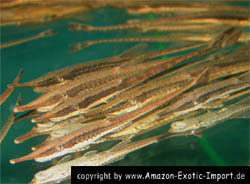 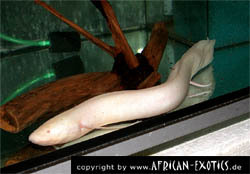 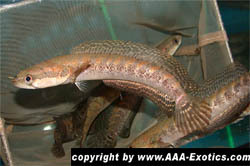 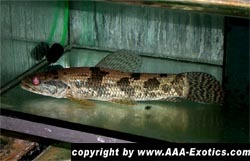 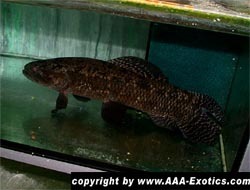 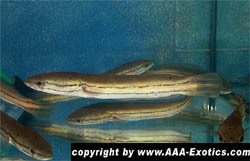 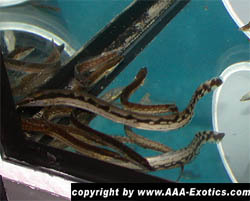 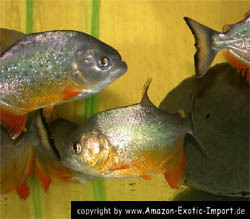 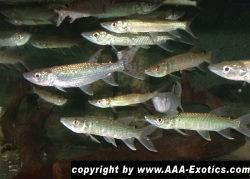 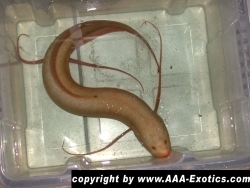 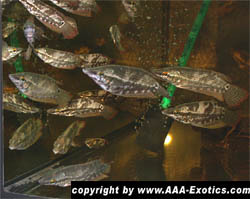 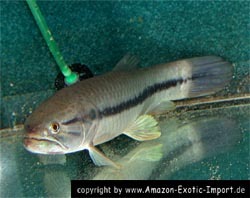 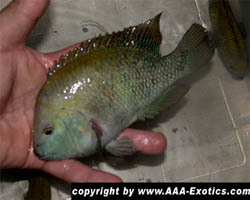 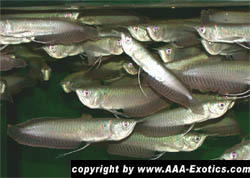 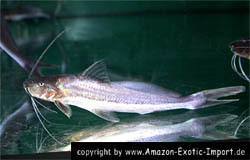 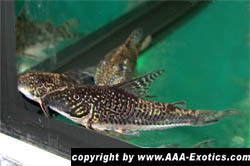 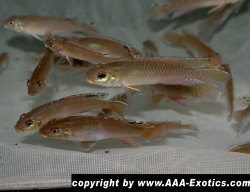 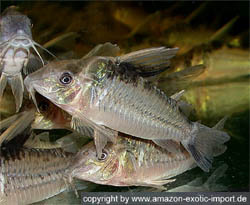 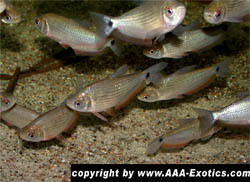 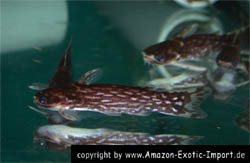 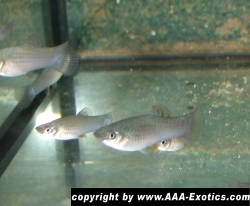 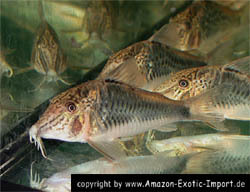 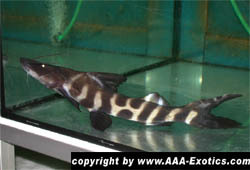 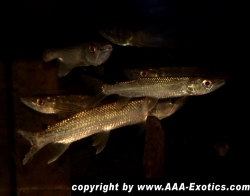 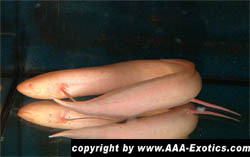 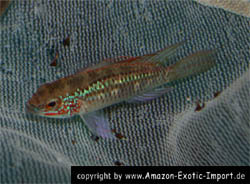 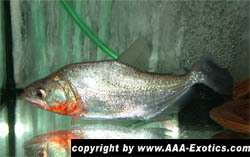 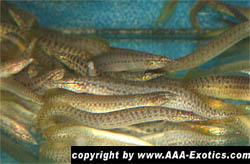 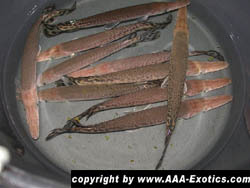 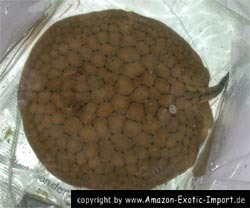 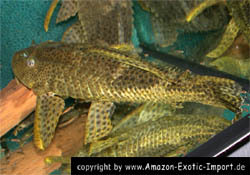 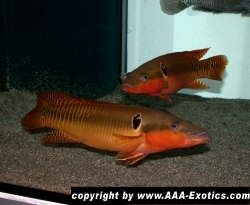 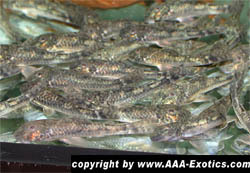 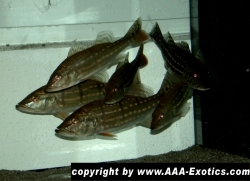 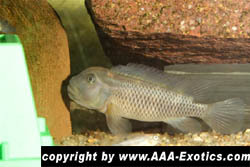 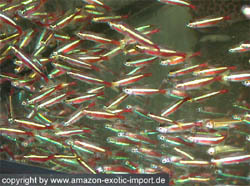 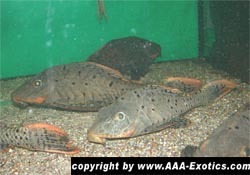 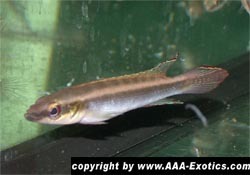 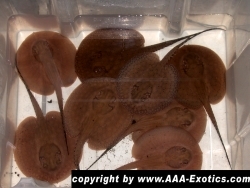 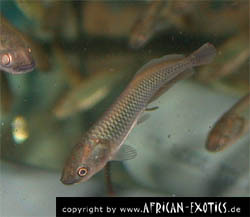 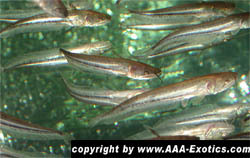 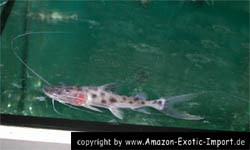 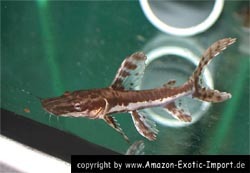 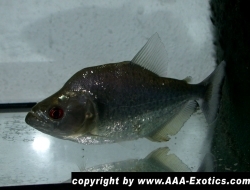 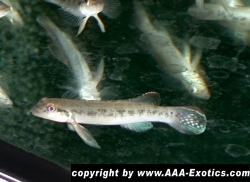 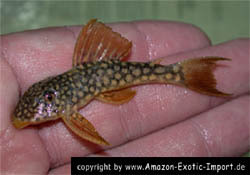 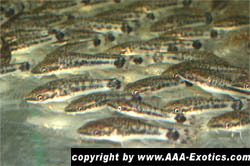 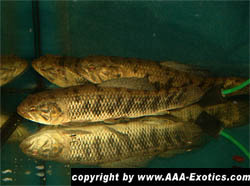 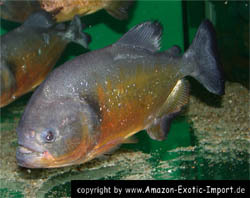 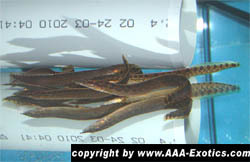 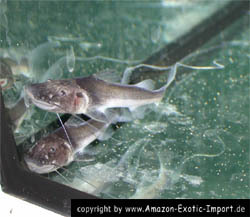 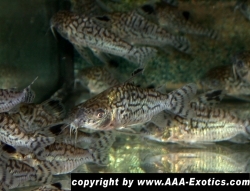 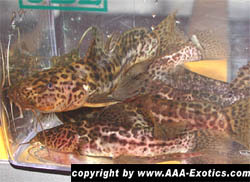 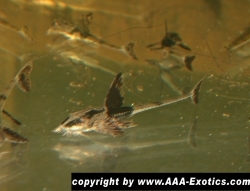 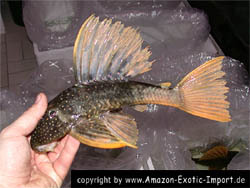 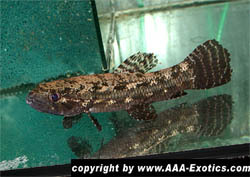 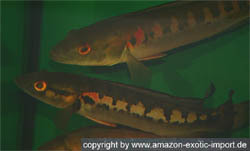 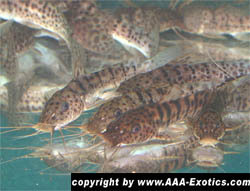 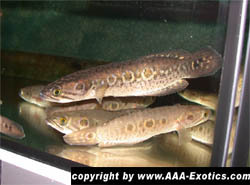 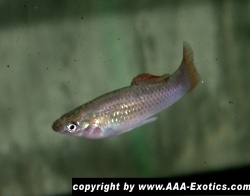 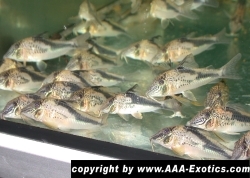 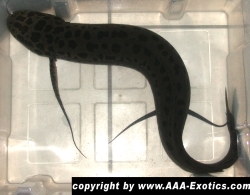 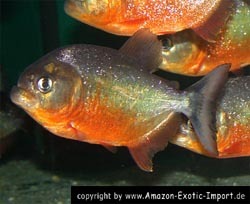 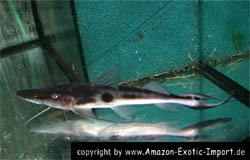 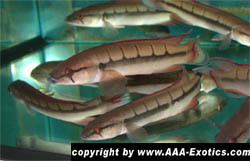 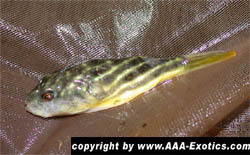 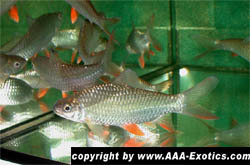 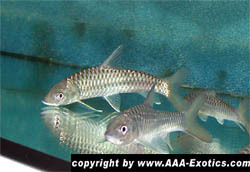 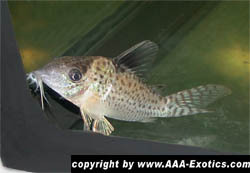 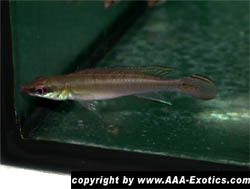 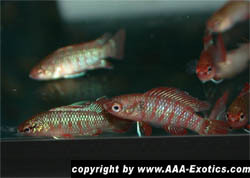 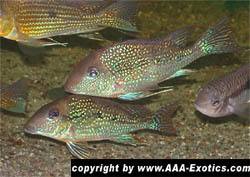 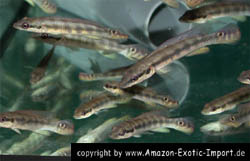 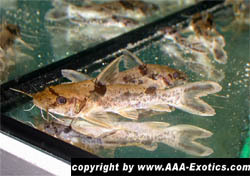 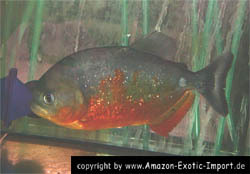 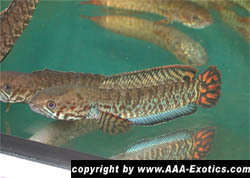 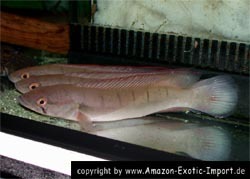 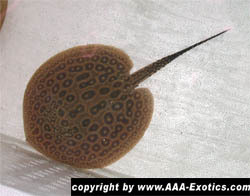 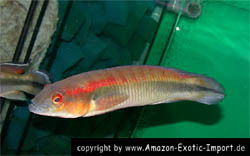 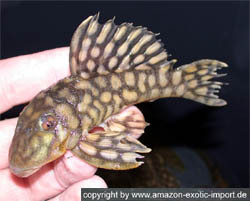 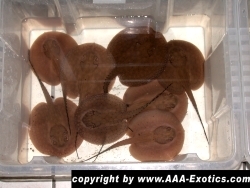 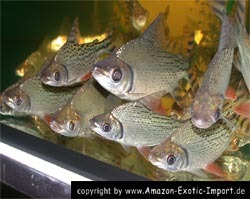 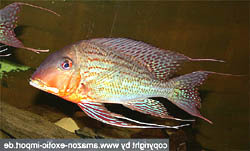 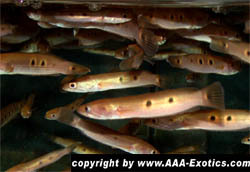 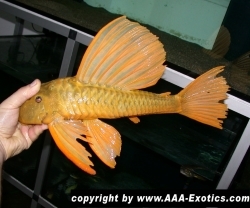 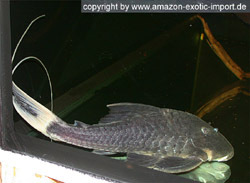 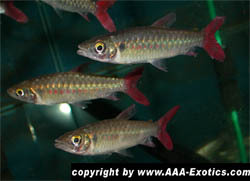 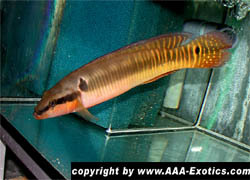 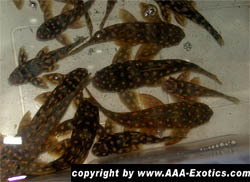 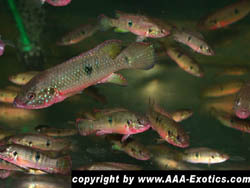 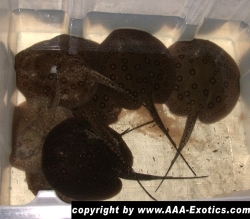 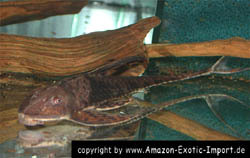 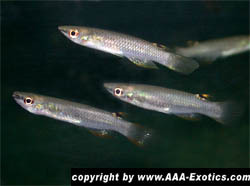 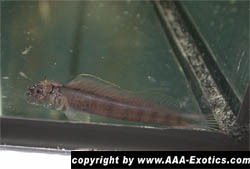 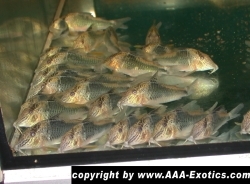 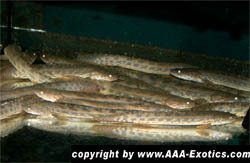 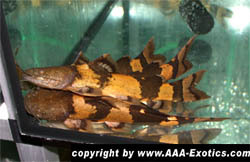 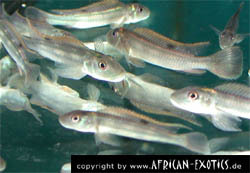 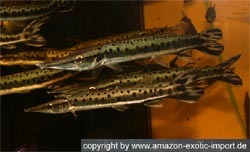 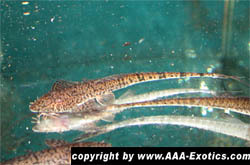 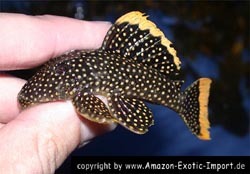 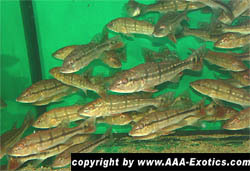 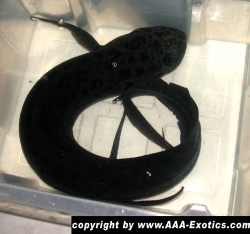 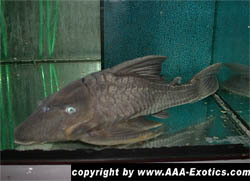 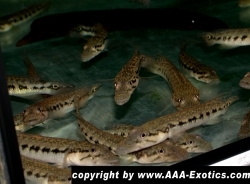 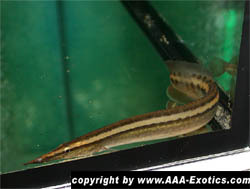 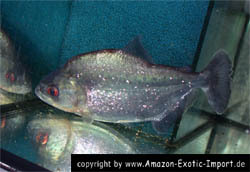 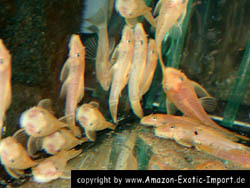 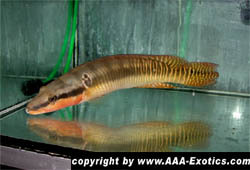 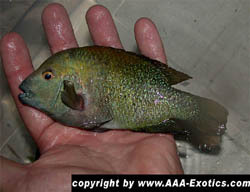 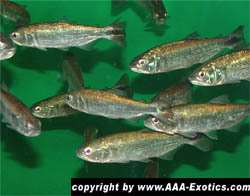 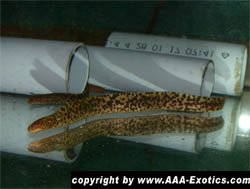 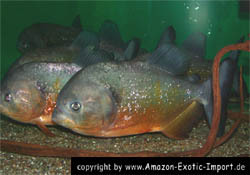 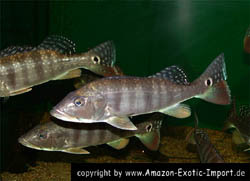 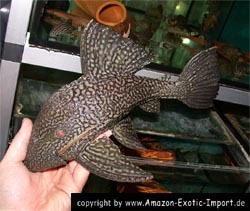 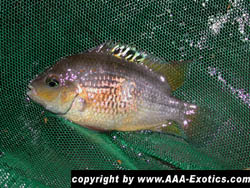 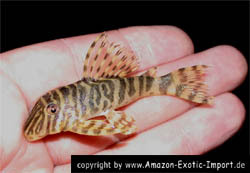 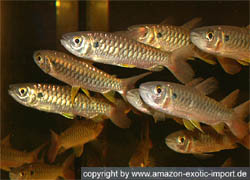 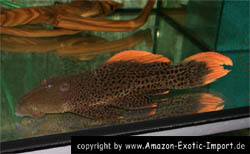 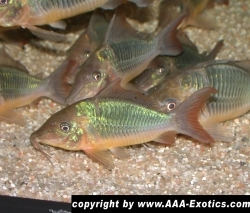 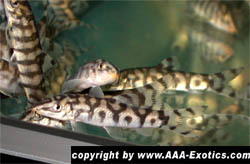 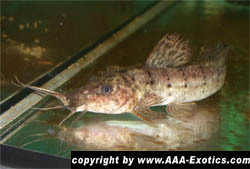 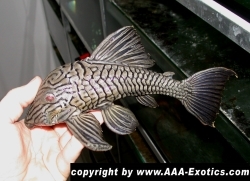 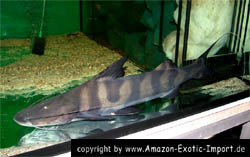 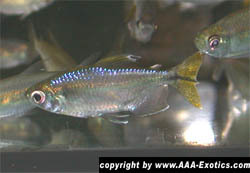 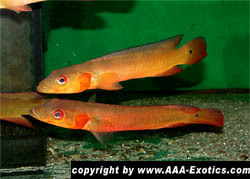 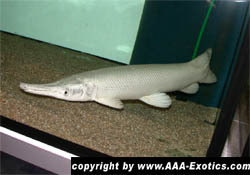 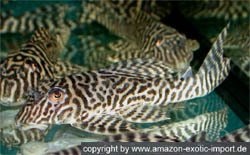 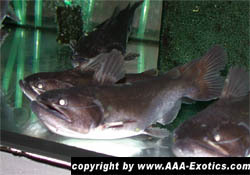 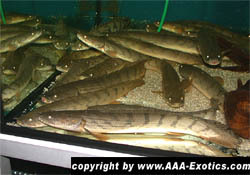 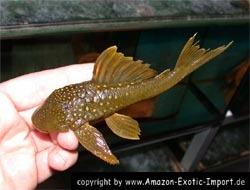 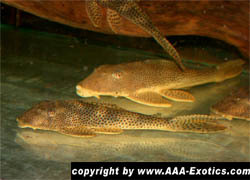 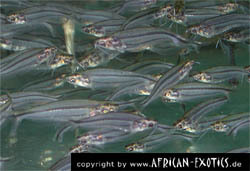 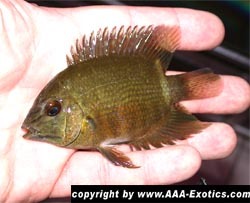 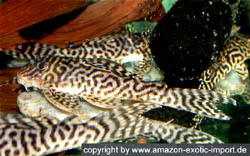 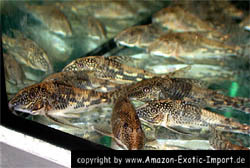 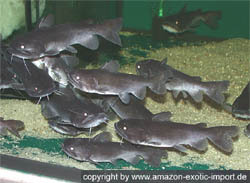 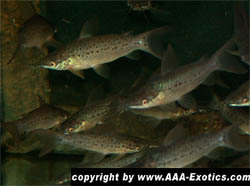 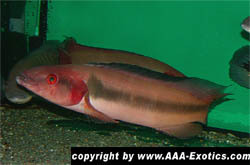 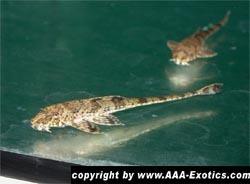 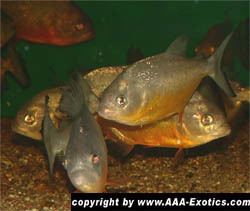 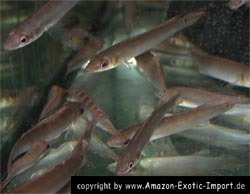 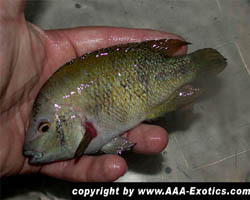 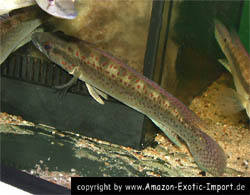 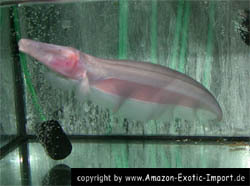 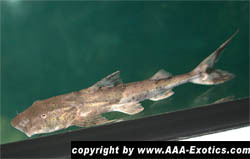 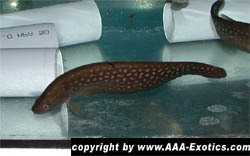 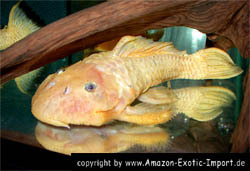 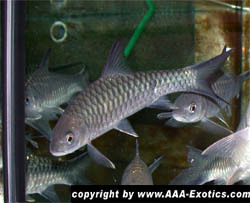 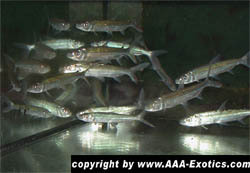 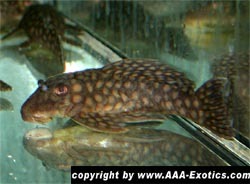 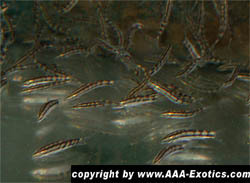 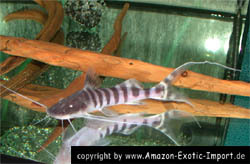 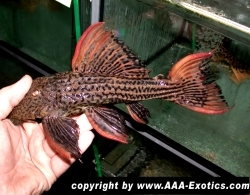 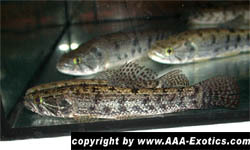 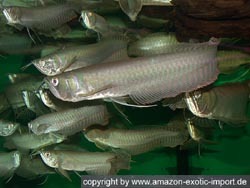 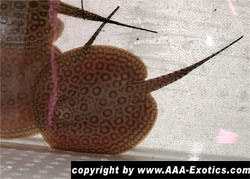 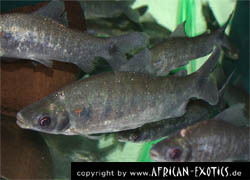 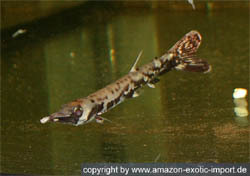 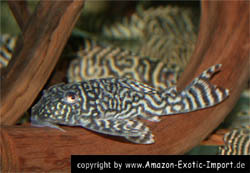 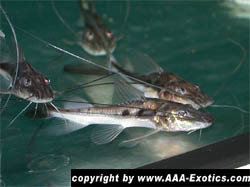 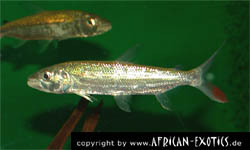 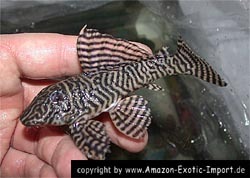 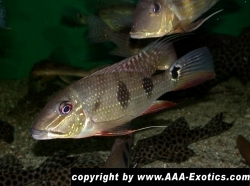 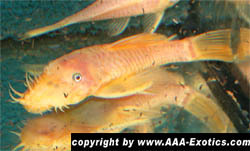 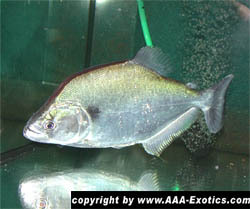 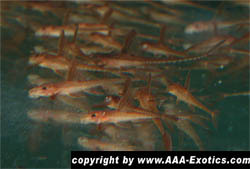 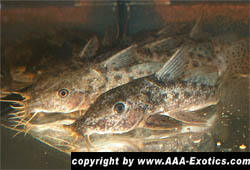 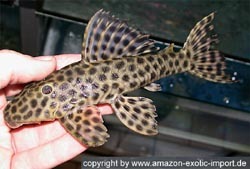 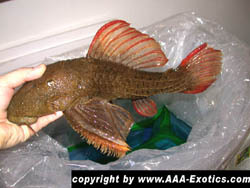 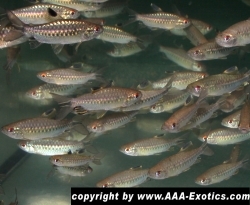 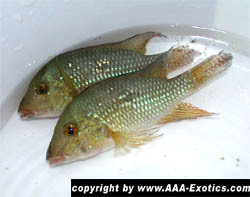 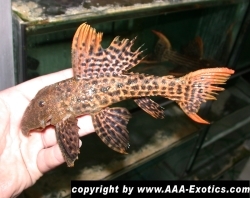 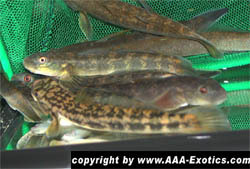 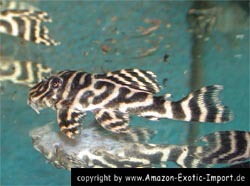 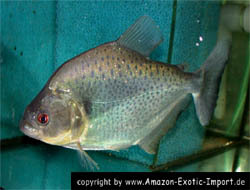 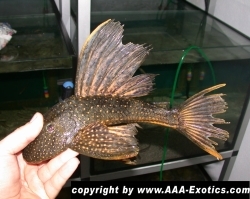 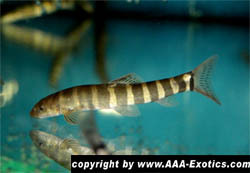 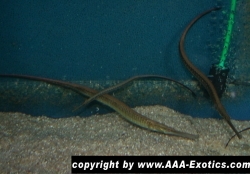 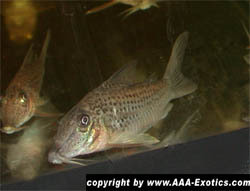 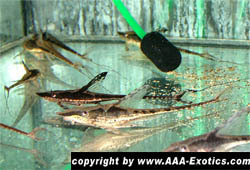 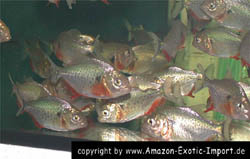 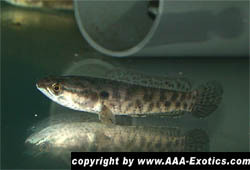 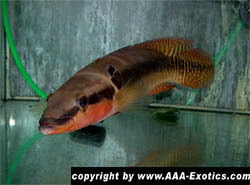 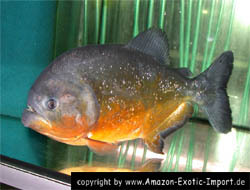 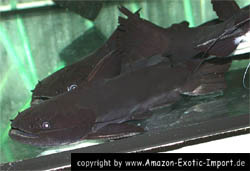 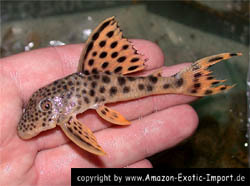 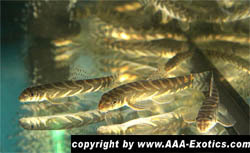 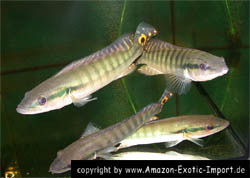 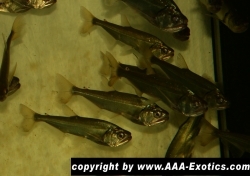 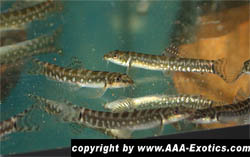 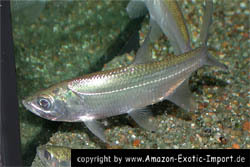 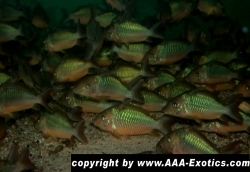 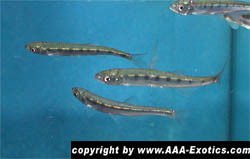 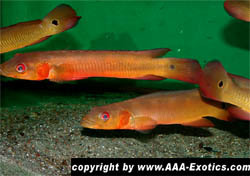 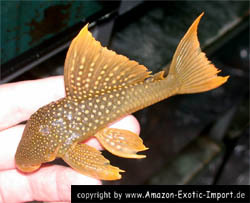 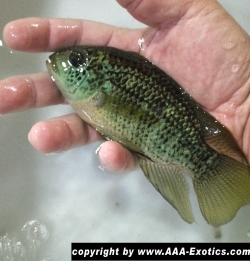 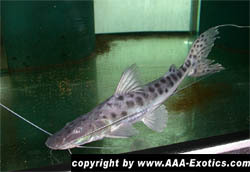 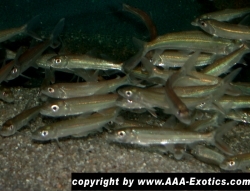 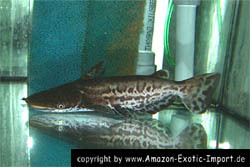 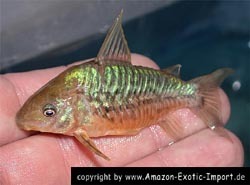 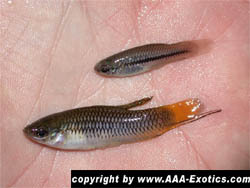 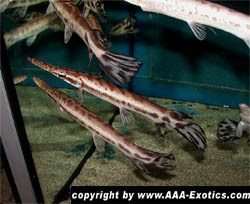 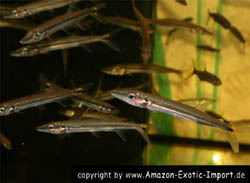 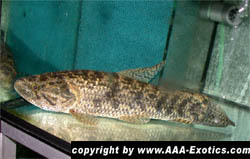 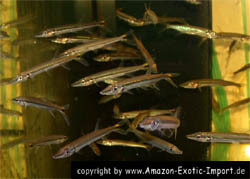 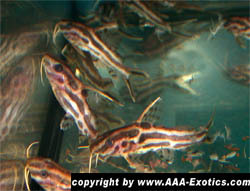 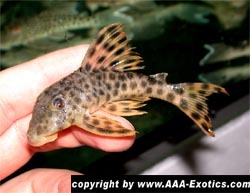 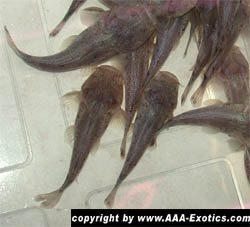 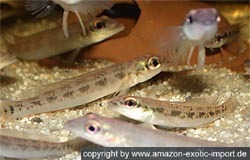 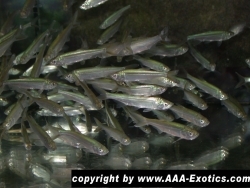 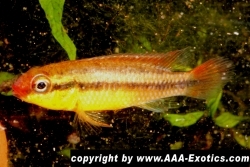 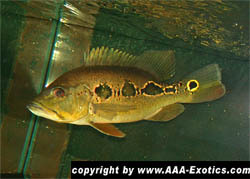 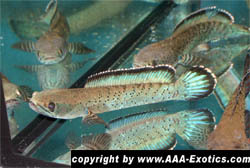 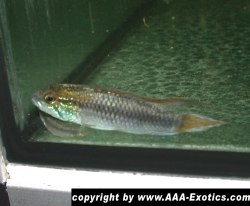 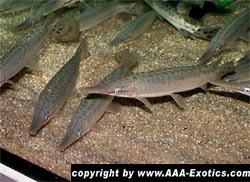 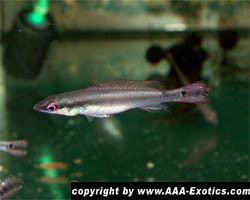 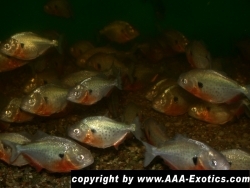 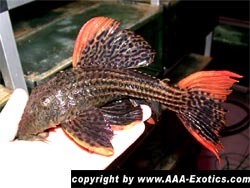 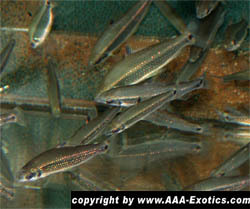 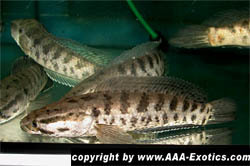 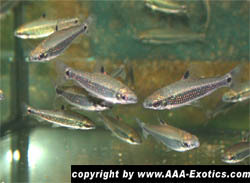 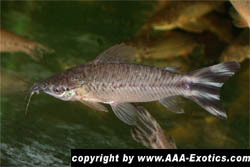 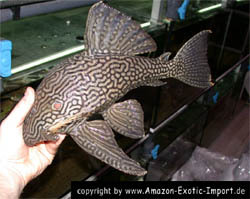 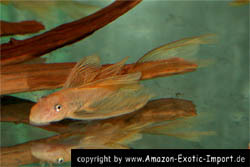 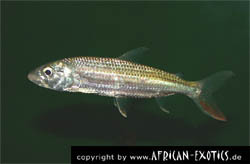 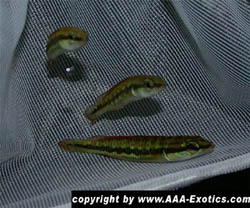 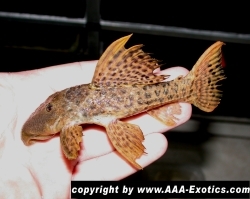 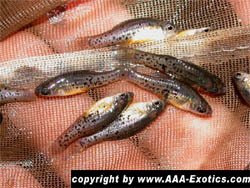 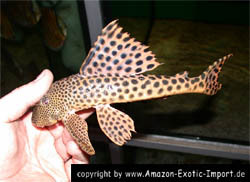 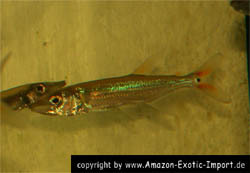 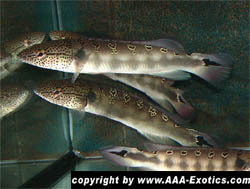 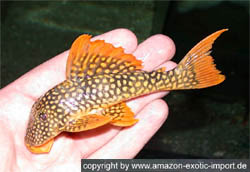 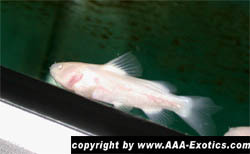 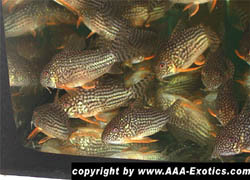 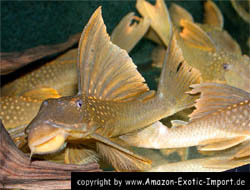 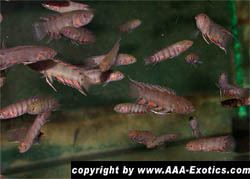 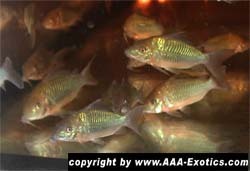 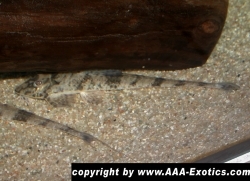 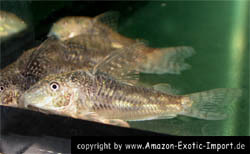 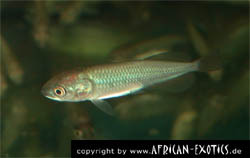 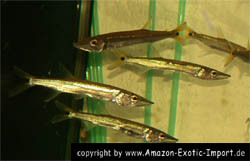 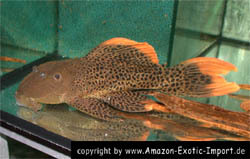 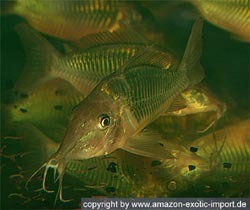 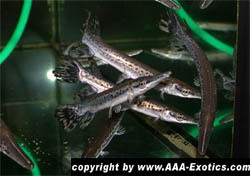 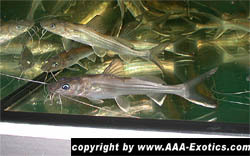 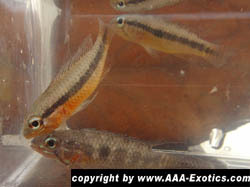 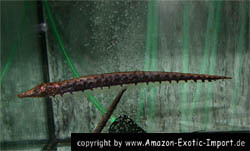 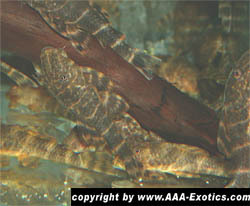 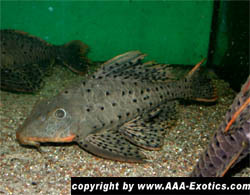 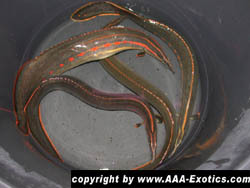 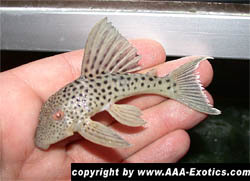 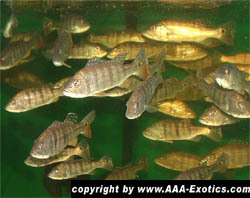 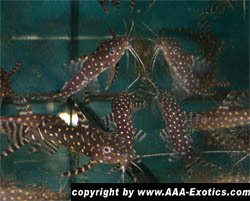 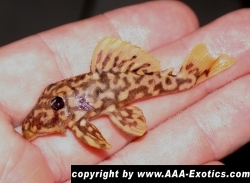 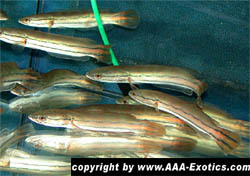 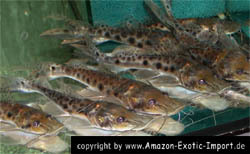 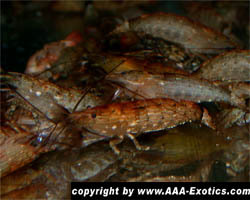 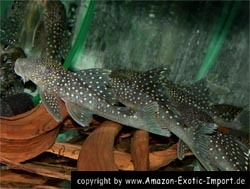 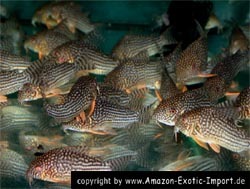 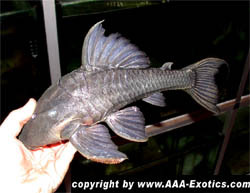 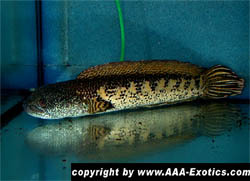 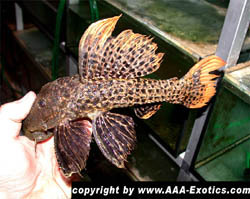 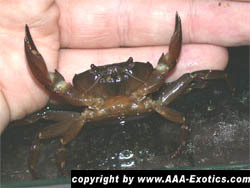 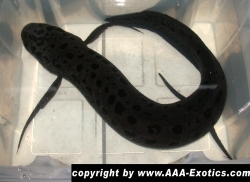 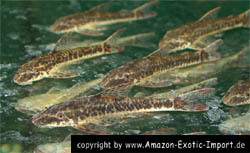 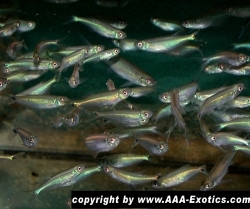 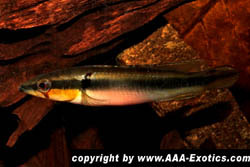 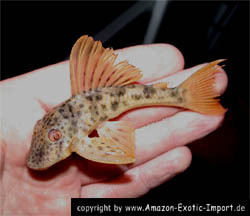 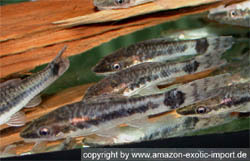 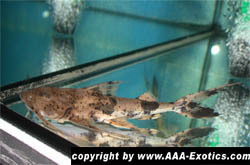 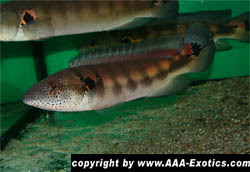 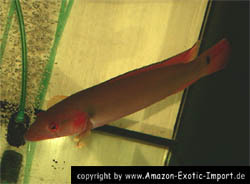 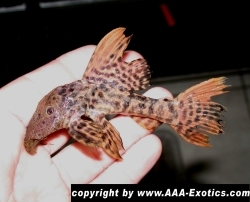 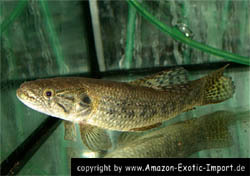 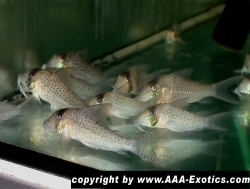 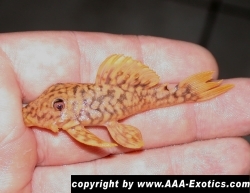 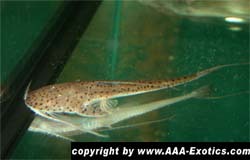 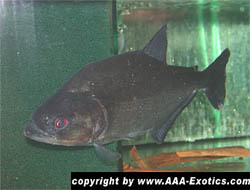 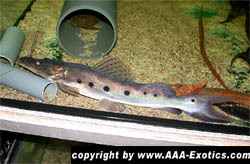 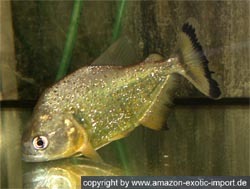 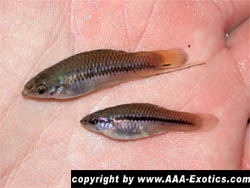 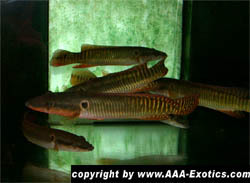 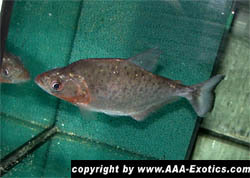 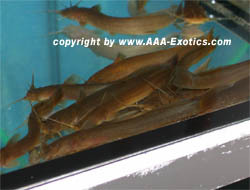 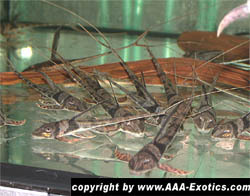 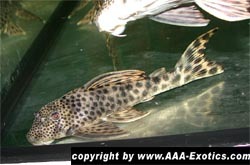 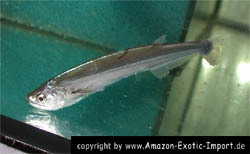 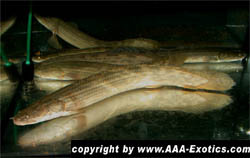 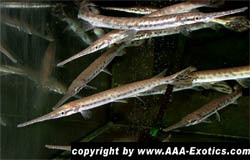 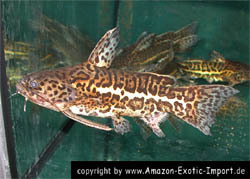 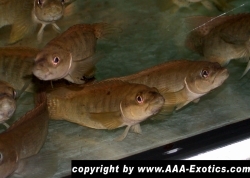 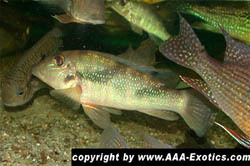 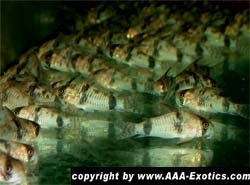 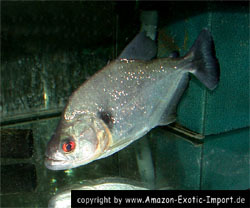 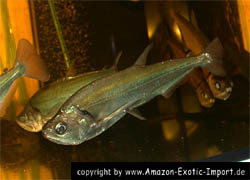 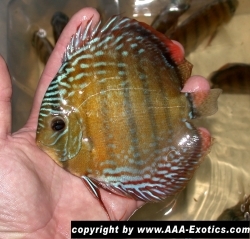 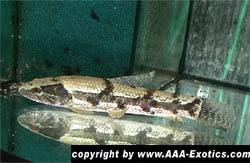 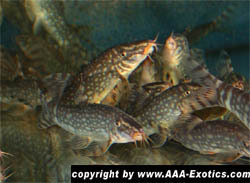 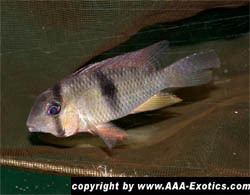 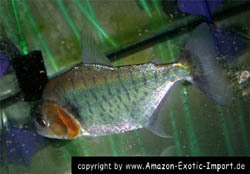 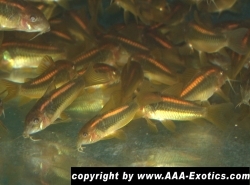 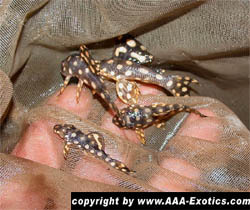 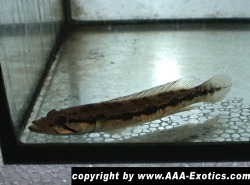 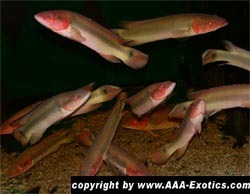 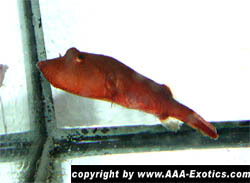 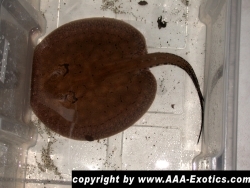 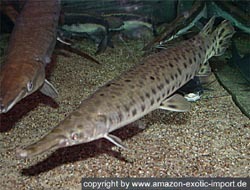 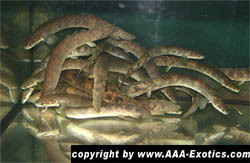 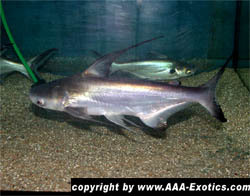 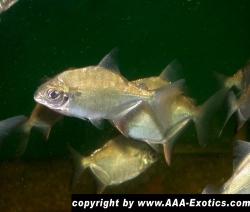 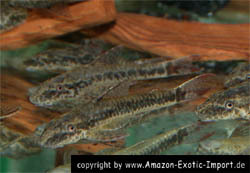 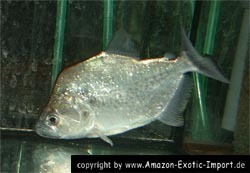 "Gabun" Hemichromis letourneauxi "Lake Maryut" Hemichromis sp. 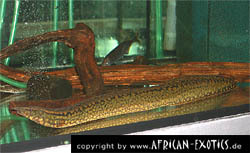 "Benin"